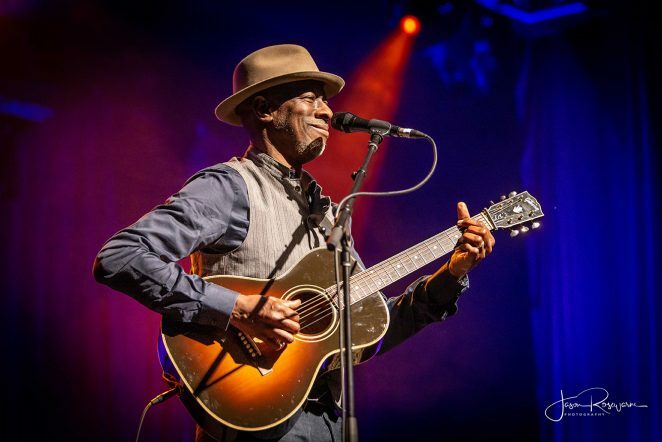 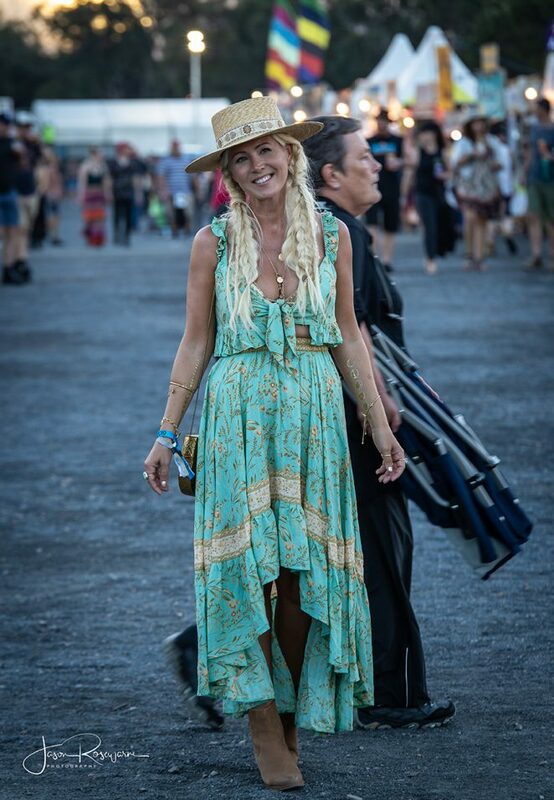 The final day of Bluesfest always comes with mixed blessings. 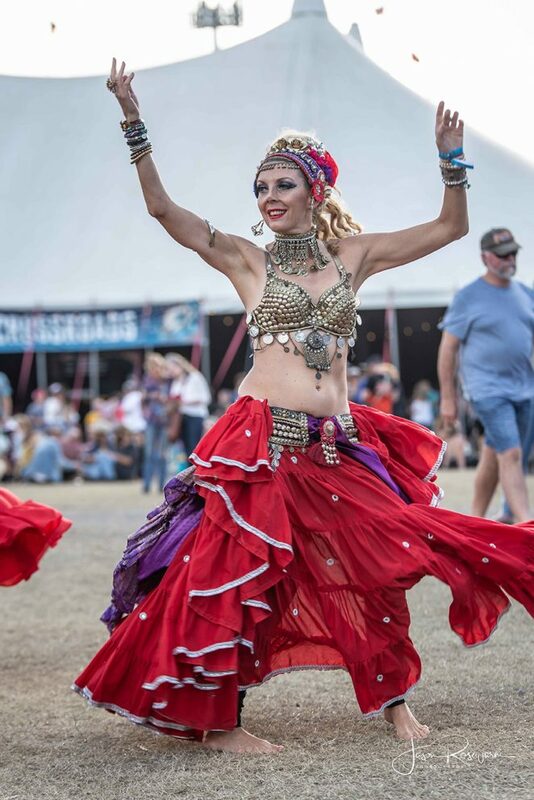 One one hand you never want it to end, on the other … five days of flitting between stages can take its toll on you physically. 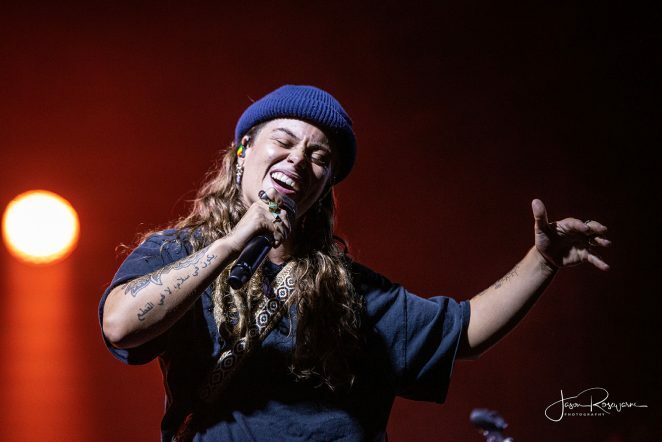 Day 5 is also chance to catch up on those acts you’ve heard so much about from other festival-goers but haven’t had the opportunity to see for yourself. 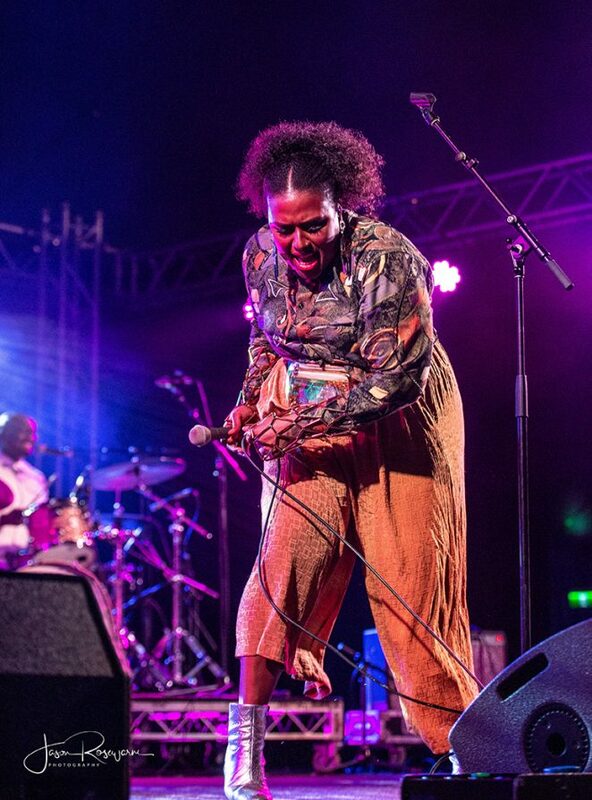 Mama Mihirangi and The Mareikura were back again and were definitely one of the most talked about bands at the event. 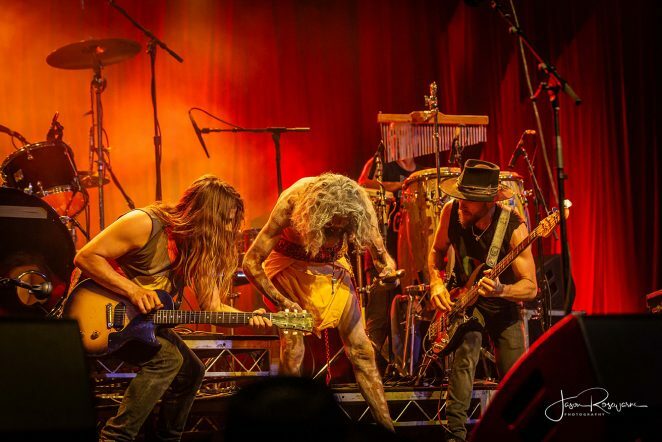 Visually stunning and beautiful sounding, ur photographer Jason Rosewarne had a ball shooting them. 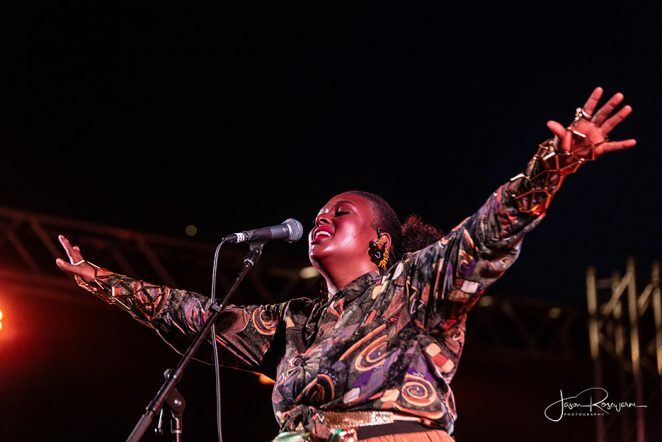 Thando has been gaining much attention in Melbourne with her huge voice and infectious smile, it was Bluesfest’s turn to enjoy this great entertainer. 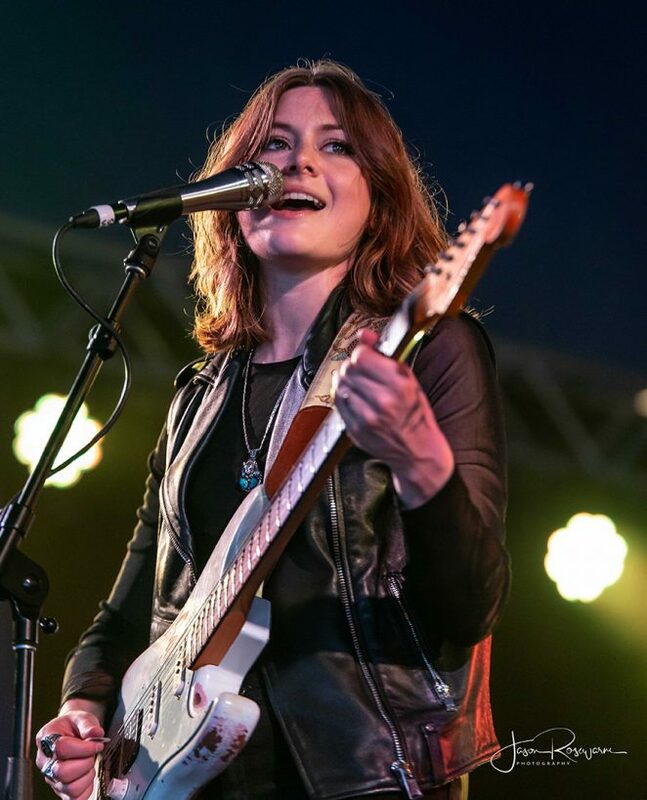 Caiti Baker was sounding mighty melodic and soulful too under the Delta tent. 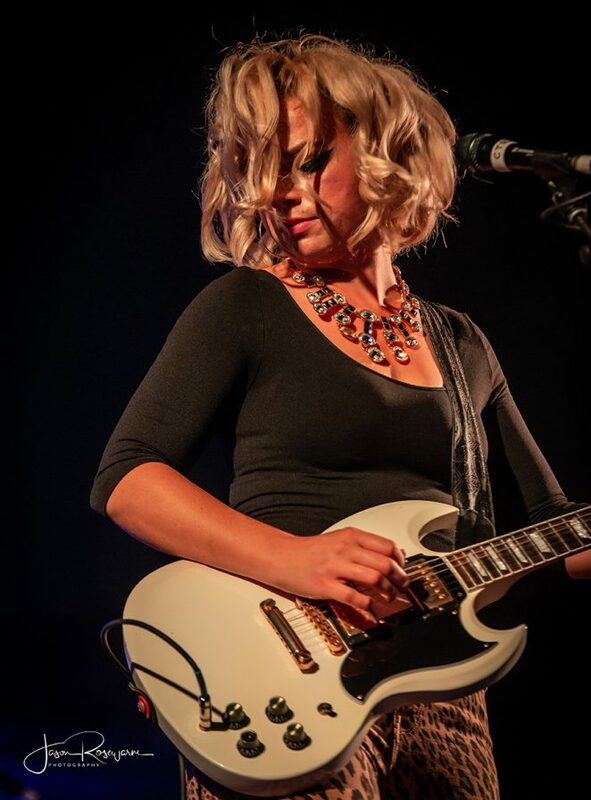 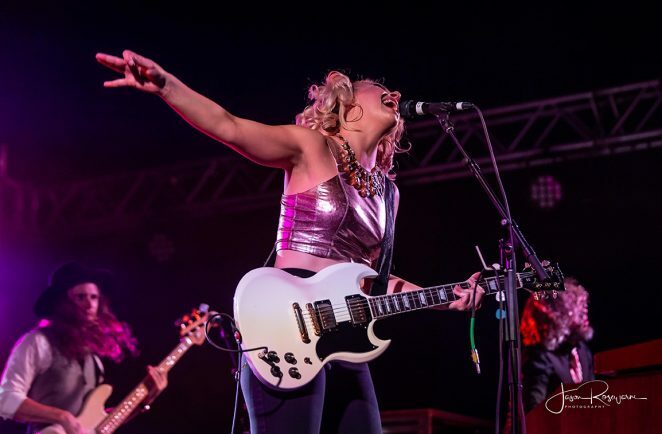 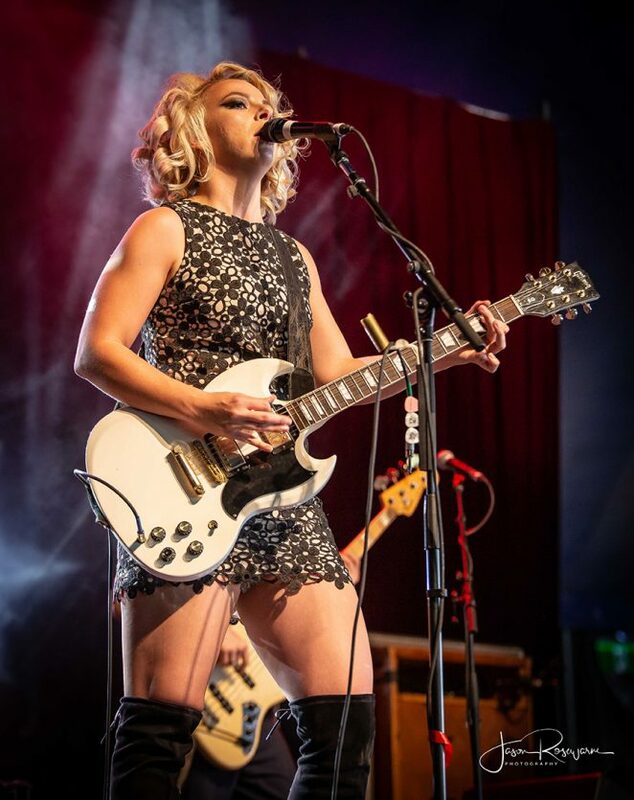 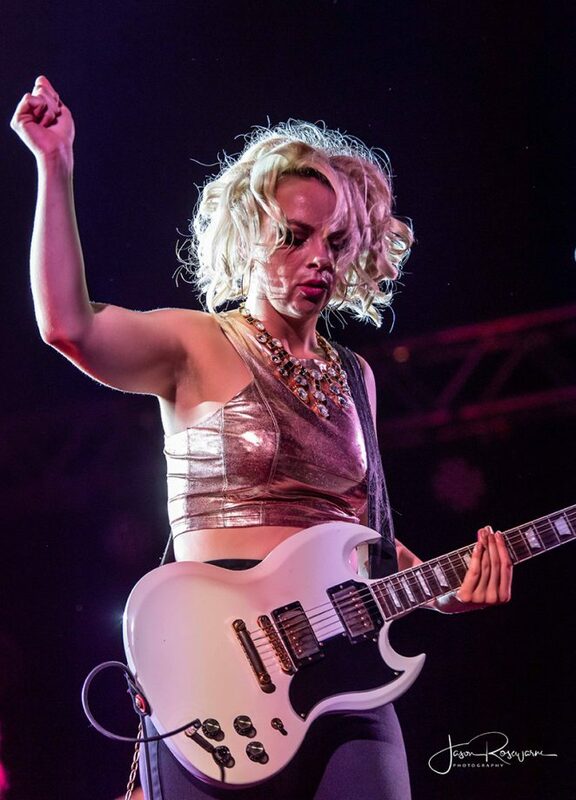 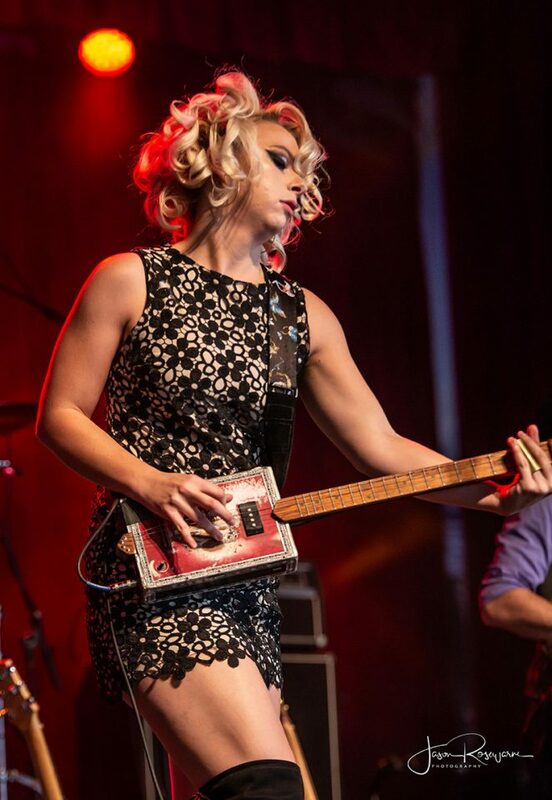 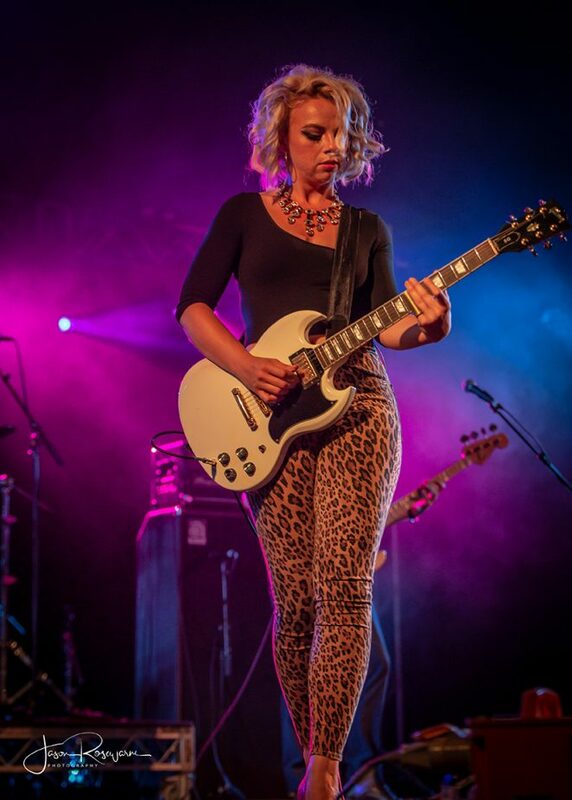 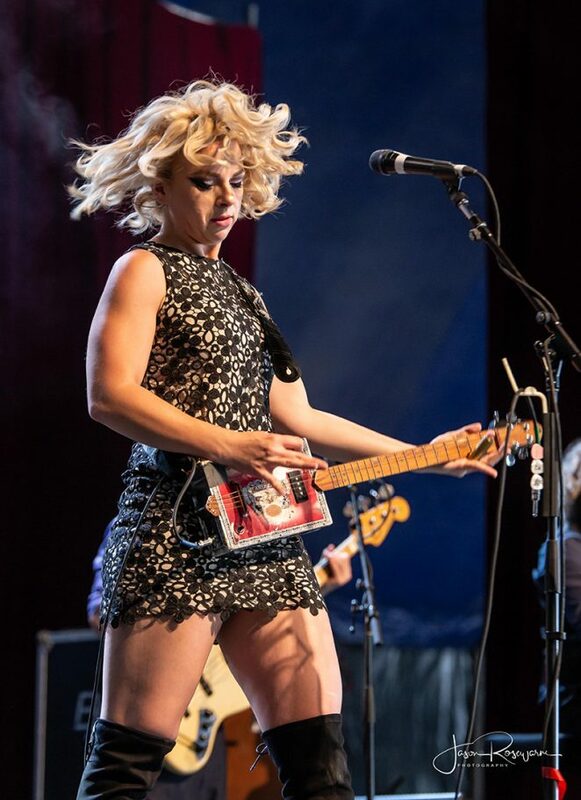 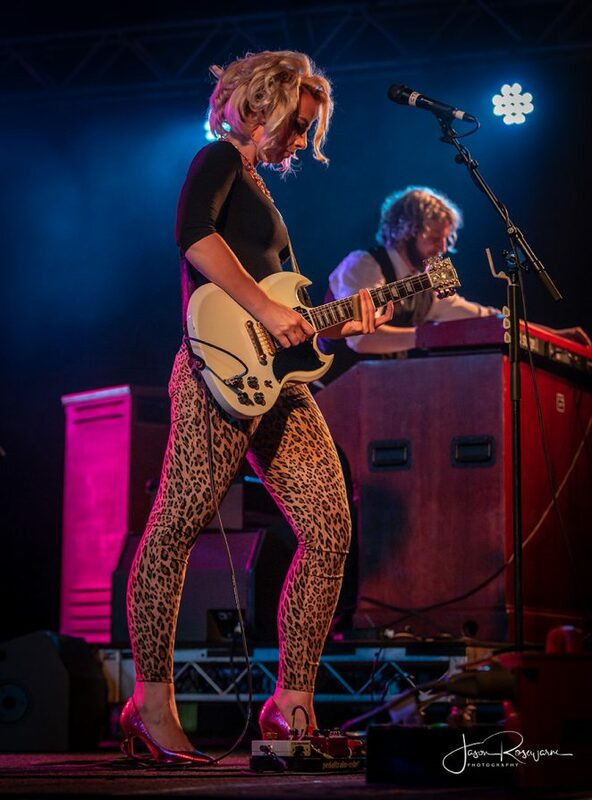 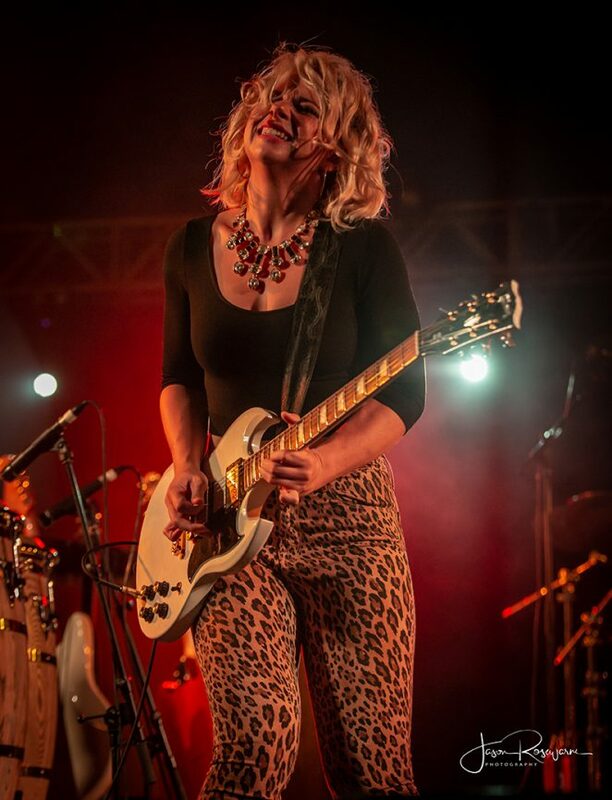 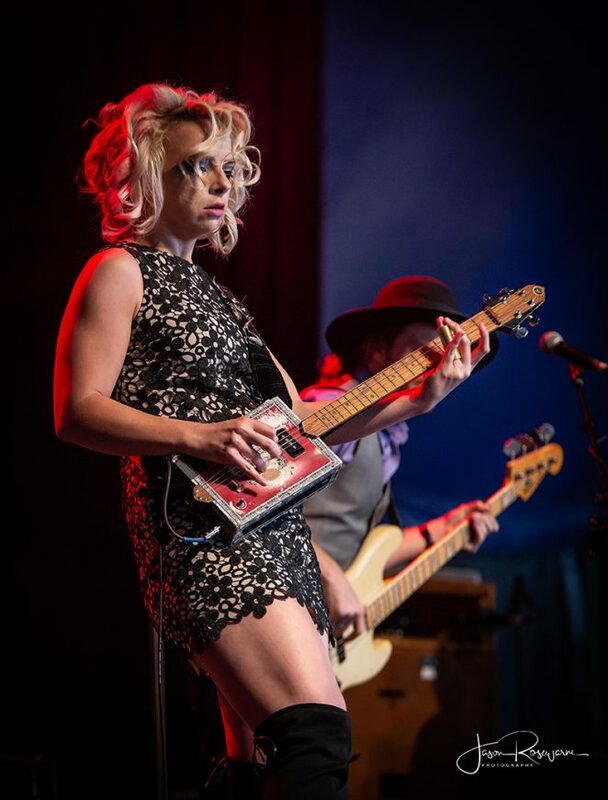 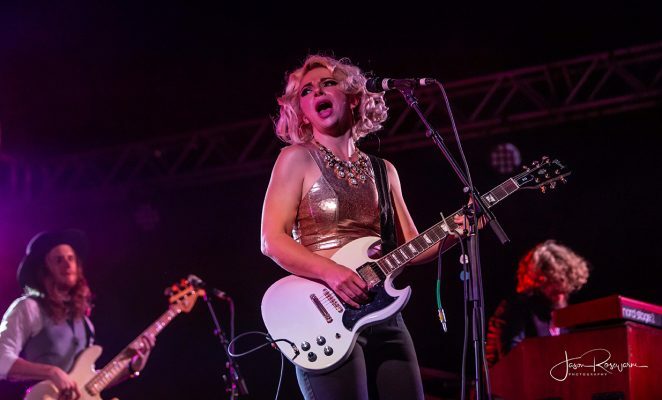 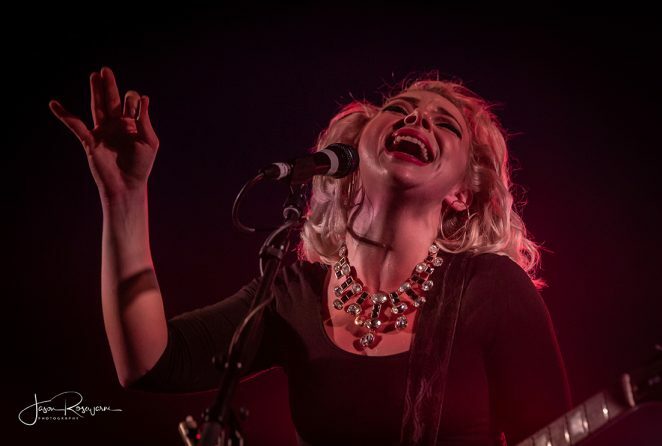 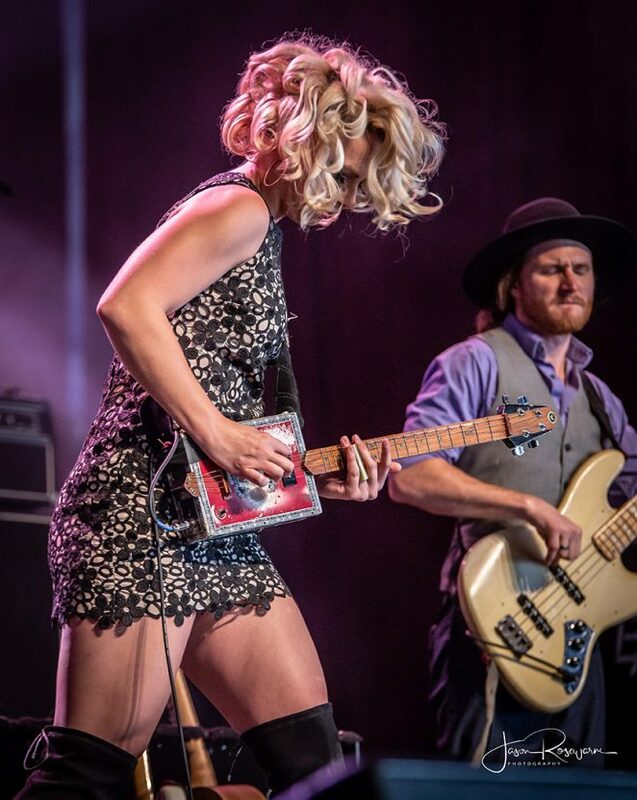 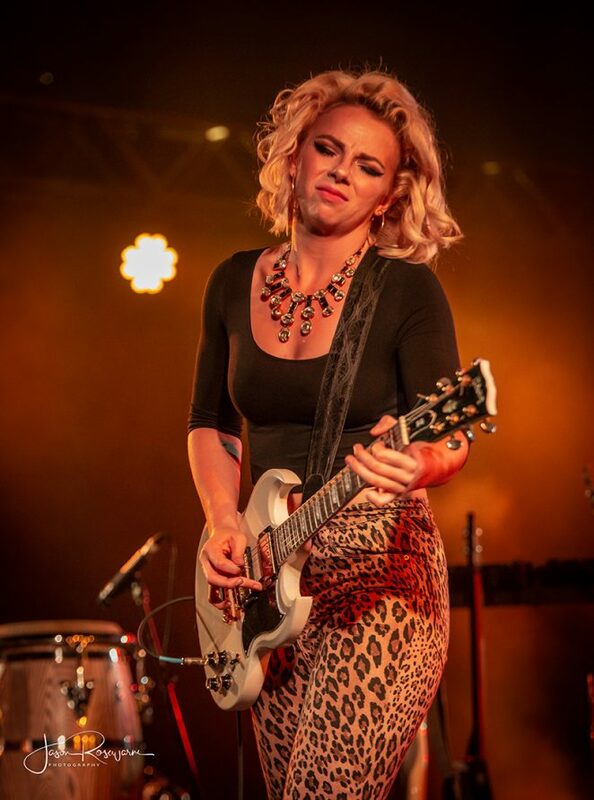 Samantha Fish and band used their final performance to confirm that they were one of the most popular bands at the festival this year, with their powerful rock, soul and blues favours. 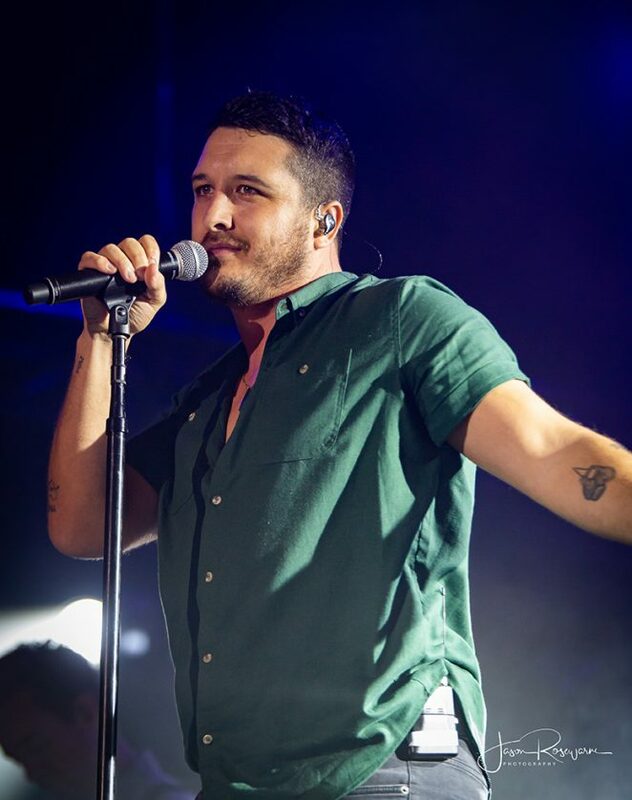 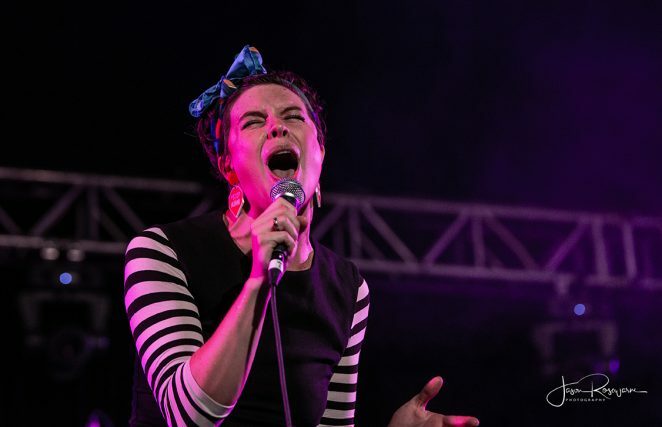 As Samantha told Australian Musician, she’s begging to come back again. 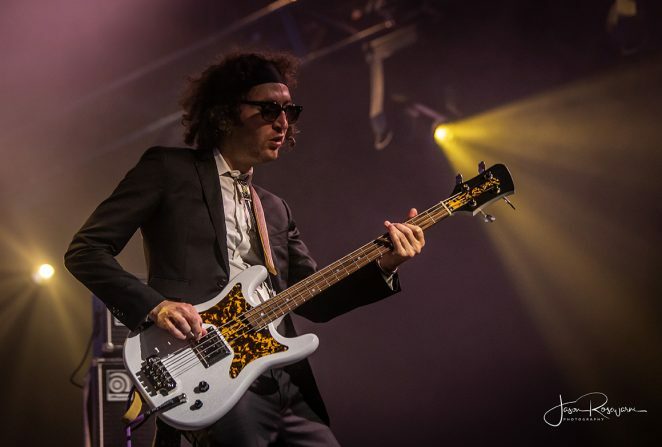 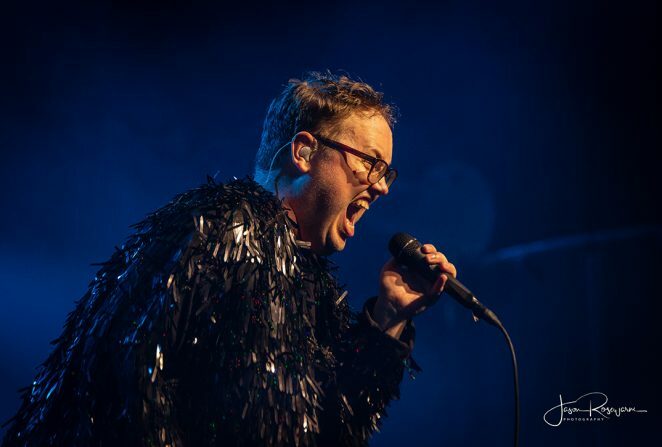 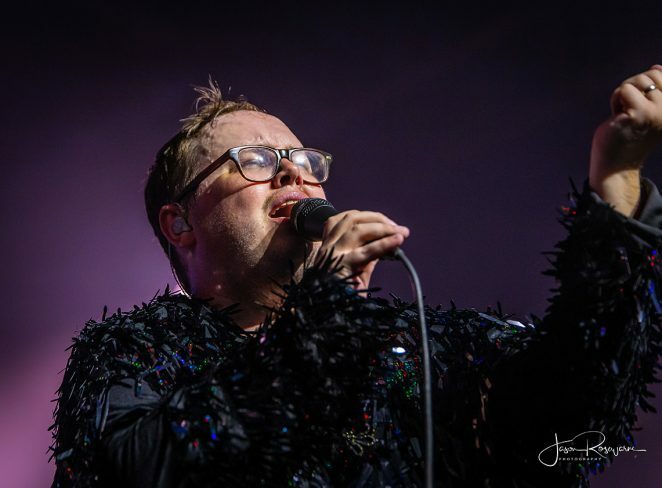 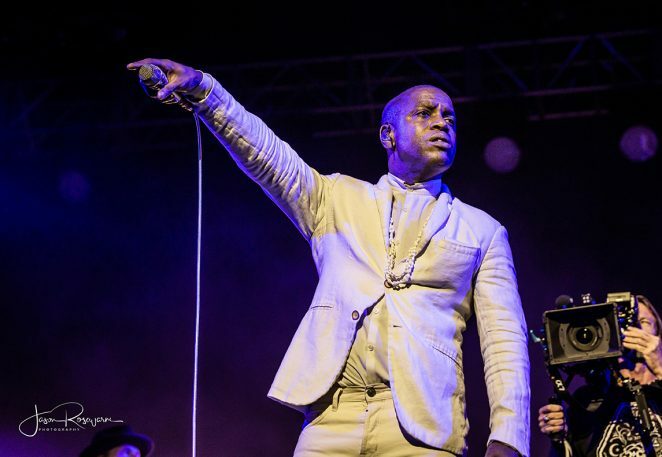 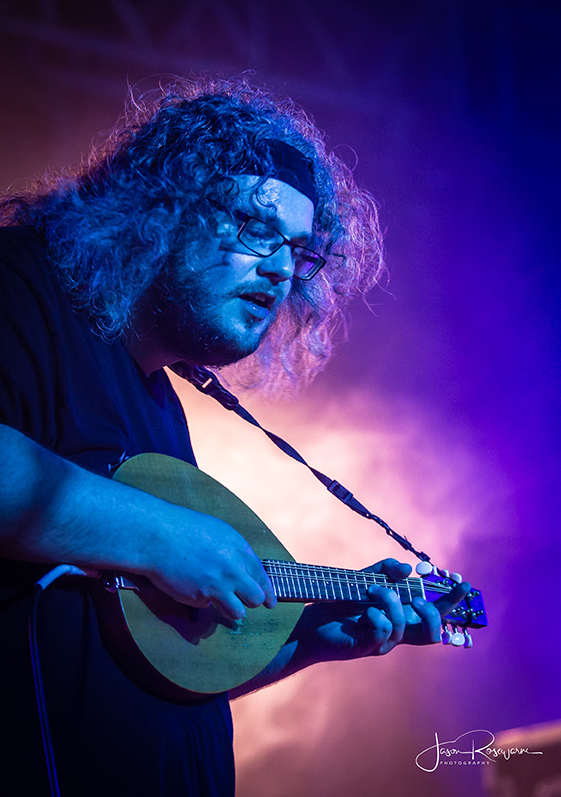 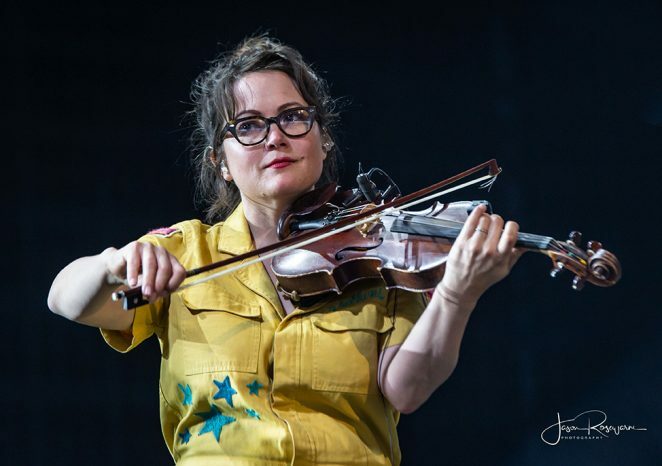 St Paul and The Broken Bones are eternally a Bluesfest favourite and a large crowd had come to see their farewell Australian performance for 2019. 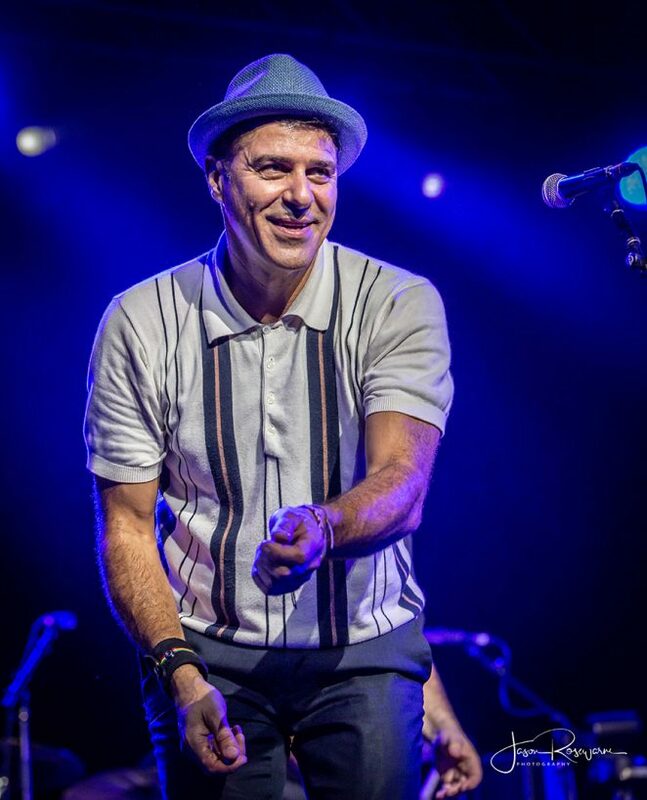 While early in the set, frontman Paul Janeway’s energy seemed a tad low, little by little he ramped it up and ended up out in the crowd by the mixing desk to a huge ovation. 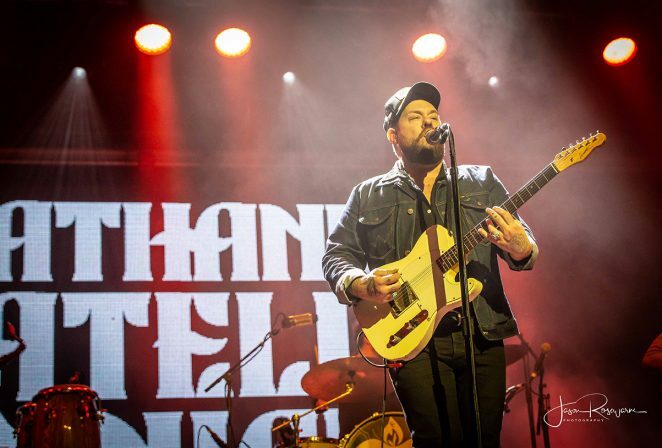 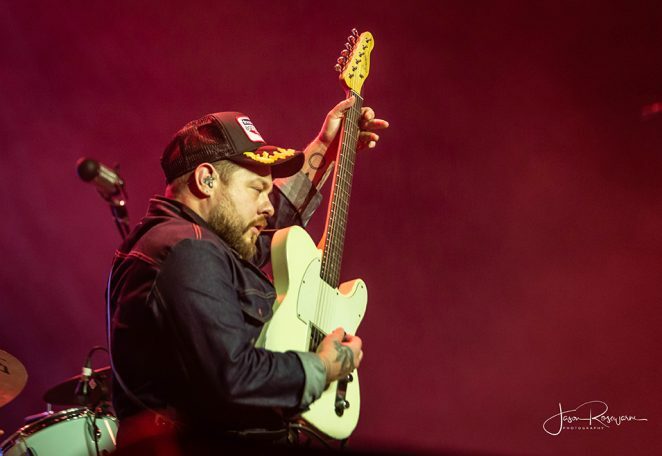 Nathaniel Rateliff and The Night Sweats play a soulful brand of alt-country rock, part Springsteen, part Mellencamp but certainly no copycats, they’ve got a dynamic look and sound of their own. 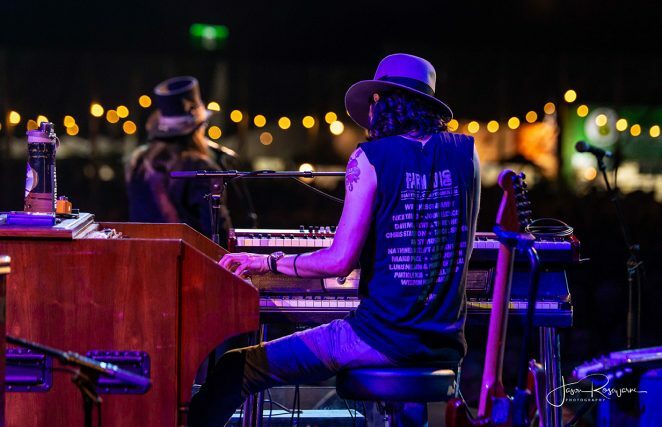 Over at the Mojo tent Lukas Nelson and The Promise of The Real were joined by members of Yothu Yindi and blew the crowd away, particularly with their piping hot version of Neil Young’s Rockin’ In The Free World. 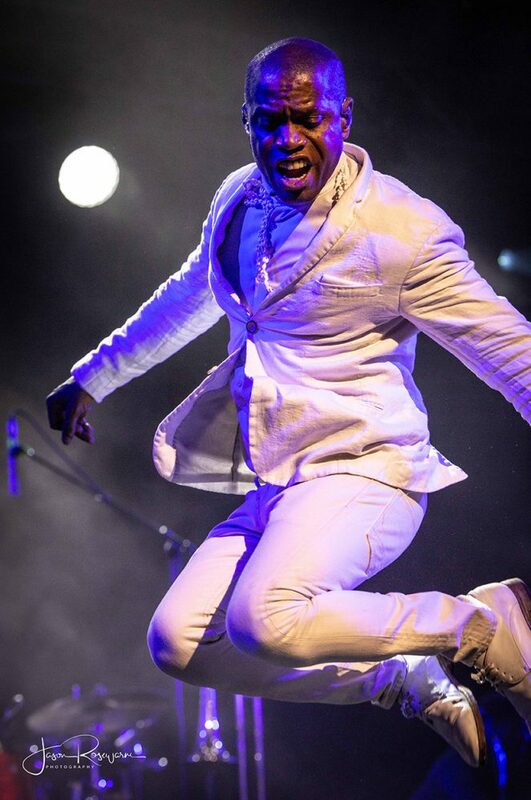 Just as I thought I’d seen everything and felt all the feels available from the amazing line up at this year’s festival, then came Vintage Trouble’s final show. 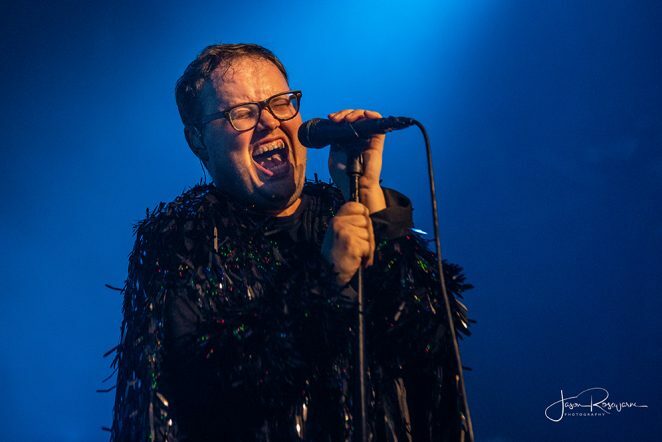 From the get-go the band were determined to deliver a memorable set but what they gave us was one of the most extraordinary rock n roll shows I’ve ever witnessed. 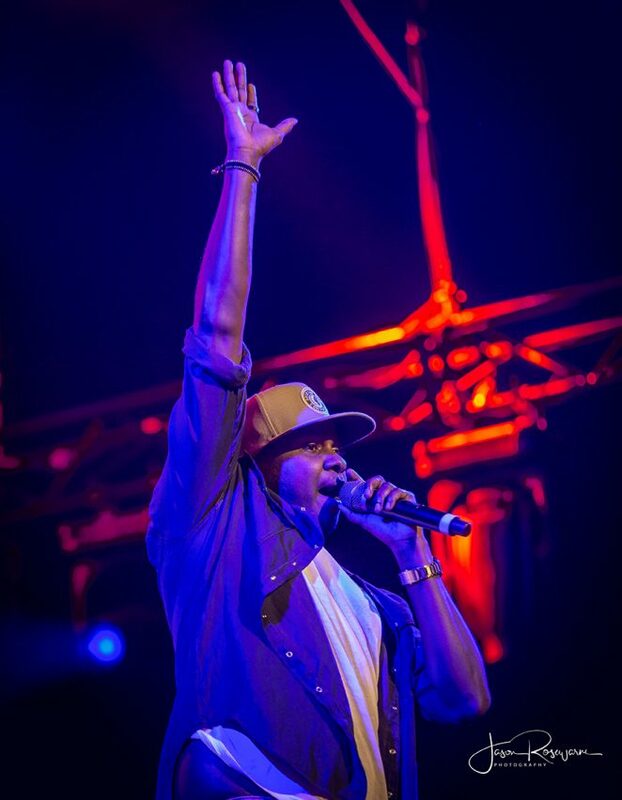 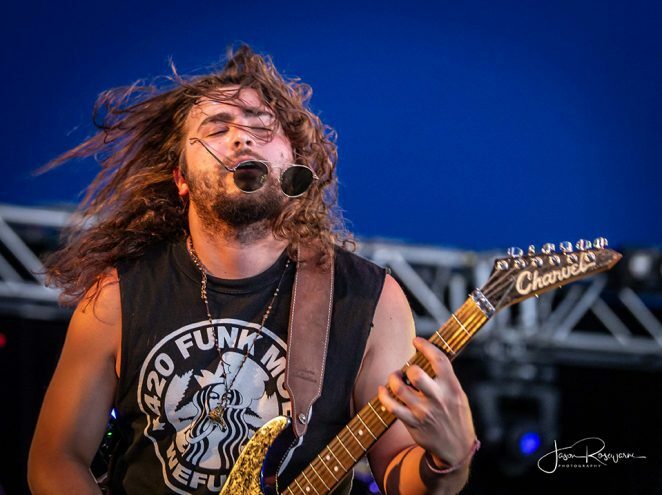 Frontman Ty Taylor is relentless, he prods, nudges and urges the crowd constantly to get involved. 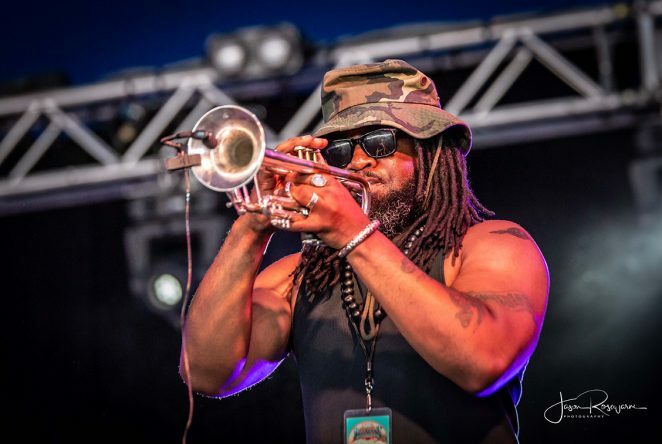 He dances like James Brown, sings like an angel and plays trombone like a muthafather! 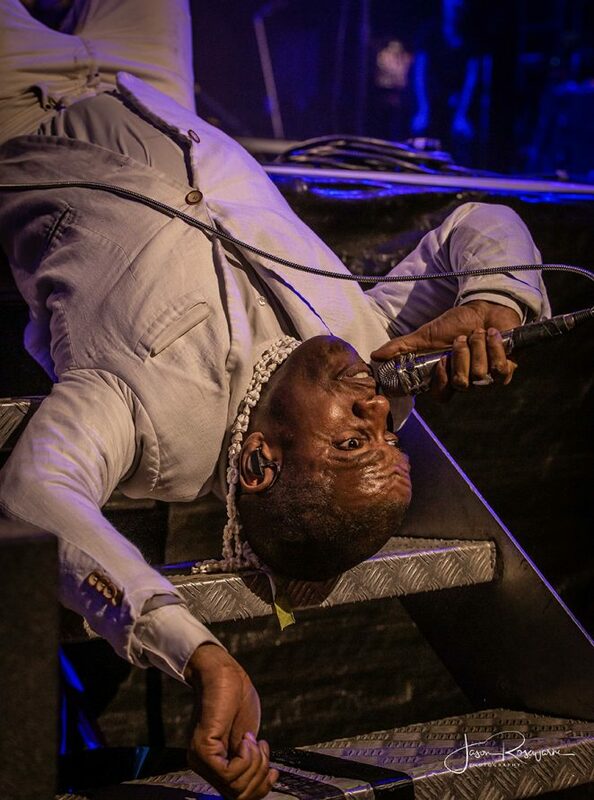 As St Paul’s Paul Janeaway did earlier, Ty took to the crowd but unlike Janeway, he didn’t walk, he crowd surfed there … and back … doing hand stands over the crowd along the way. 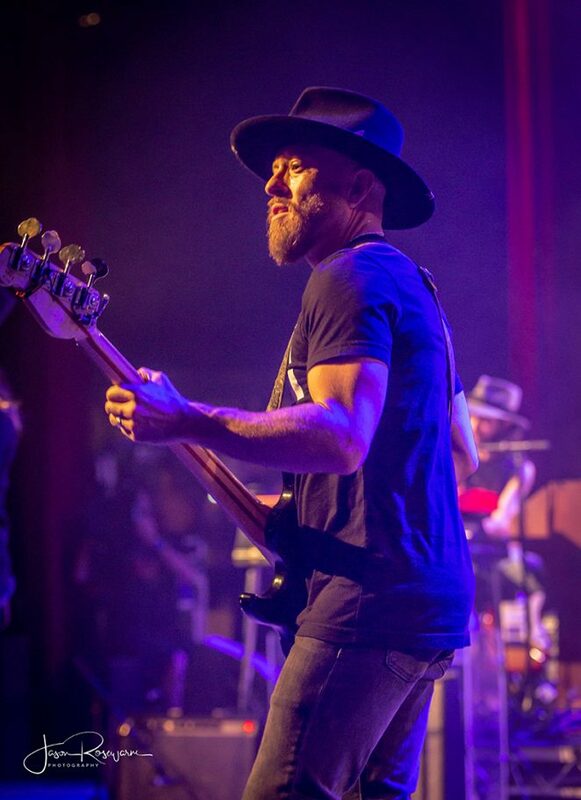 The energy in the room was tangible, this was rock n soul at it’s most electric. 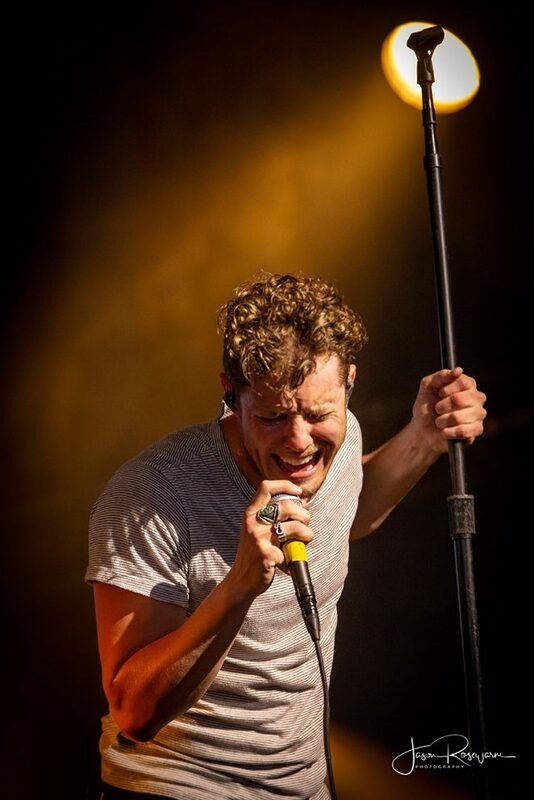 By the set’s end he was exhausted .. but weren’t we all. 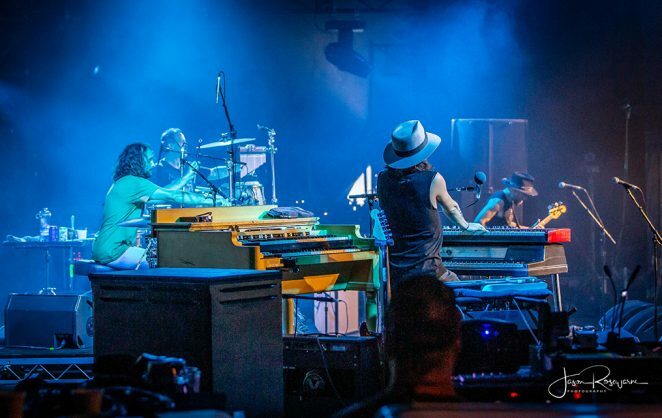 Jack White and The Saboteurs followed, almost running to the stage they were so keen to get stuck into it. 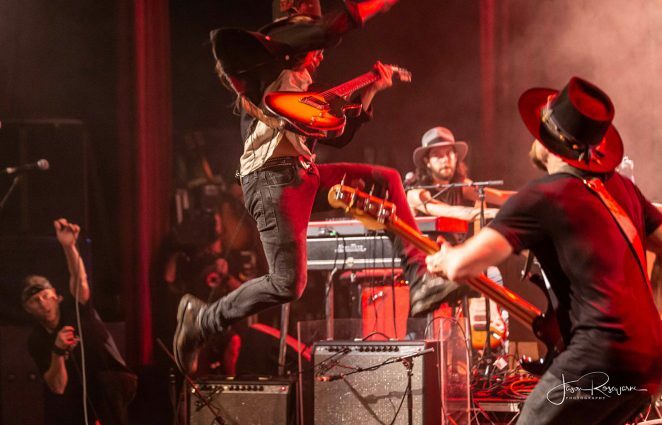 The band committed to a good time and the audience did too, everyone was on the same rocking’ page. 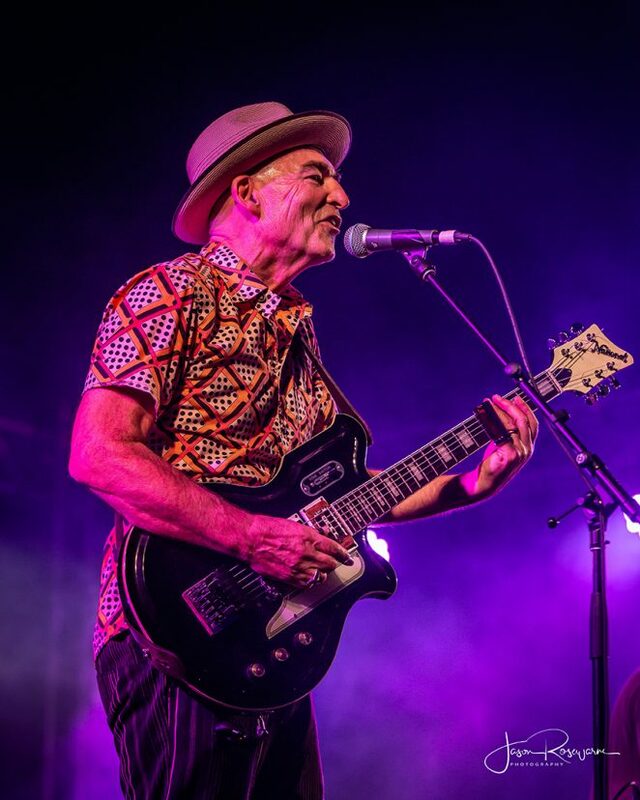 Across the road in the Mojo tent Paul Kelly and friends were preaching to the converted, offering one Australian classic after another. 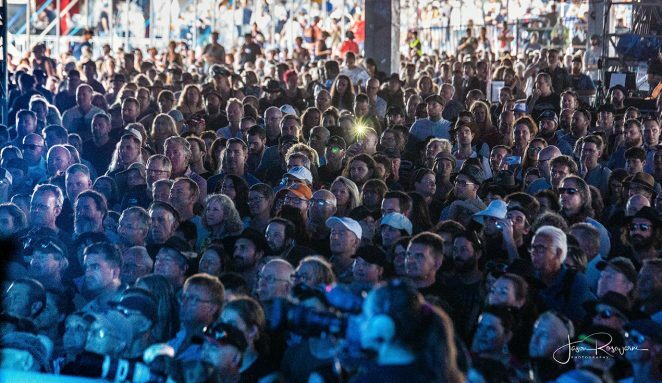 No matter how hard you plan, it’s impossible to see everyone at Bluesfest that you want to but as sure as hell, you’re going to experience world class entertainment of the highest quality and you’re going to discover one or two artists who will become your new favourite act. 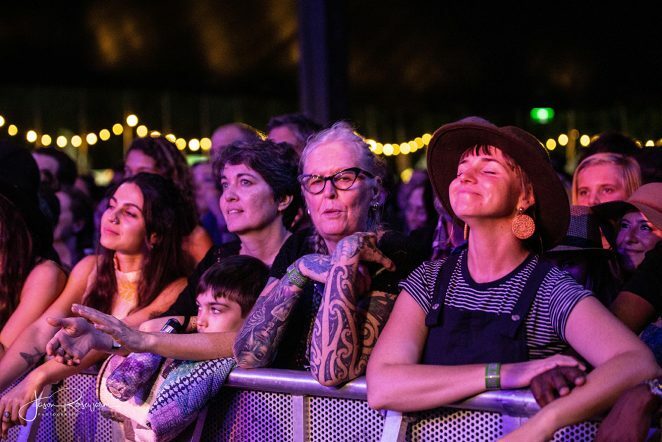 Peter Noble’s festival delivers year in, year out and and nobody that attended this year can say they weren’t at the best 30th birthday party they’ve ever been to. 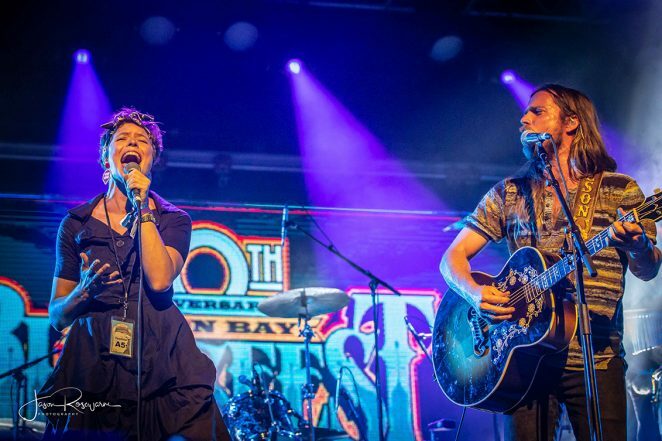 Happy 30th Bluesfest and thanks for the memories. 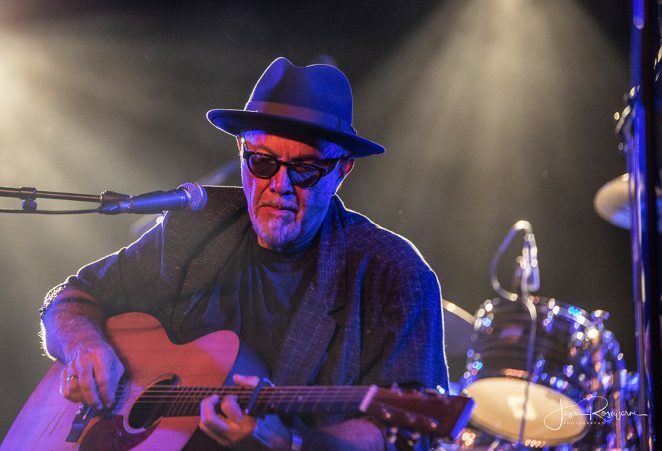 Words: Greg Phillips. 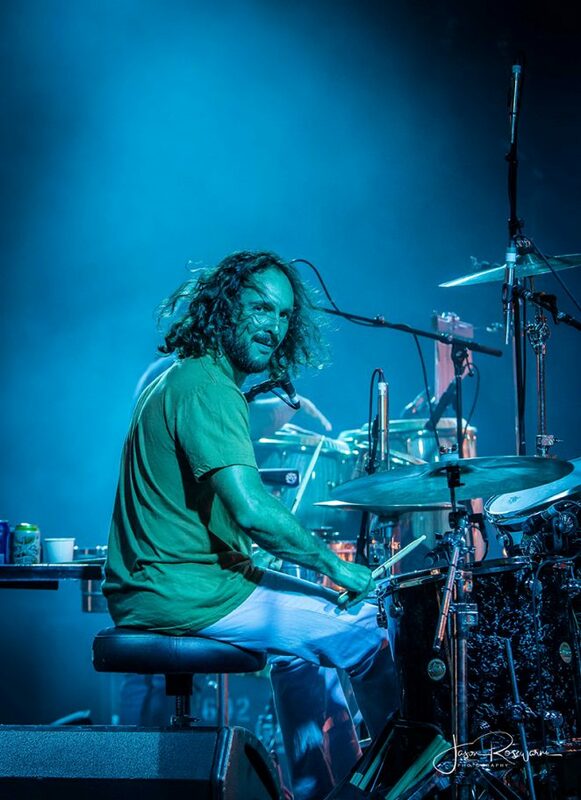 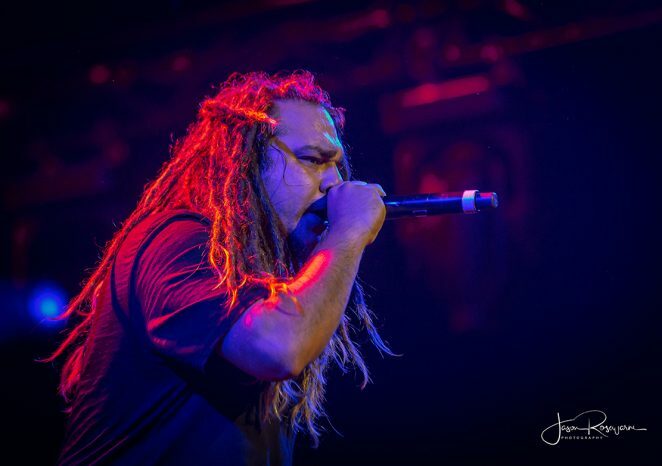 Photos: Jason Rosewarne. 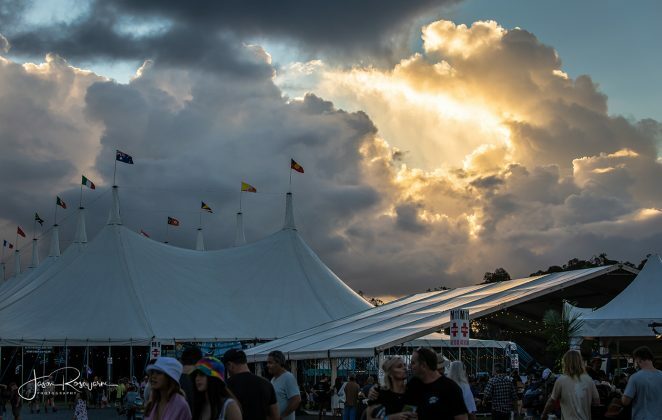 For many punters on a 3 day pass, Easter Sunday was their last chance to soak up the Bluesfest fare. 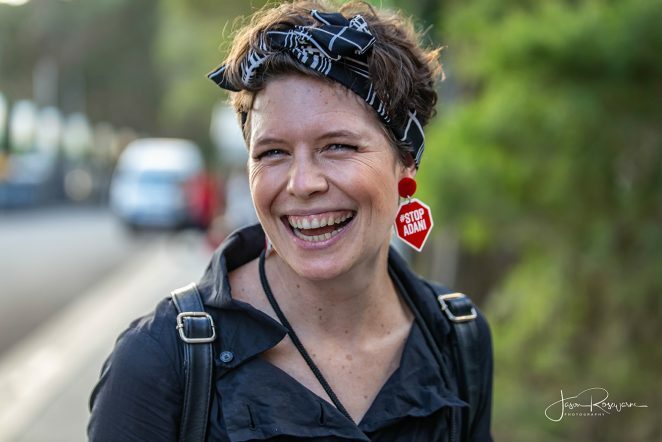 Those on a 5 day bender still had an amazing array of choice in front of them over the next couple of days. 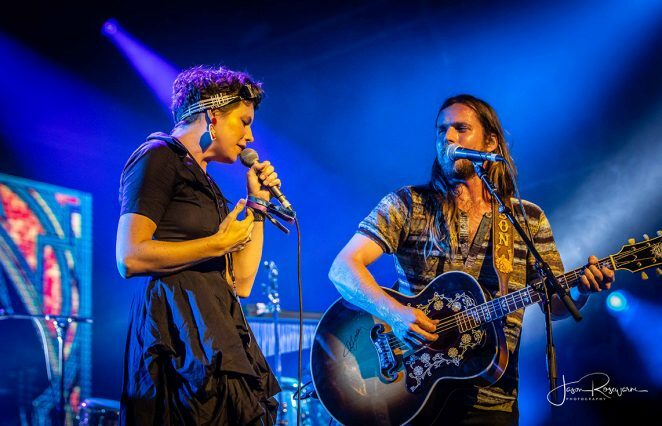 Alt country act Little Georgia featuring Justin Carter and Ashleigh Mannix, have built quite a large Bluesfest following after their many dynamic performances here over the years. 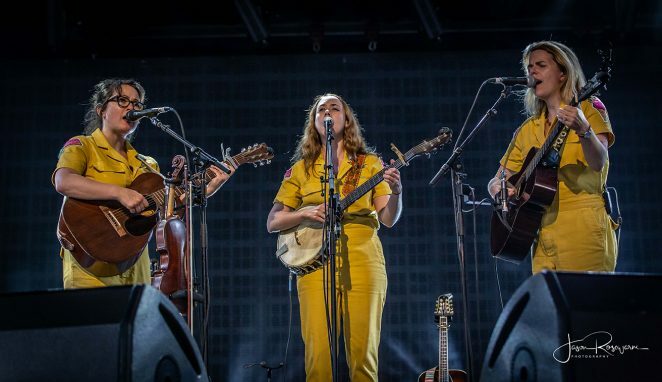 Since releasing their acclaimed debut album All The While late last year, they’ve gained even more attention. 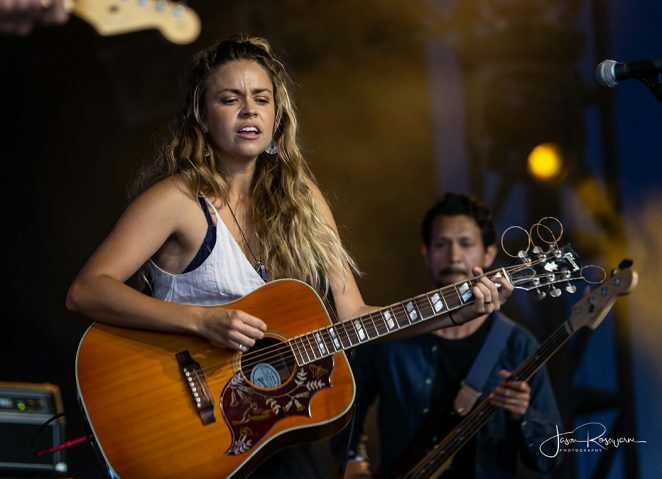 Due to their rise, this year Little Georgia made it to the larger Crossroads stage and didn’t disappoint. 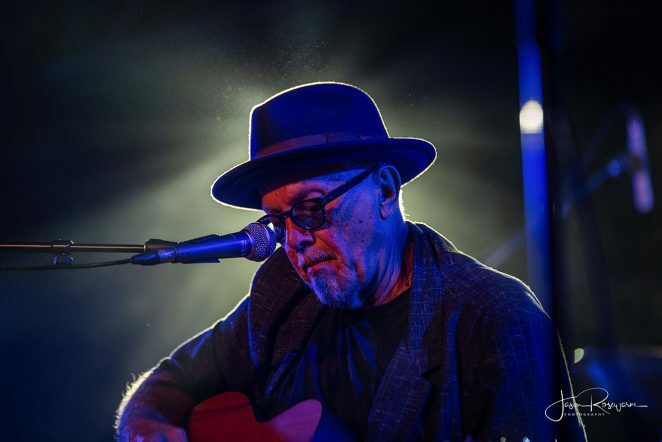 Down at the Juke Joint Archie Roach played to a packed house, relating his life stories and strumming those beautiful songs which have become a part of Australian music’s DNA. 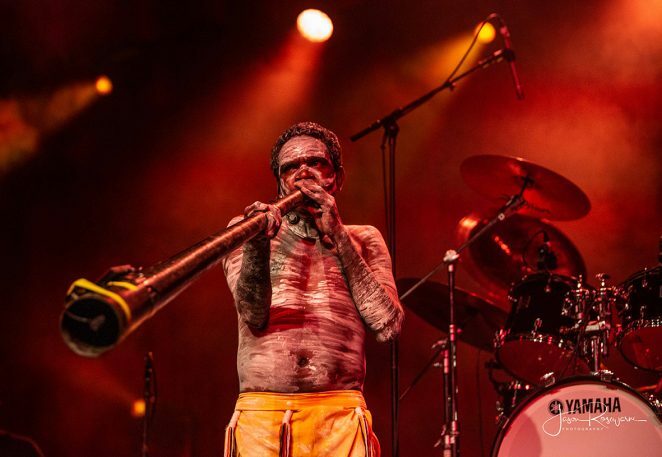 Also part of the Boomerang Festival were Yothu Yindi and The Treaty Project, who not only produced a huge sound but were also visually stunning. 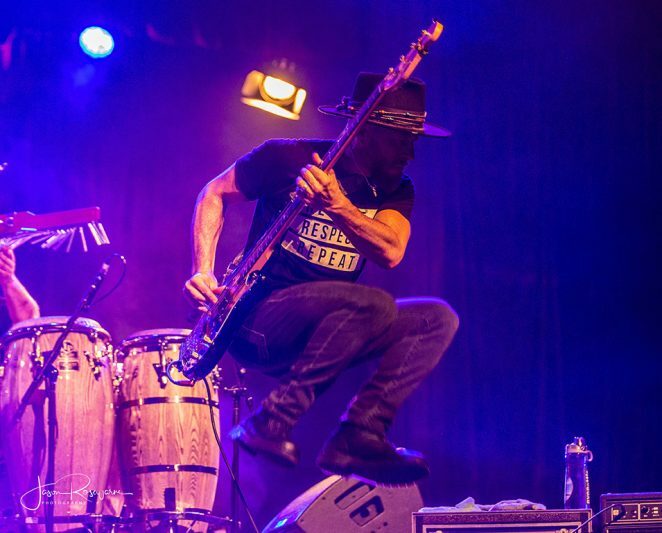 As expected their live version of the song Treaty had the Juke Joint area jumping. 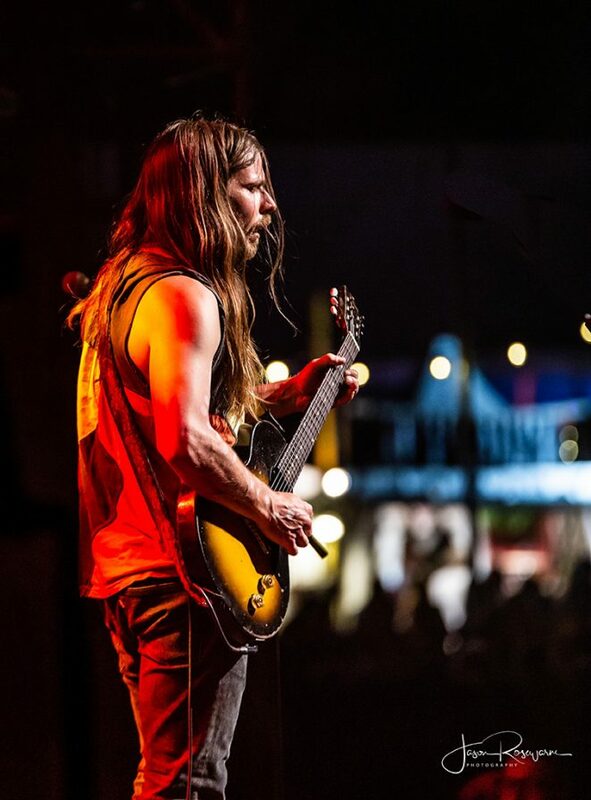 Lukas Nelson and The Promise of the Real were back at the Mojo tent and have become one of the festival’s main attractions since they first appeared and impressed here a couple of years ago. 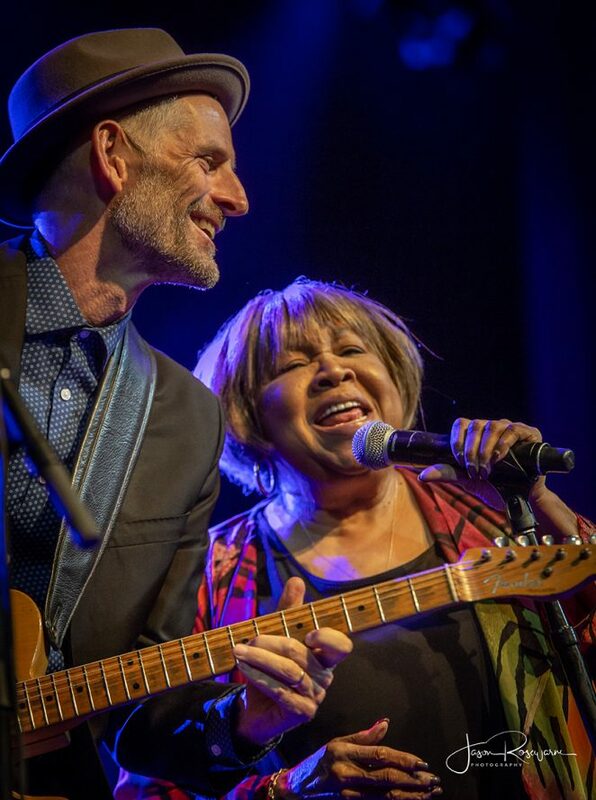 Today’s set featured a joyous version of Paul Simon’s Diamonds on the Soles of her Shoes and a touching guitar solo delivery of Amazing Grace in recognition of Easter Sunday. 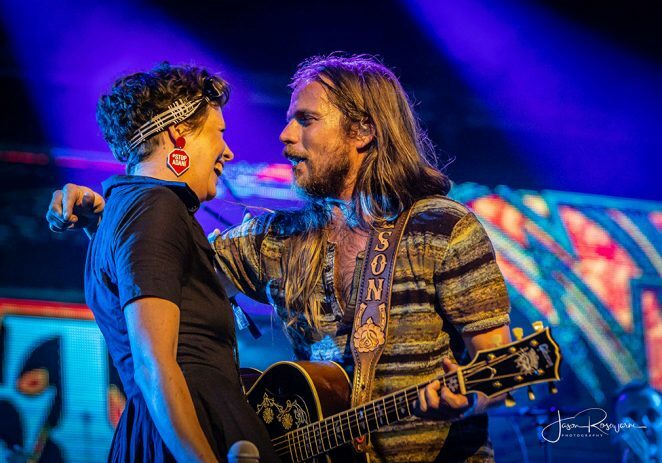 Hussy Hicks’ Leesa Gentz was invited up to duet on a poignant and powerful ballad too. 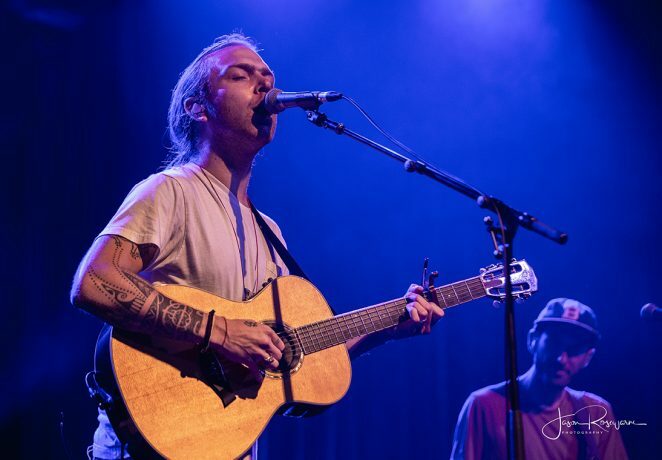 It was also a great opportunity for Lukas and band to give us a taste of their next album with a heart warming performance of the title track Turn Off The News and Build a Garden. 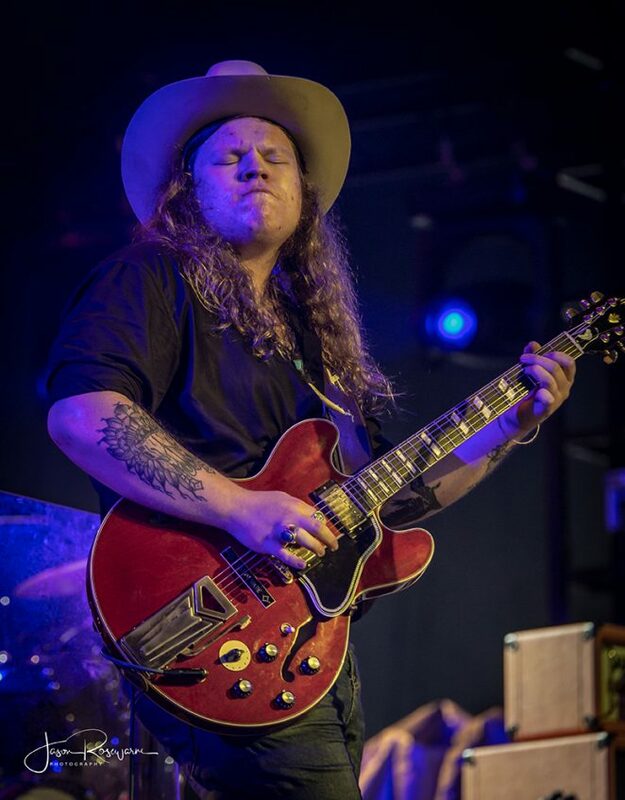 The Marcus King Band have been one of the biggest surprises of the festival. 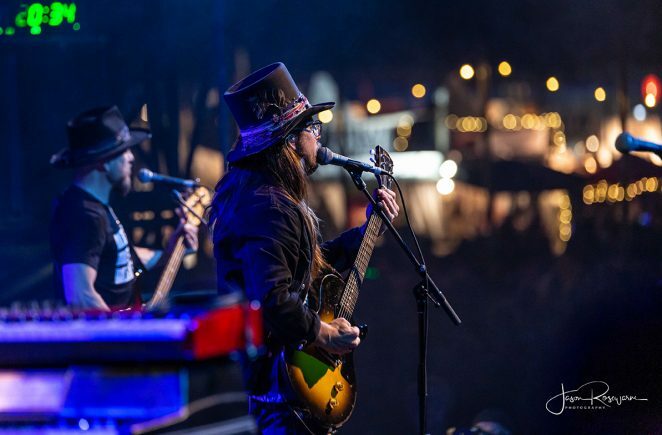 With a huge sound coming from an incredibly accomplished band, their audiences have grown substantially with each new Bluesfest show. 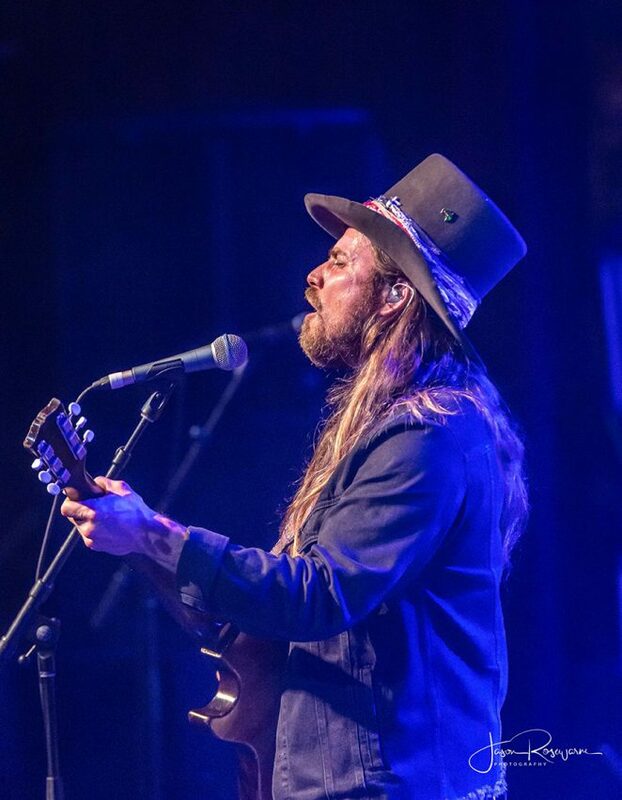 Allen Stone had the Delta crowd dancing with his melodic roots and soul music. 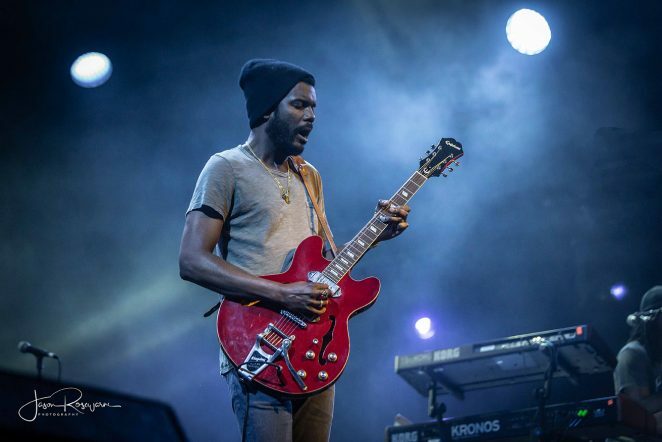 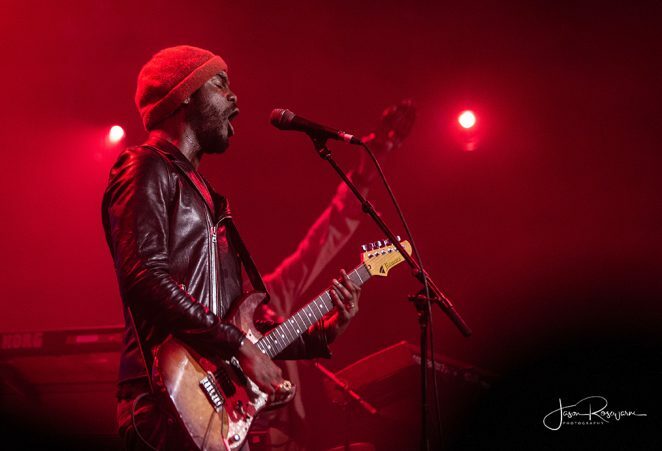 Gary Clark Jr packed out the Mojo tent with his moody brand of blues, and the Melbourne Ska Orchestra was having lot of fun with their huge Crossroads tent crowd. 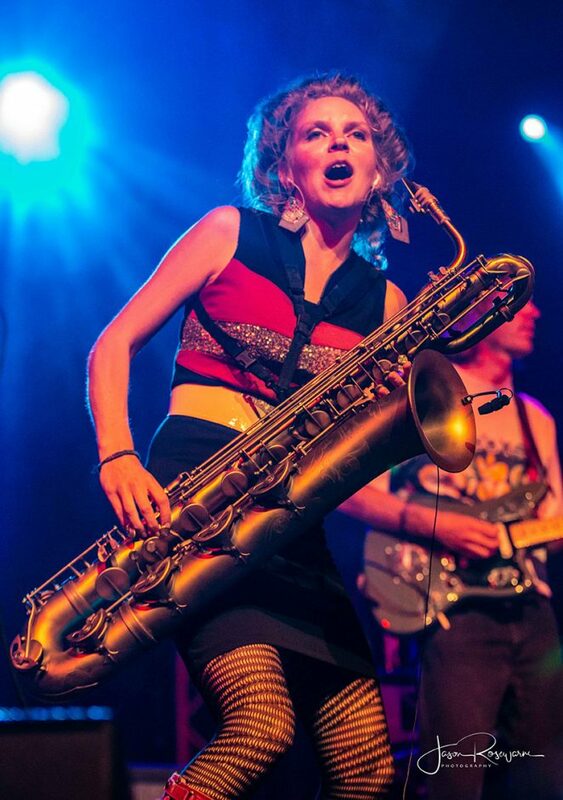 One minute they’re cranking out infectious ska tunes, the next the theme from the Austin Powers movie. 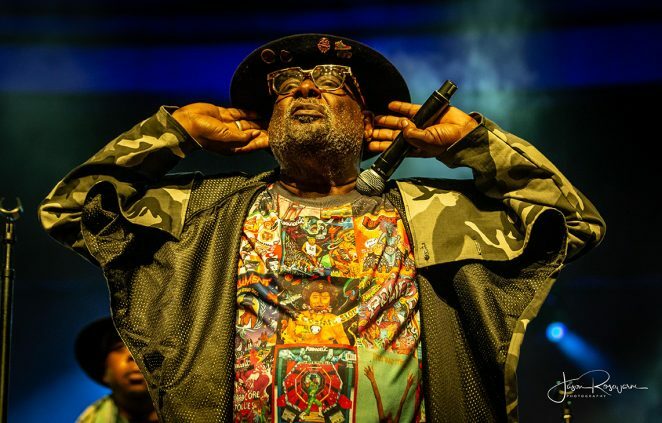 Tonight’s headliner menu specials consisted of either Jack Johnson or George Clinton & Parliament Funkadelic. 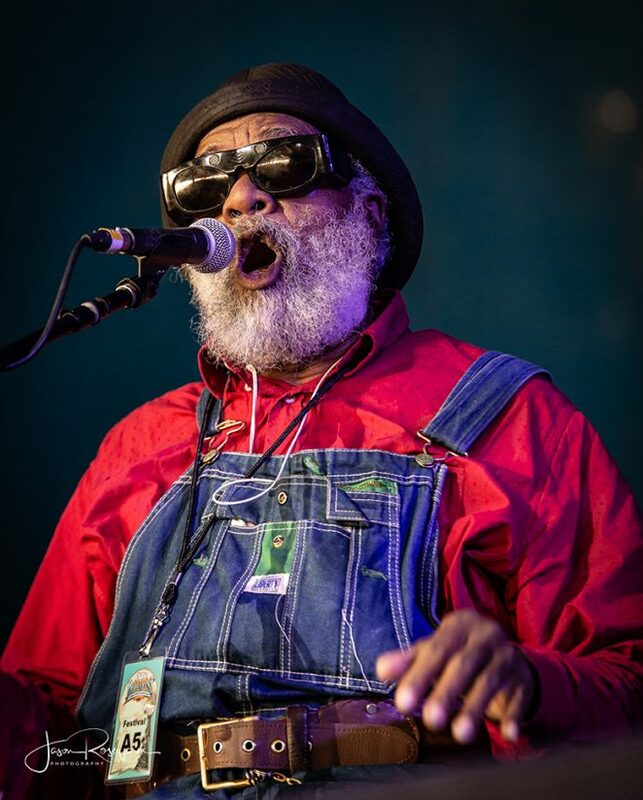 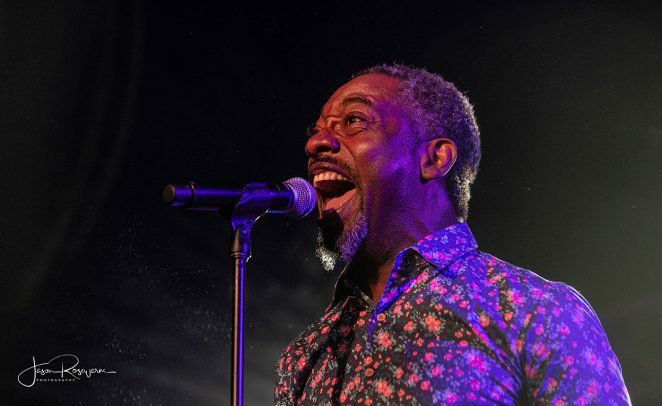 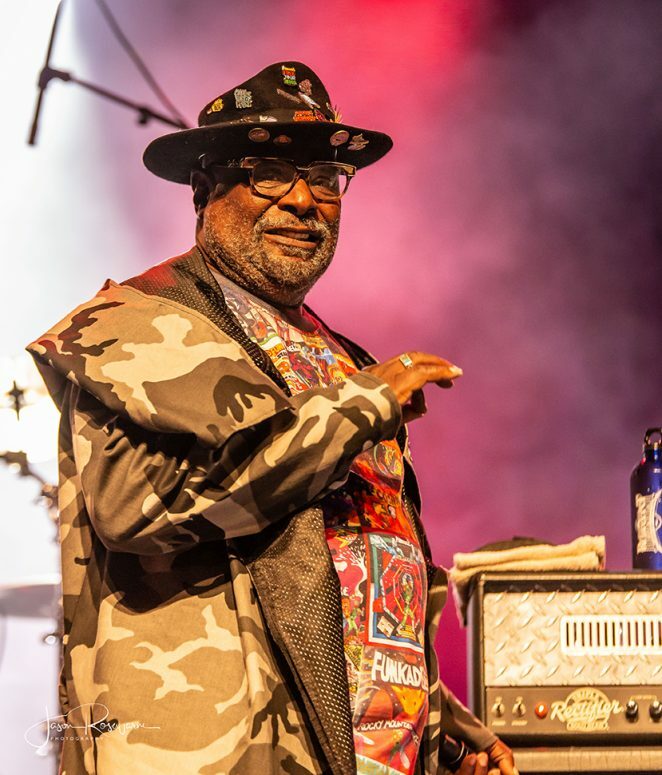 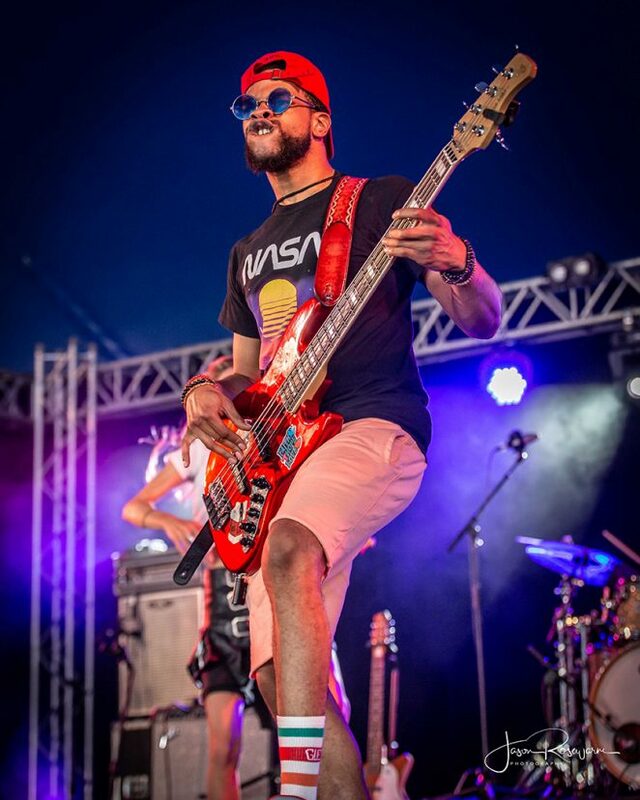 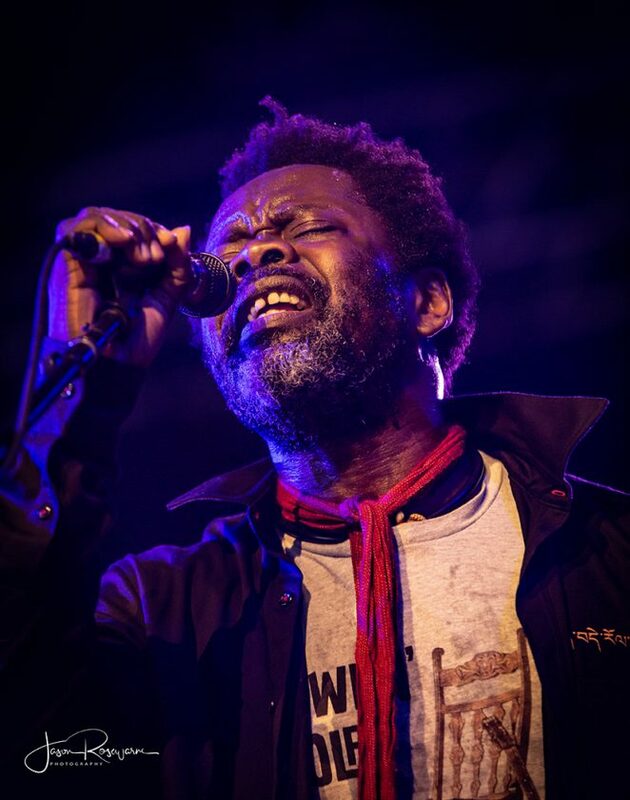 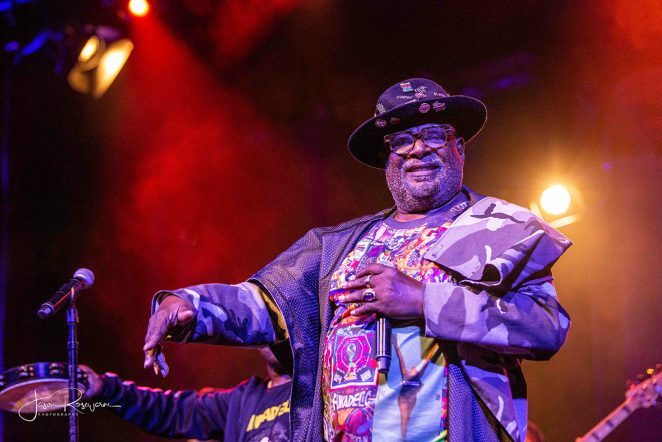 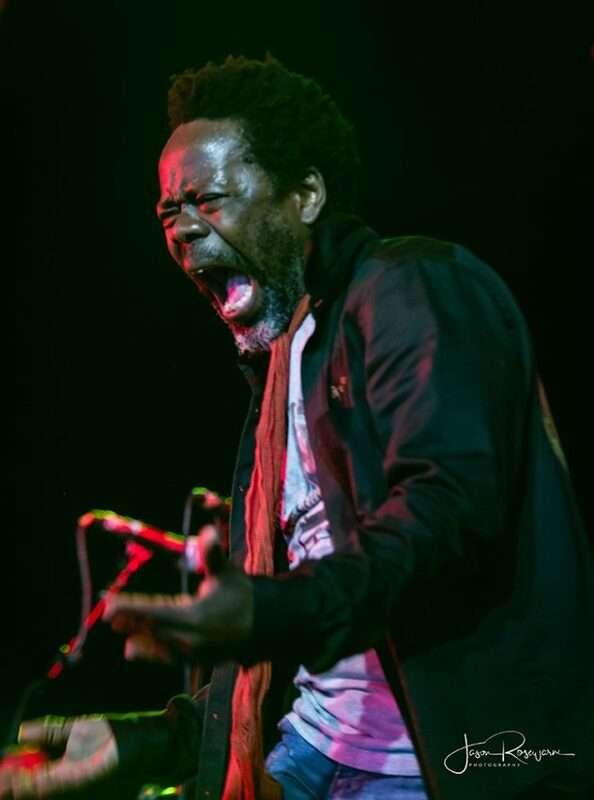 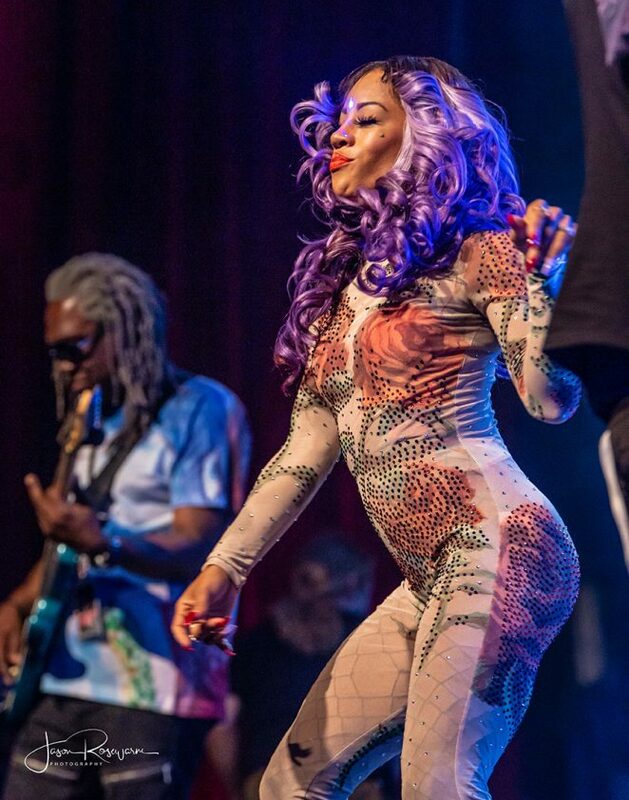 Day 4 and 5 of Bluesfest are some of the last opportunities to see the amazing Funkadelic collective in Australia, as Clinton intends to retire the band soon. 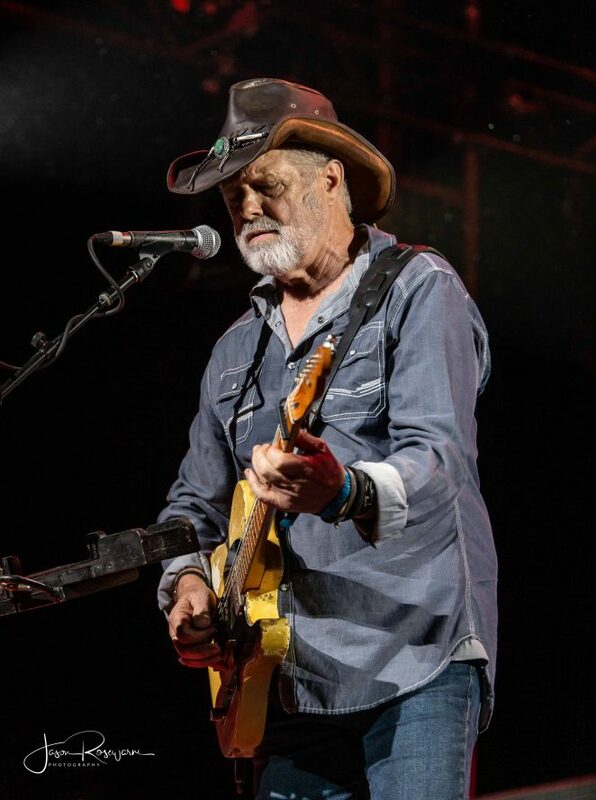 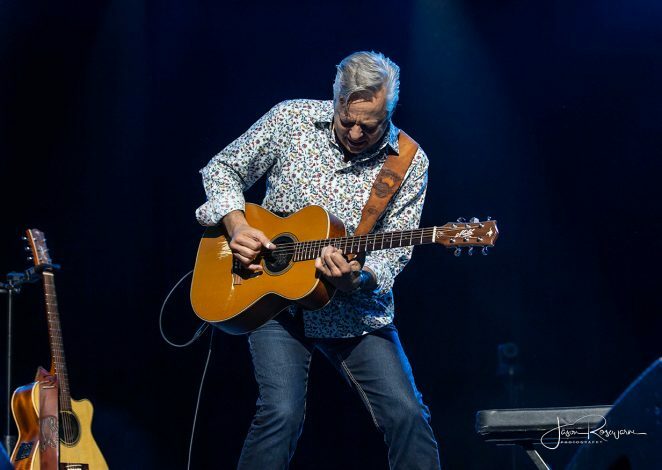 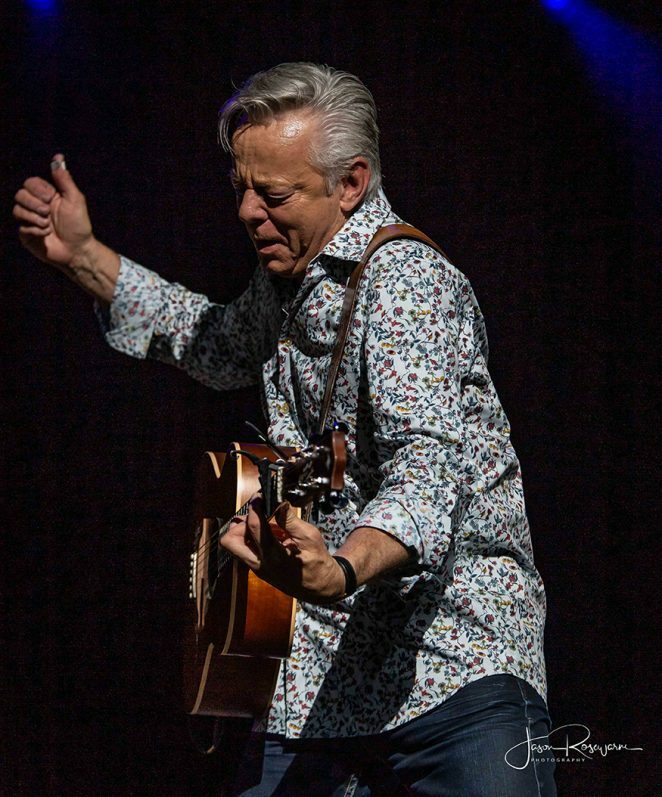 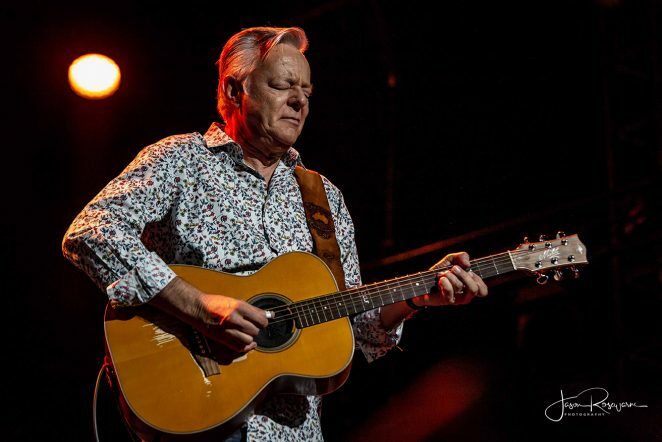 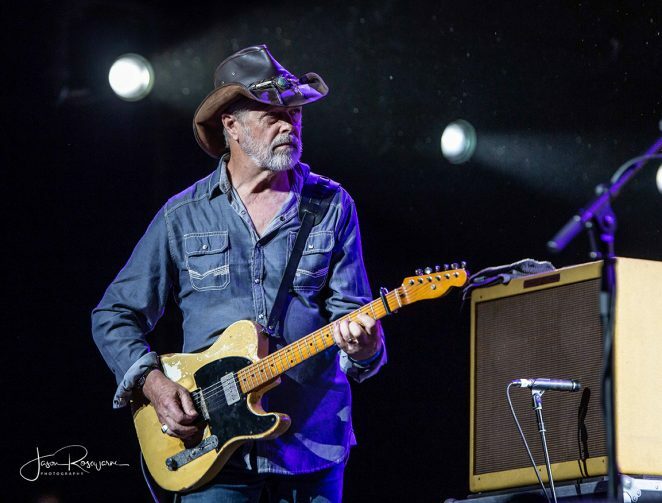 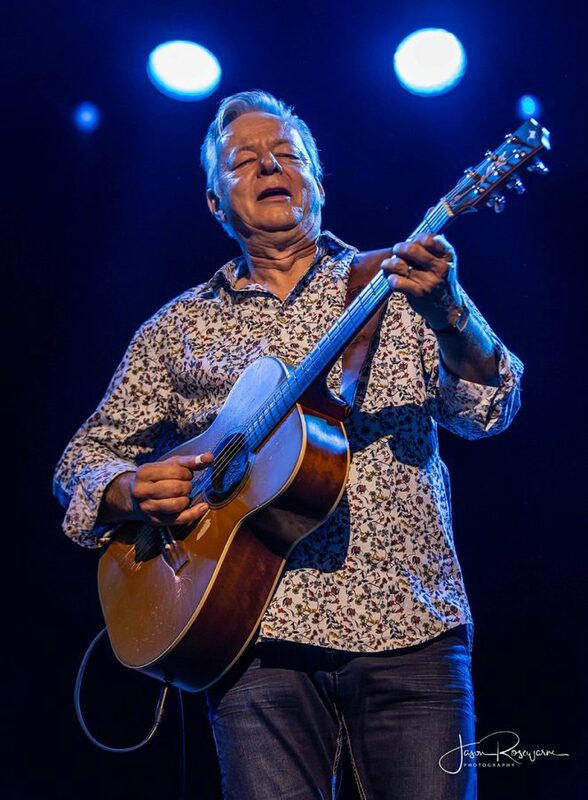 Jack of course played to one of the festival’s largest crowds, who soaked up his famous folk rock anthems. 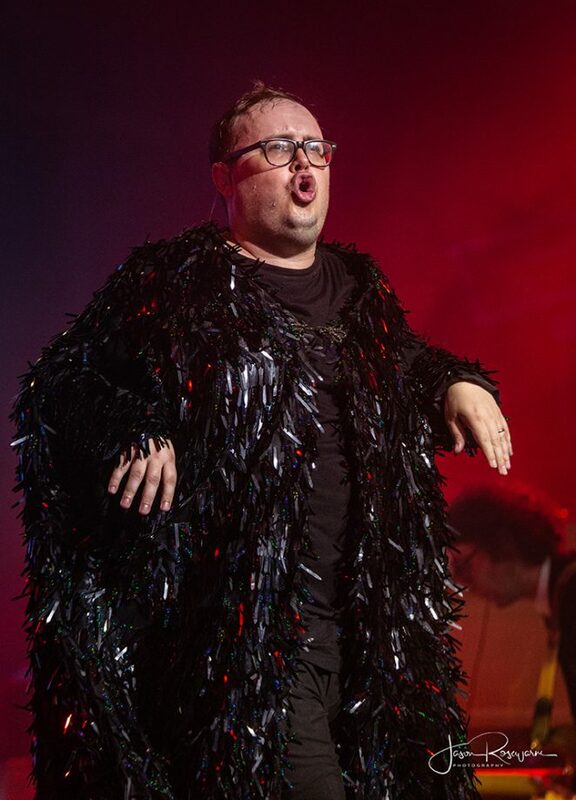 Four days down and one to go in one of finest 30th birthday parties I’ve ever been to. 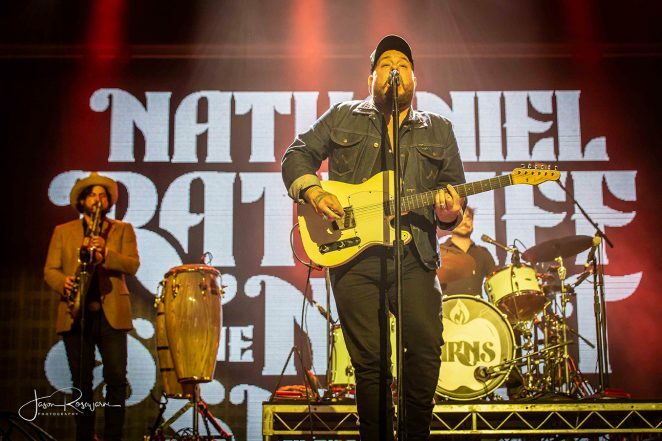 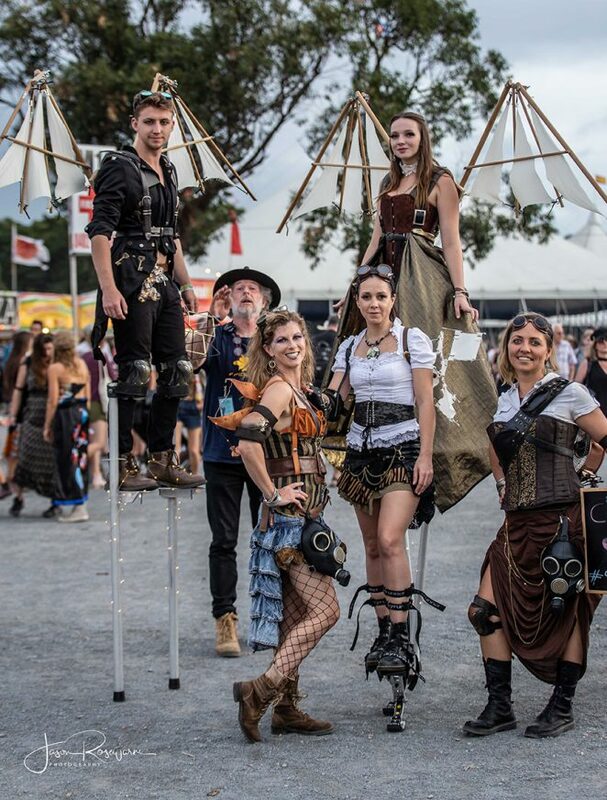 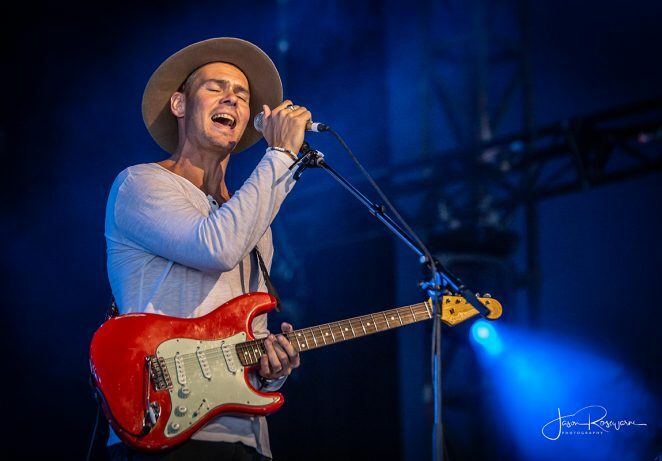 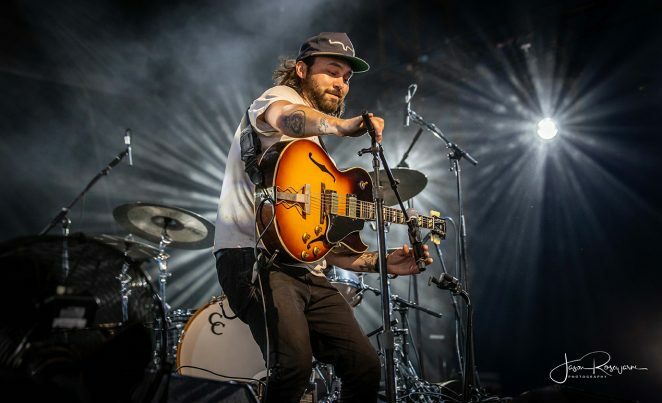 Easter Saturday saw a steady stream of punters through the gates, eager to see what Bluesfest day 3 had to offer. 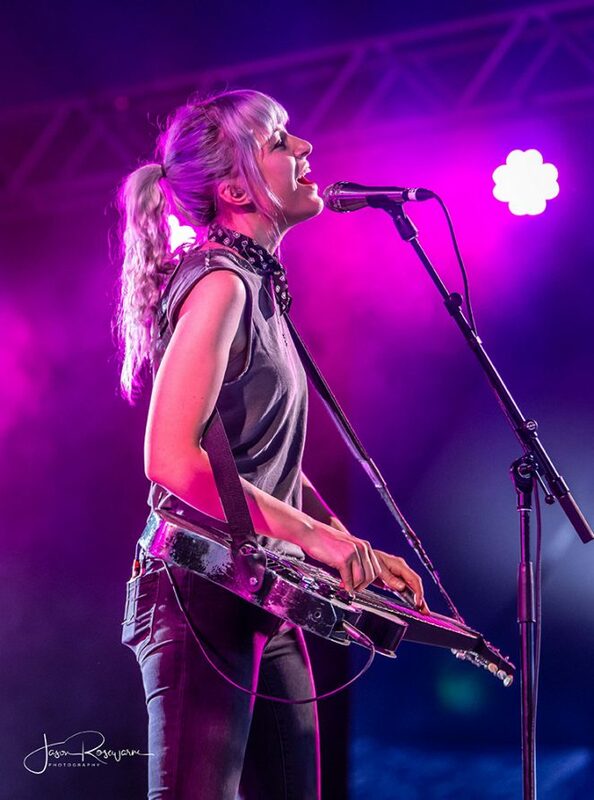 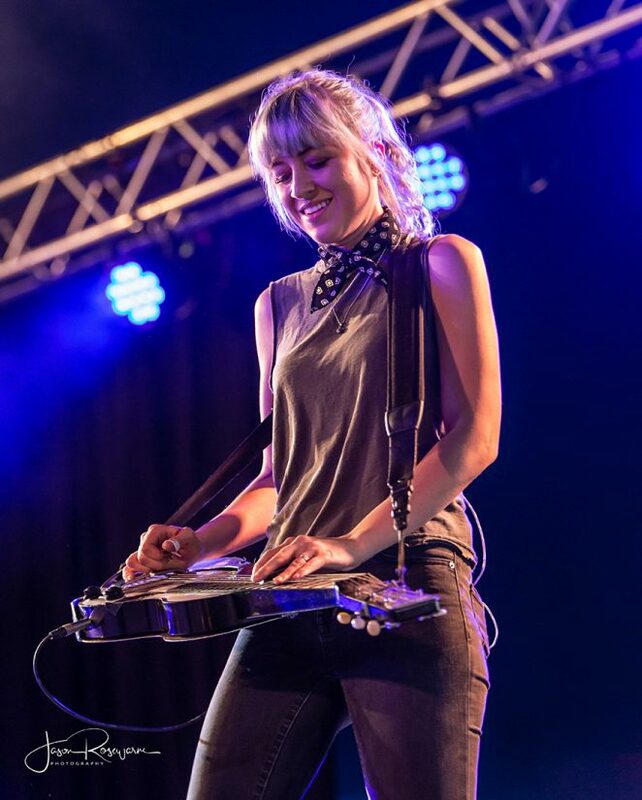 Sister act Larkin Poe (Rebecca and Megan Lovell) on their first trip to Australia were playing to a packed Delta tent, where the audience was getting off on the raw blues and roots sounds coming off the stage. 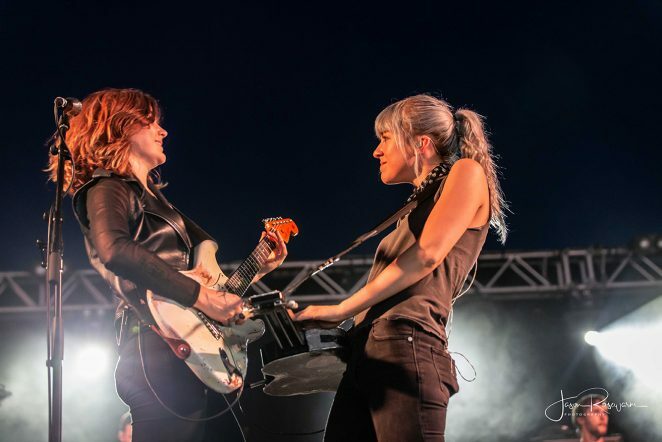 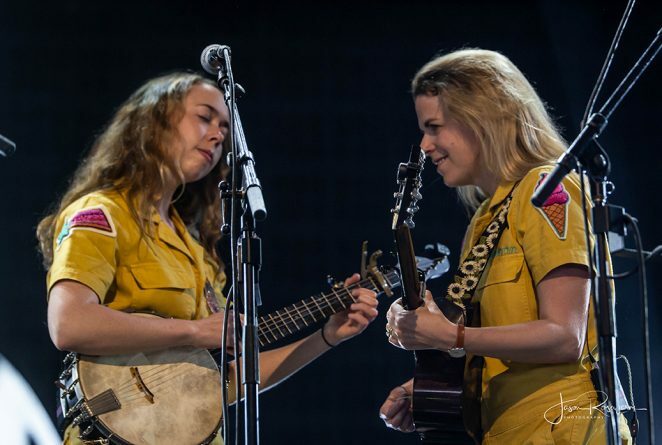 The girls were clearly thrilled to be at the festival and told the crowd how much they appreciated being in a place that supports live music with such passion. 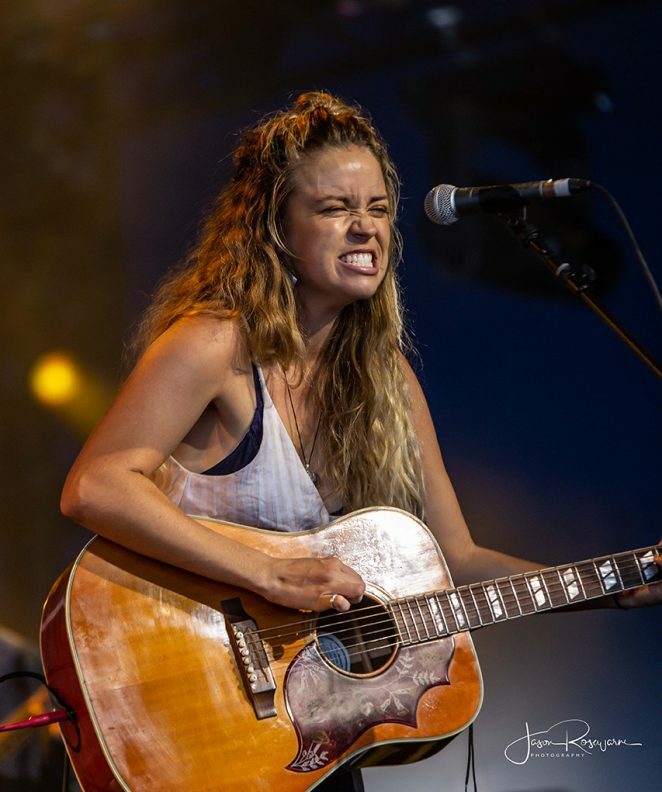 Next door in the Juke Joint tent, Double J’s Zan Rowe was presenting a Best of Bluesfest session, which involved interviews with artists and short acoustic performances. 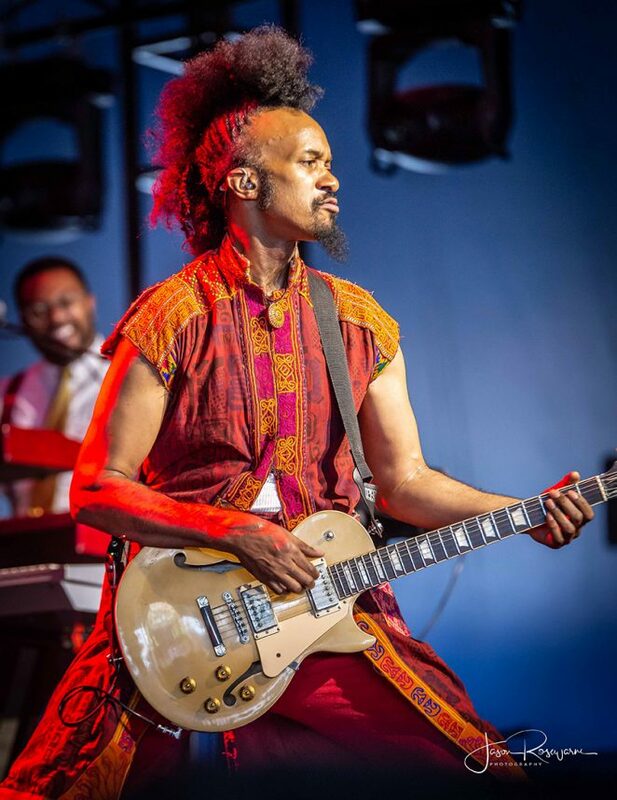 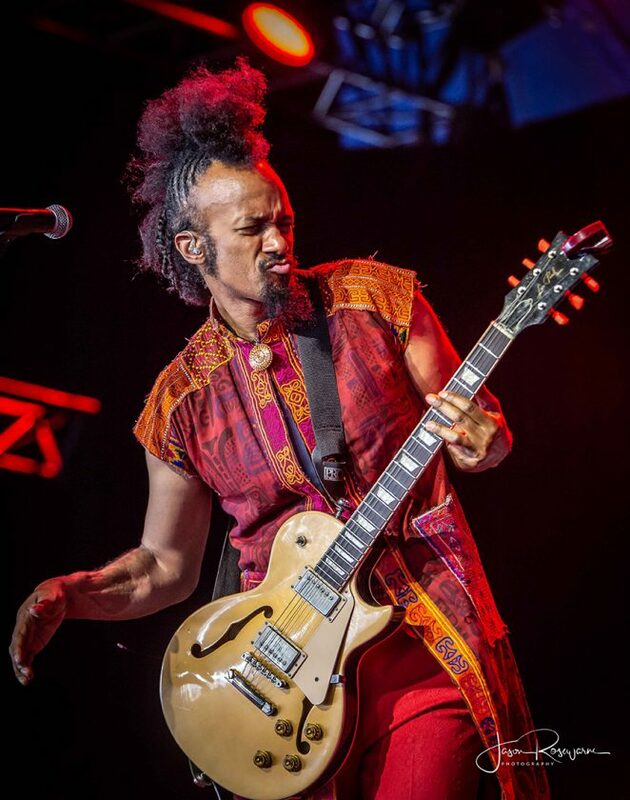 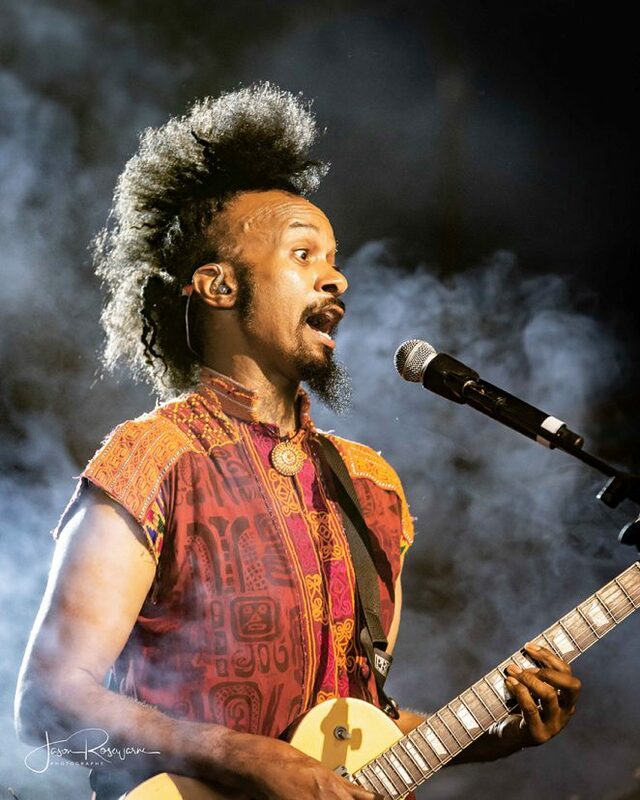 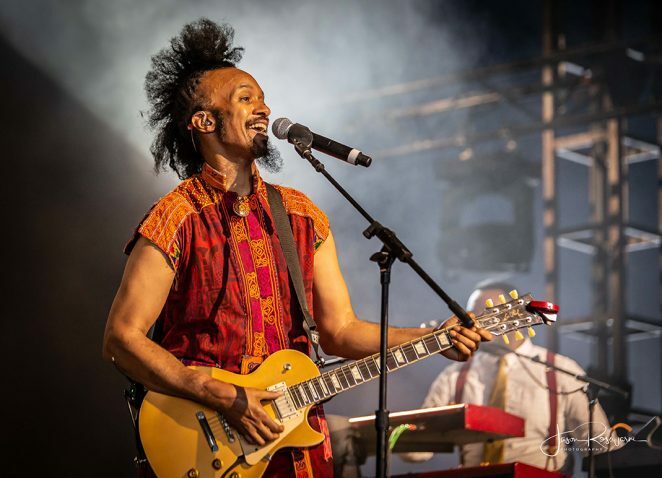 We caught Fantastic Negrito, who told us he was the 8th of 14 children. 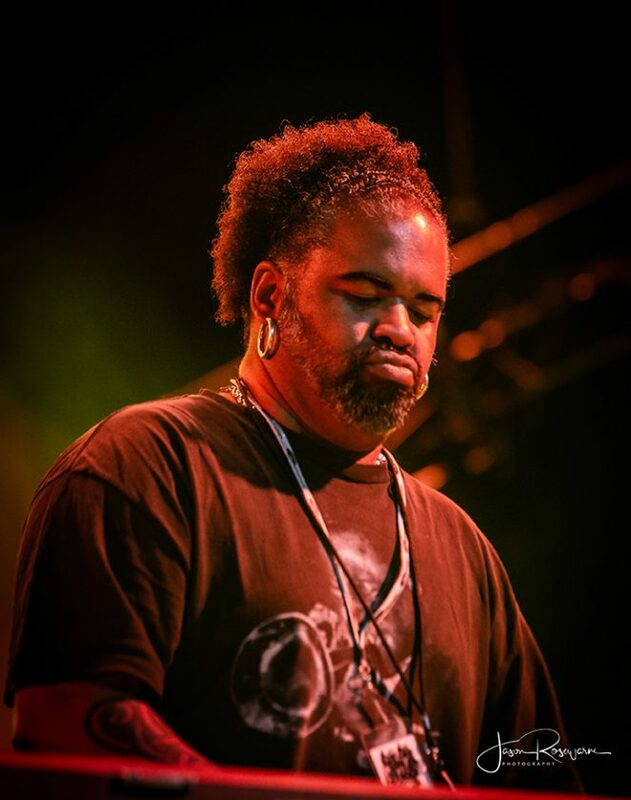 There were tales of his rough upbringing and the loss of his brother and so many other close friends to gun violence. 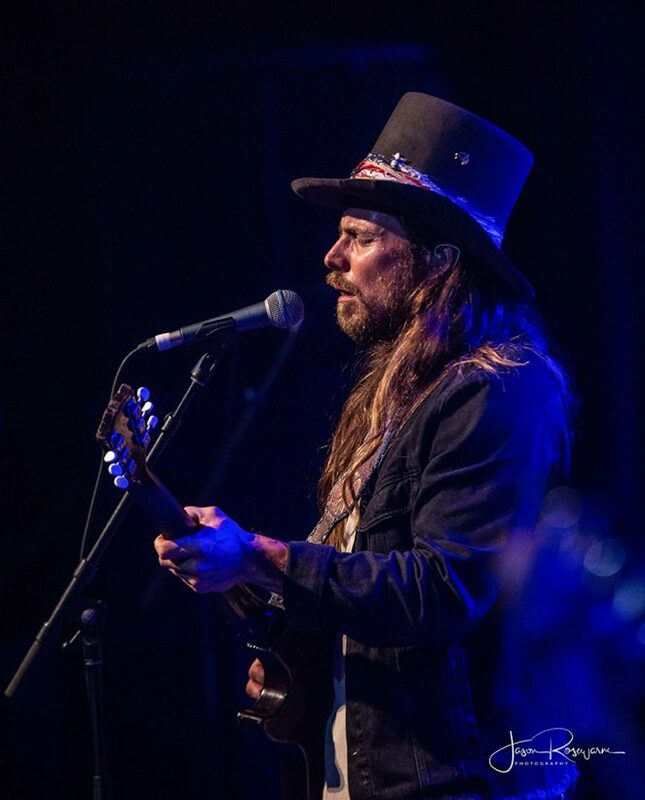 On a lighter note, Lukas Nelson followed discussing his role of ‘authenticity consultant’ on the Hollywood movie A Star is Born. 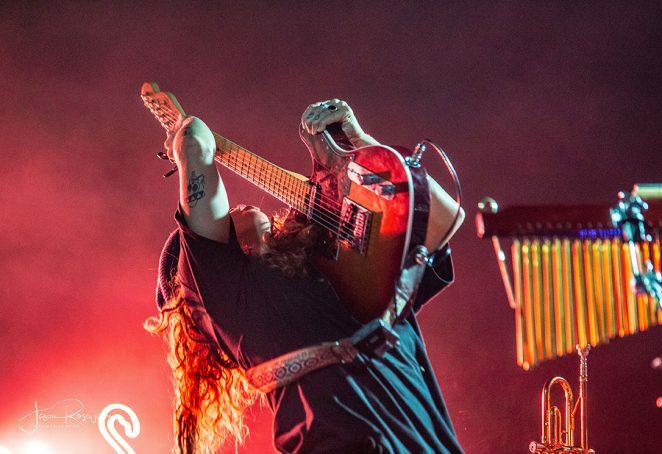 Making some rocking’ noise to a lot of people inside the Mojo tent was Kurt Vile and The Violators, pumping out their brand of laconic rock. 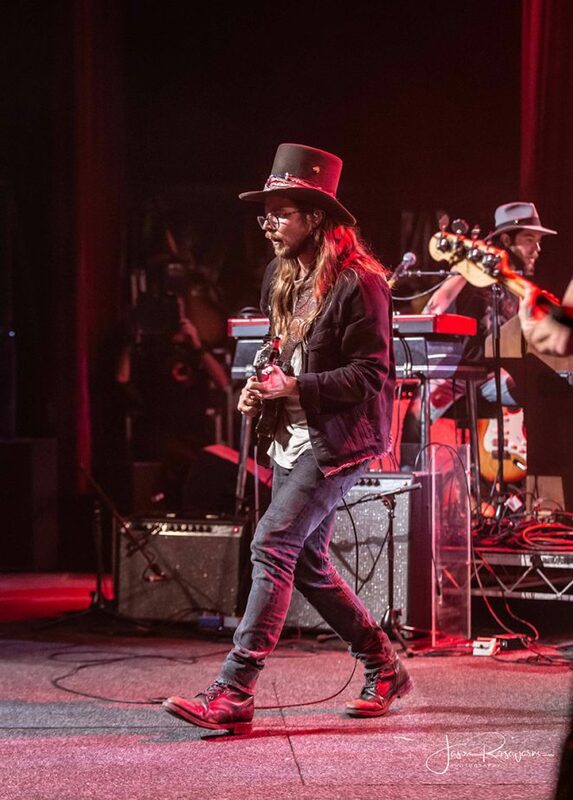 The former The War On Drugs guitarist is almost as laid back as Dinosaur Jr but with a fraction of the distortion. 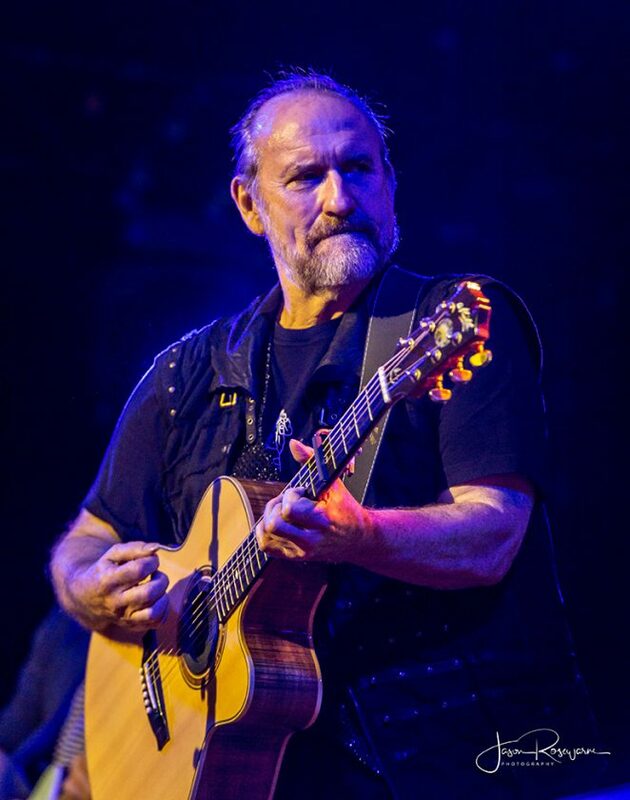 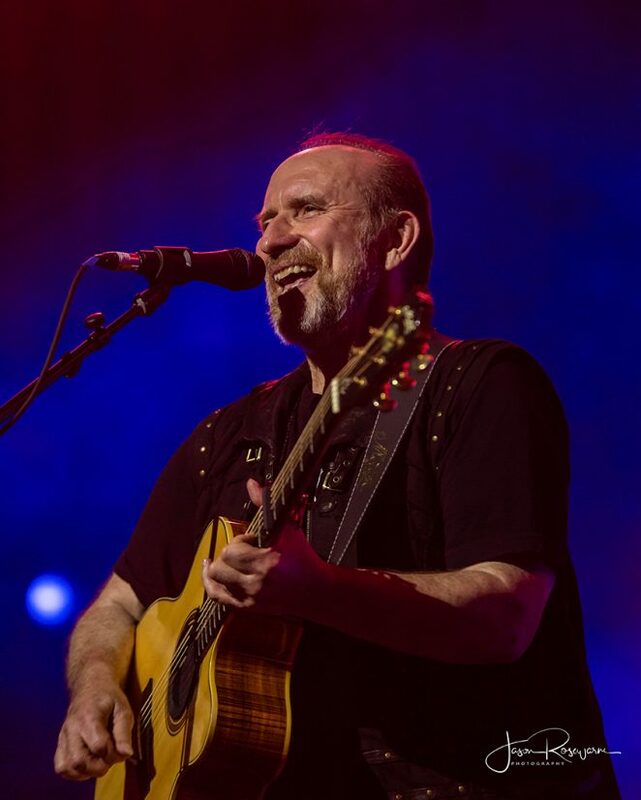 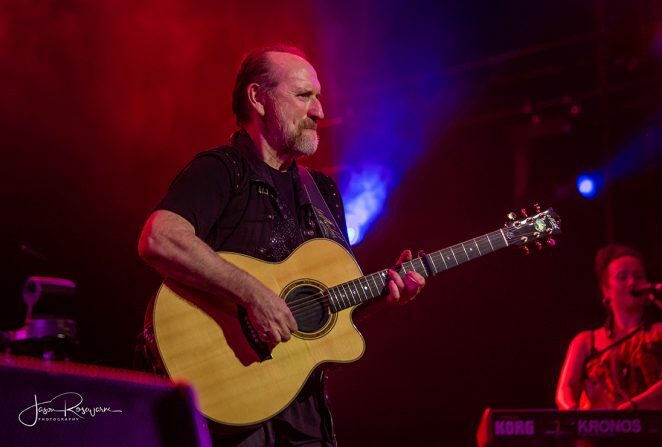 Colin Hay proved to be a popular attraction with a crowd stretching way beyond the bounds of the Crossroads tent. 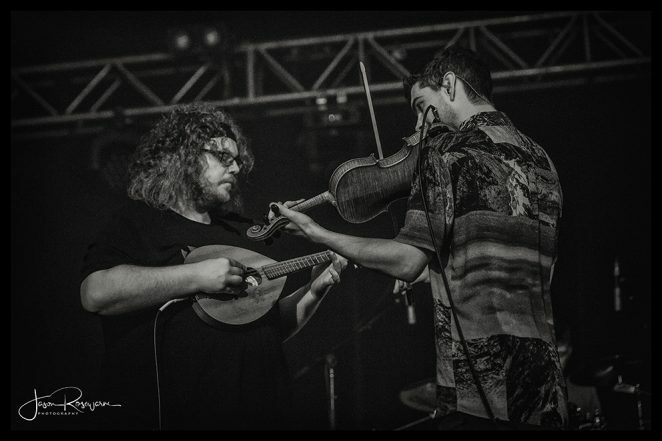 Starting mellow, Hay gradually built the atmosphere as he played the Men At Work classics the audience wanted to hear. 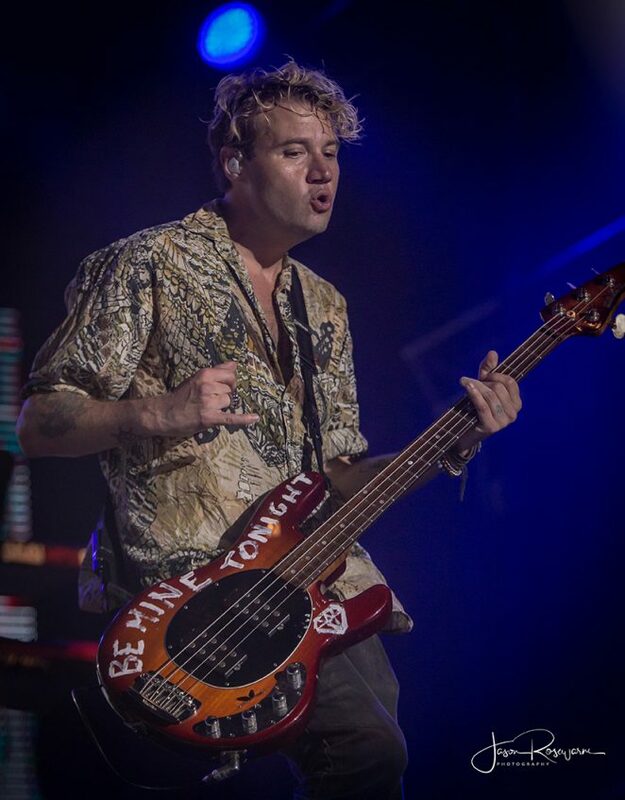 Be Good Johnny was particularly epic. 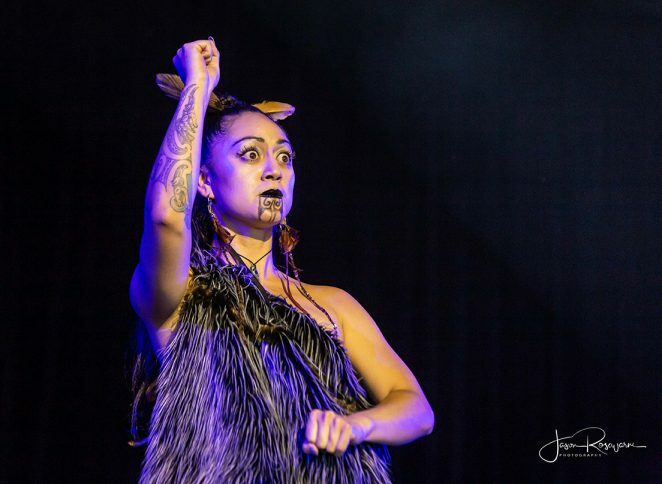 While there was much activity within the performance tents, unbeknown to the public there was also much happening backstage. 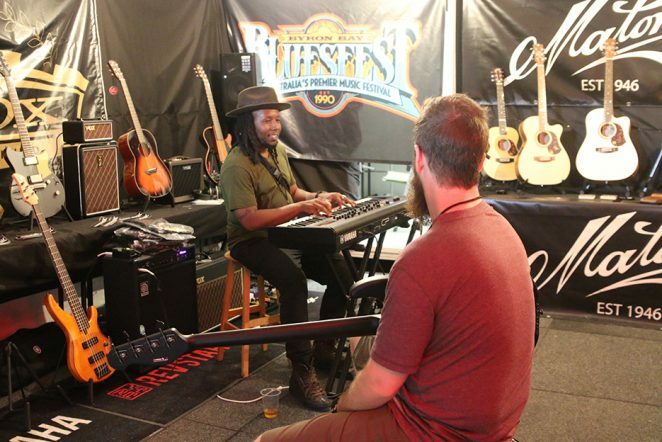 Byron Music have a tent set up for musicians to check out instruments and jam as they please on gear supplied by Yamaha Music, Fender and Maton. 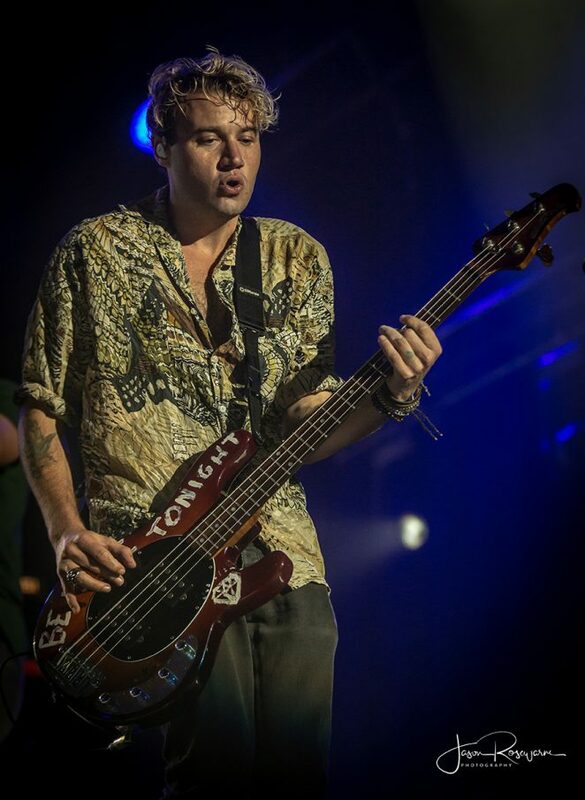 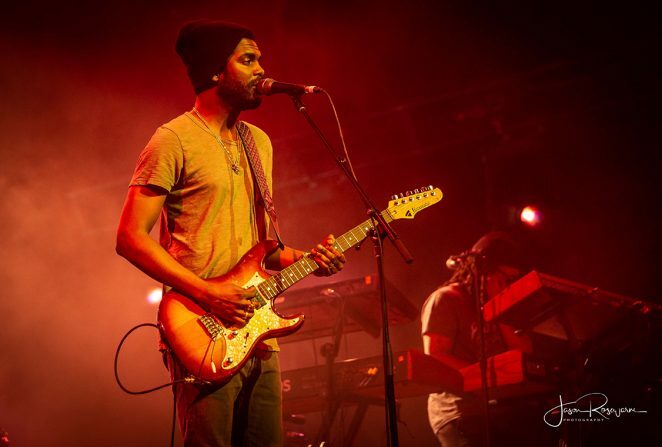 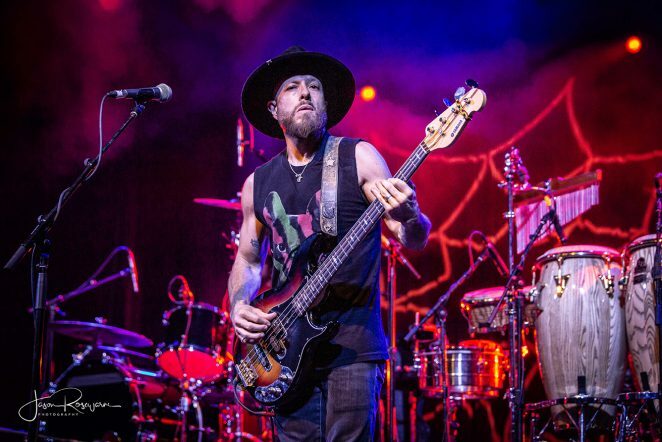 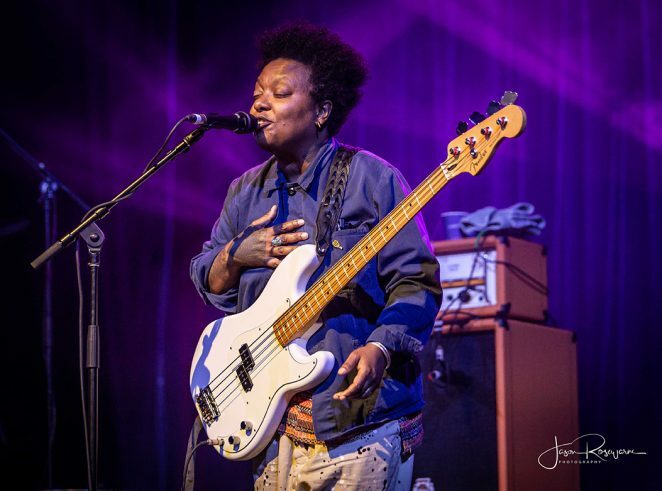 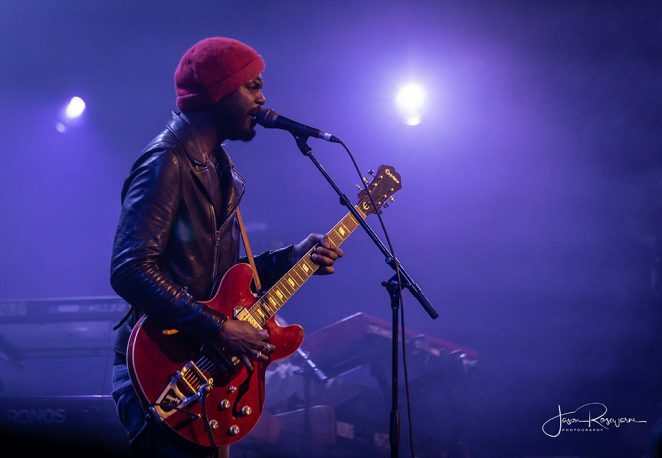 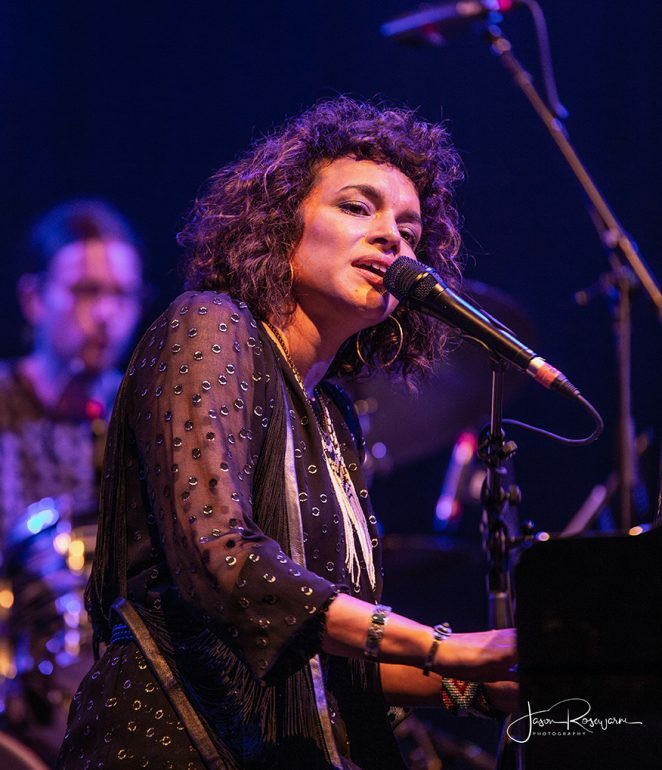 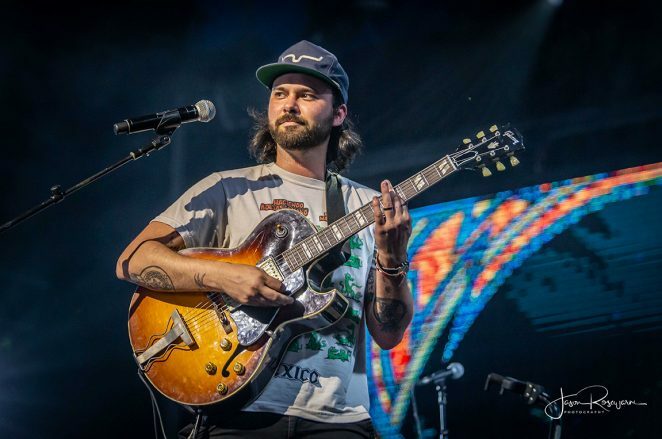 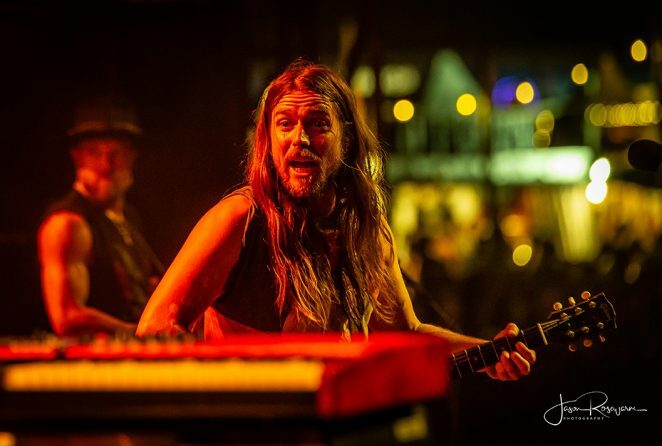 Going through for a look and jam were members of Allen Stone and Marcus King’s band as well as Jon Deas, the keyboard player from Gary Clark Jr’s band. 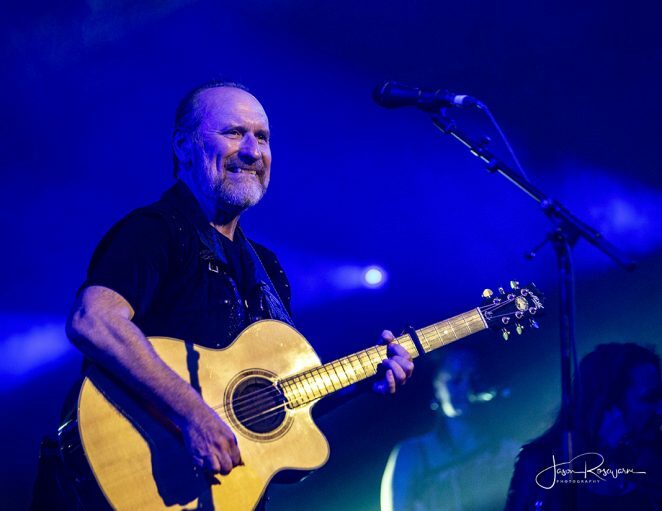 Later on Colin Hay’s band dropped by for a play too. 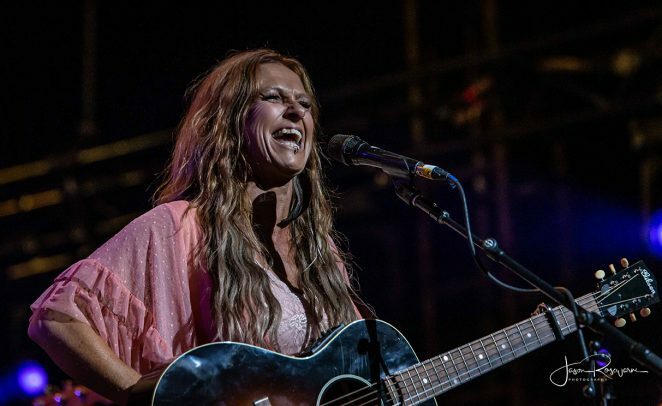 Back at the Crossroads tent Kasey Chambers was putting on one of the most inspiring performances ever witnessed at Bluesfest. 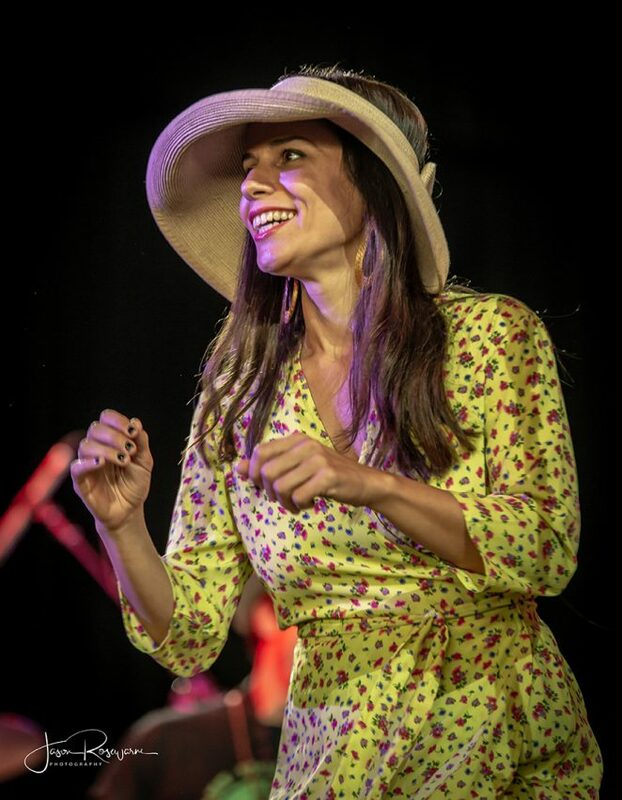 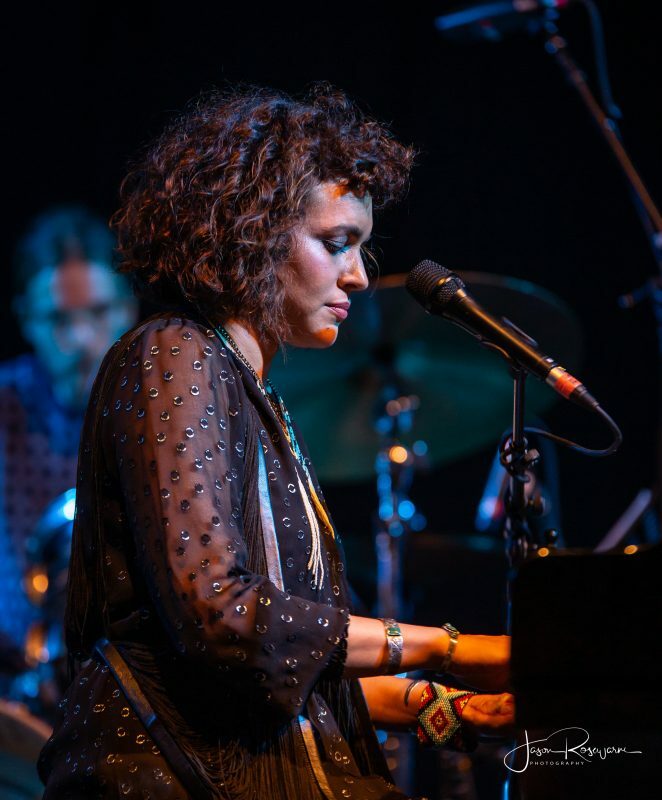 Featuring special guests Ben Harper, The War And Treaty, and The Veronicas, Kasey belted out her soul-stirring brand of alt-country rock and had the audience cheering long after she’d finished. 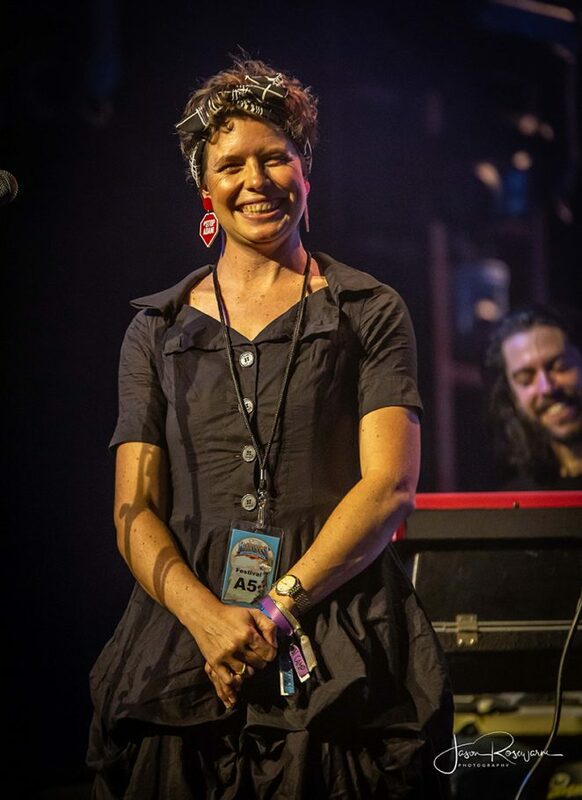 Peter Noble came to the stage to present Kasey with a special ‘star’ award in recognition of her long-standing service to Bluesfest and the Australian music scene in general. 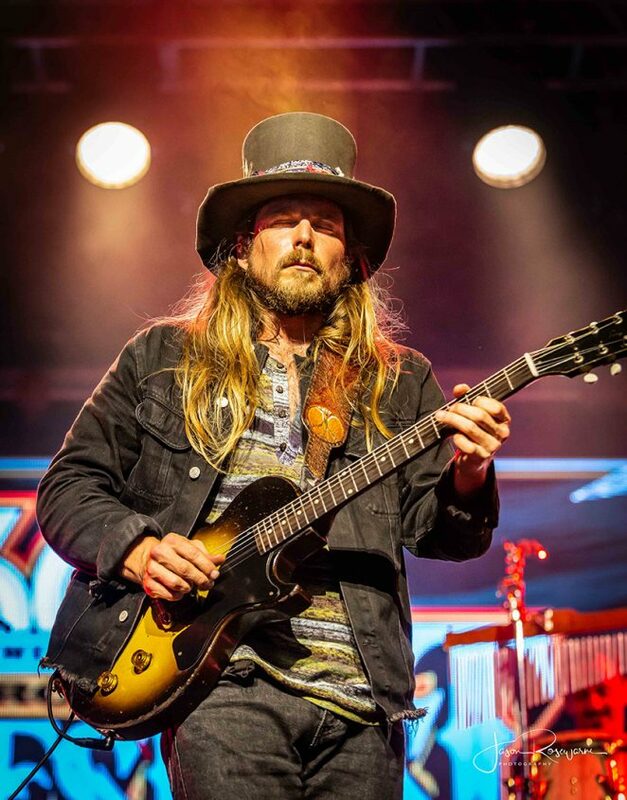 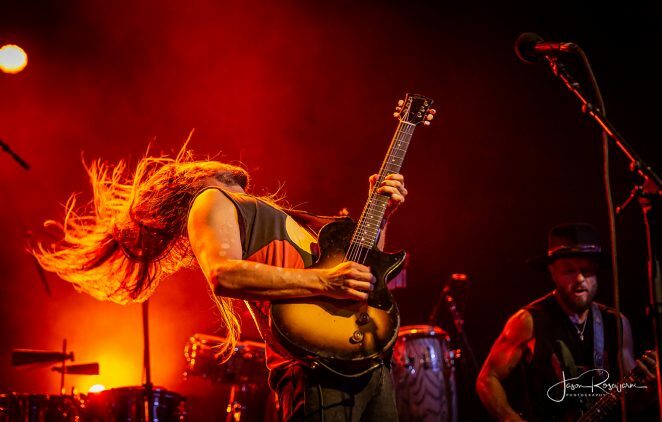 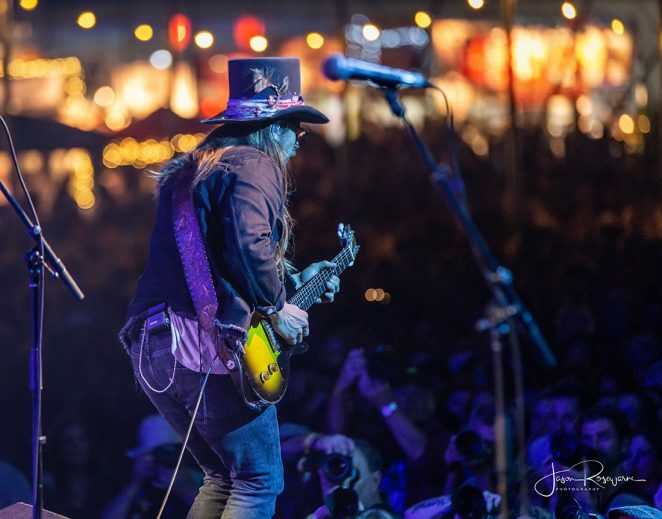 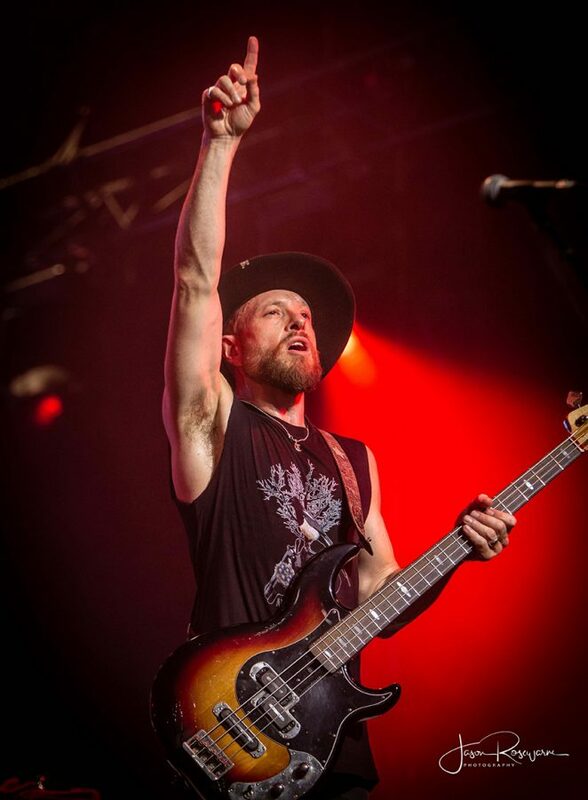 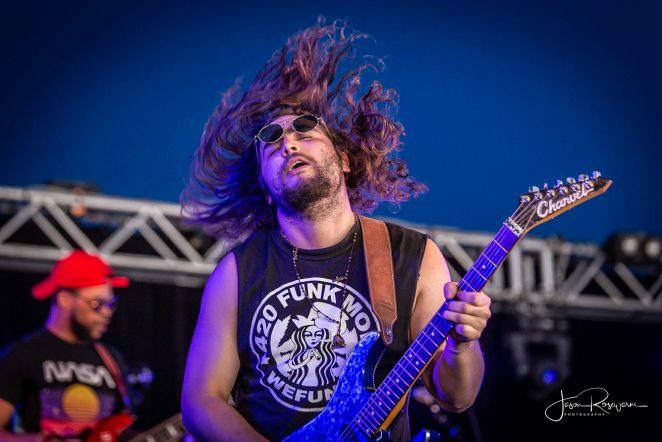 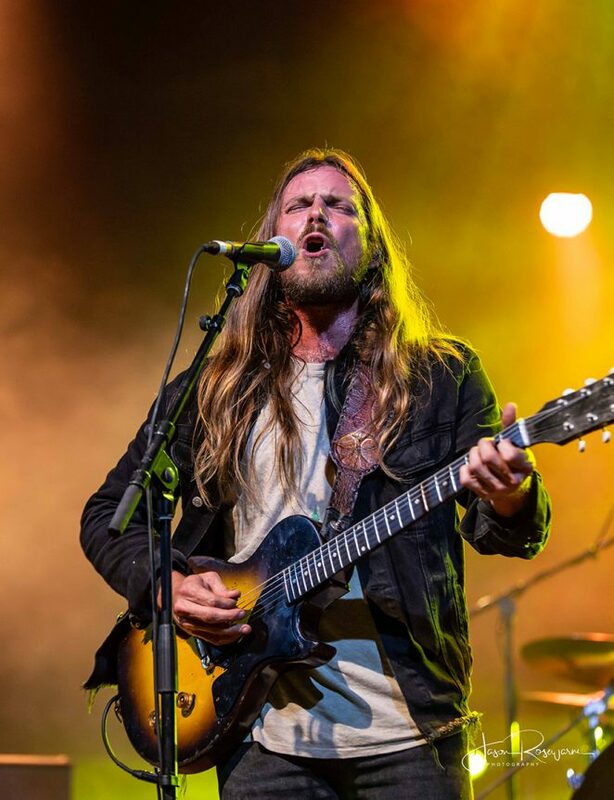 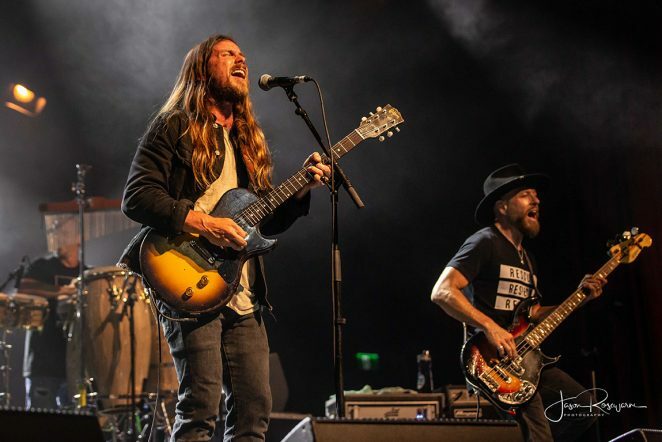 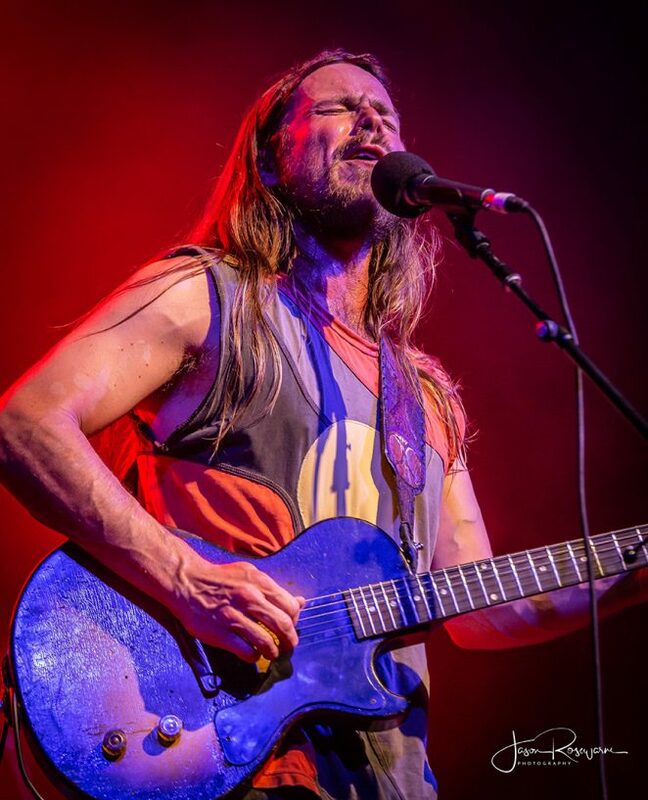 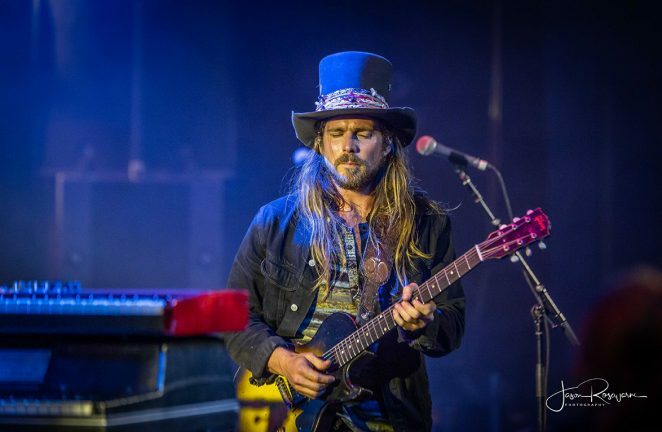 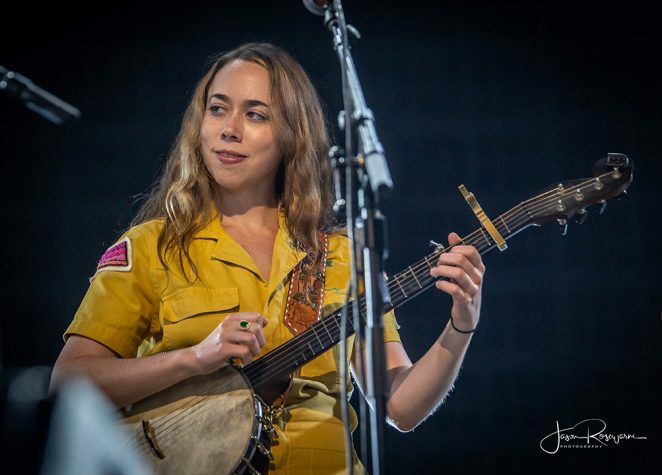 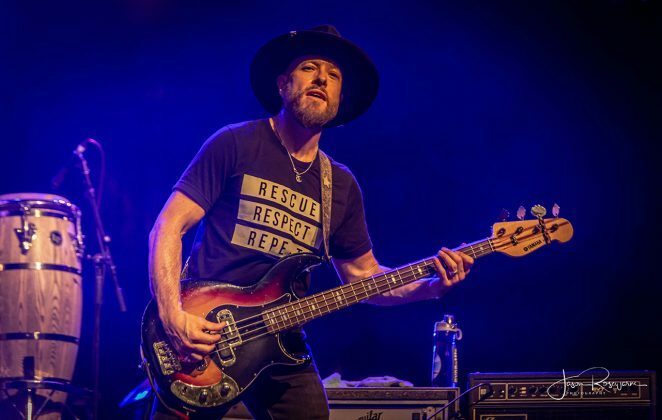 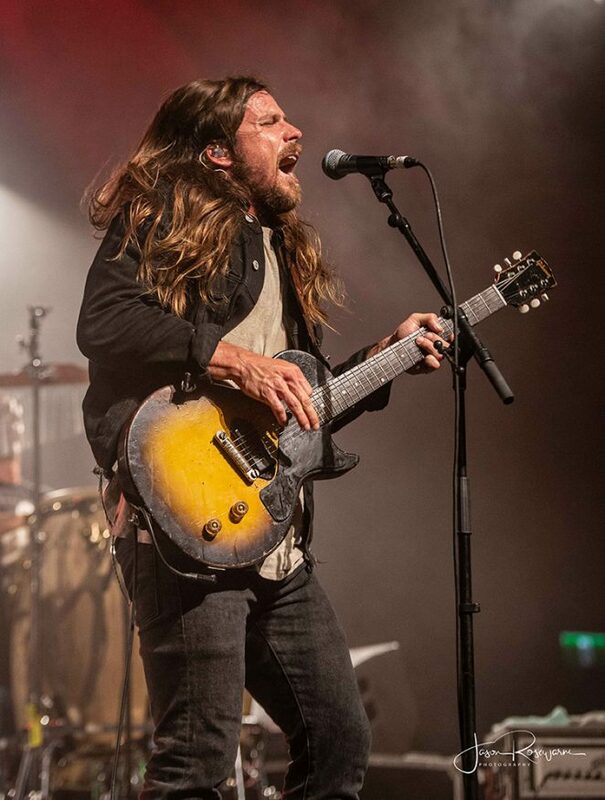 Lukas Nelson & The Promise Of The Real made their first Bluesfest appearance for 2019 and took no time in delivering a blistering set to an adoring crowd. 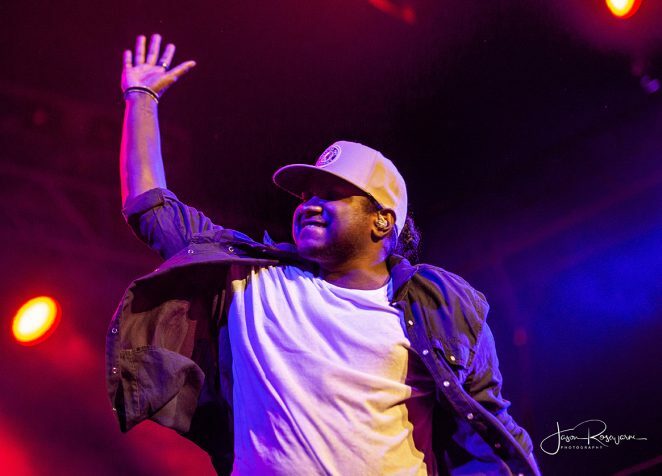 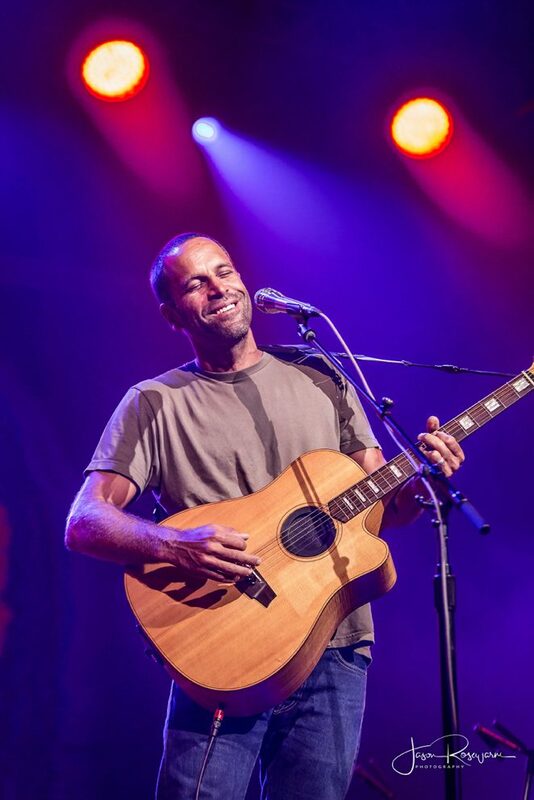 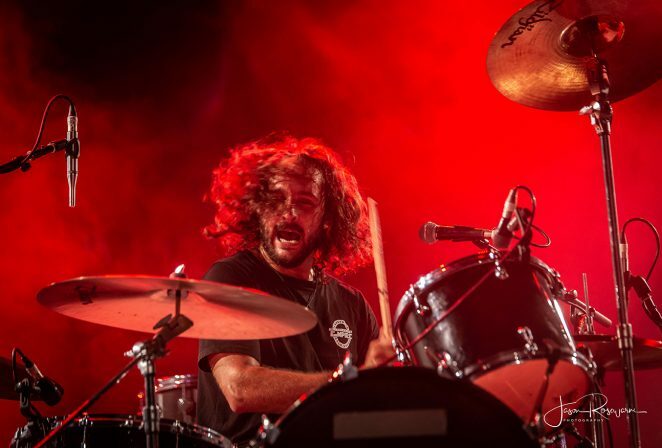 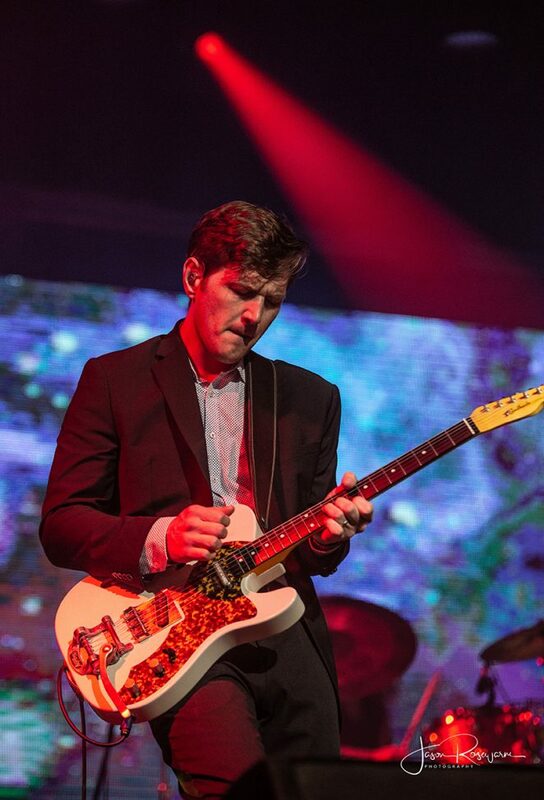 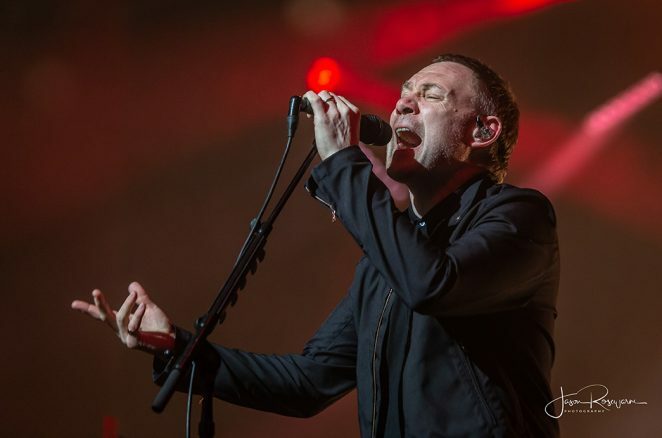 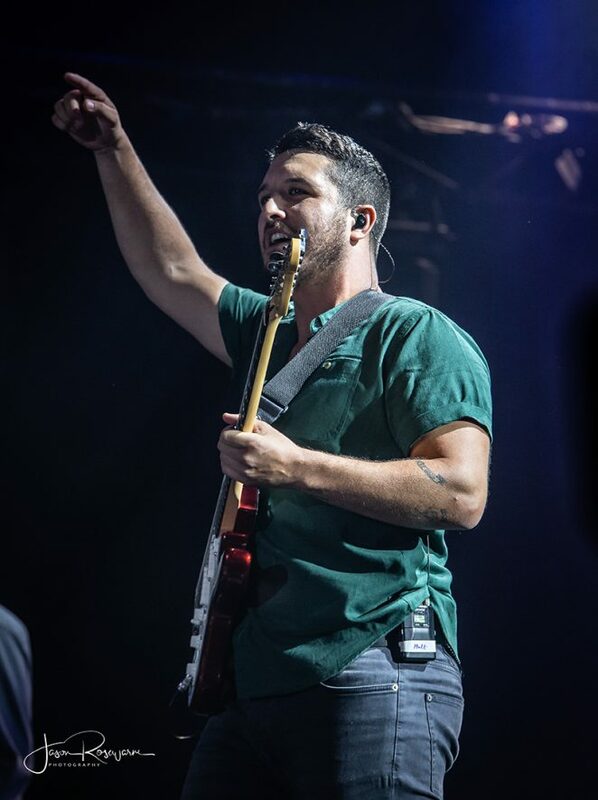 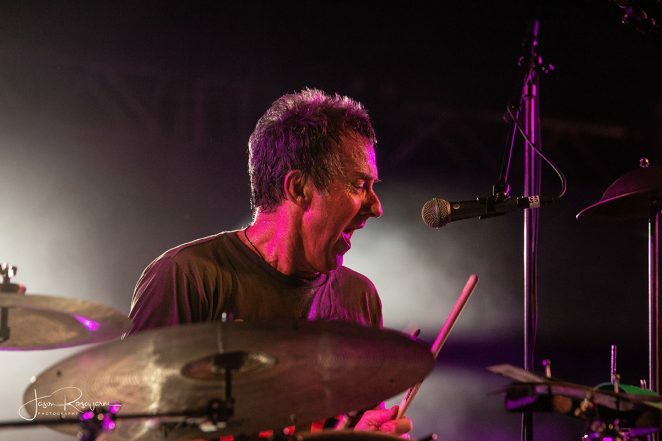 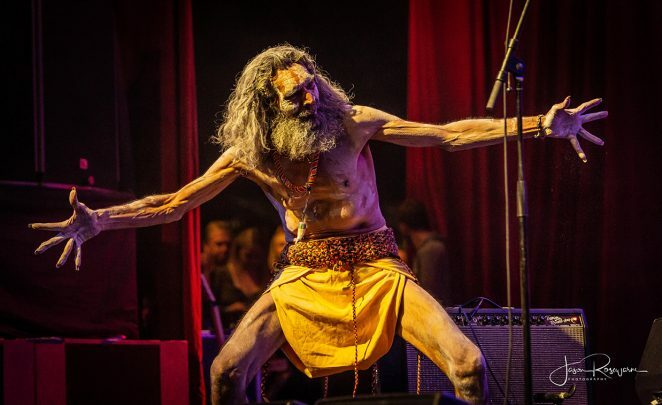 Our ace photographer Jason Rosewarne had rare side stage access, so check out the photos below. 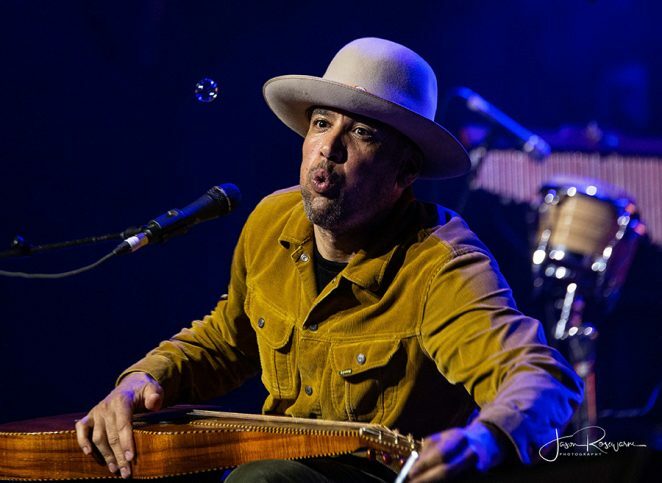 Ben Harper & The Innocent Criminals followed, another Bluesfest fave, invited along to help in the 30th anniversary celebrations. 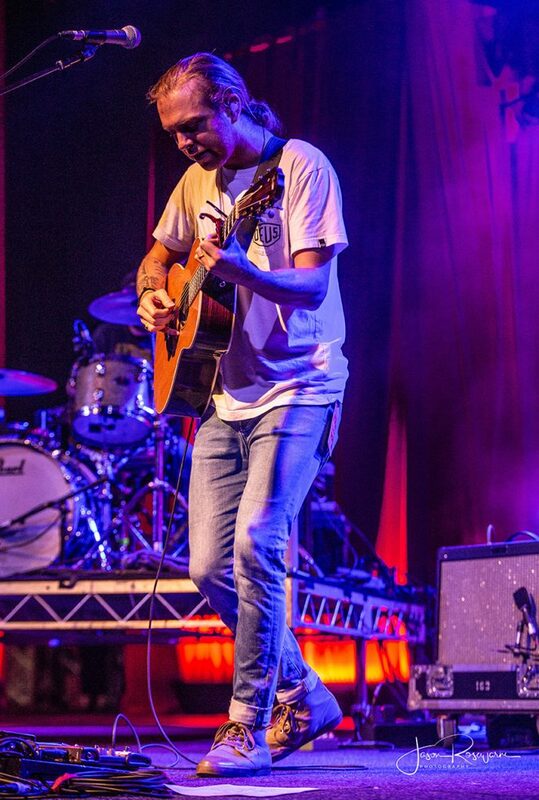 Ben and band always deliver something special and tonight was no exception. 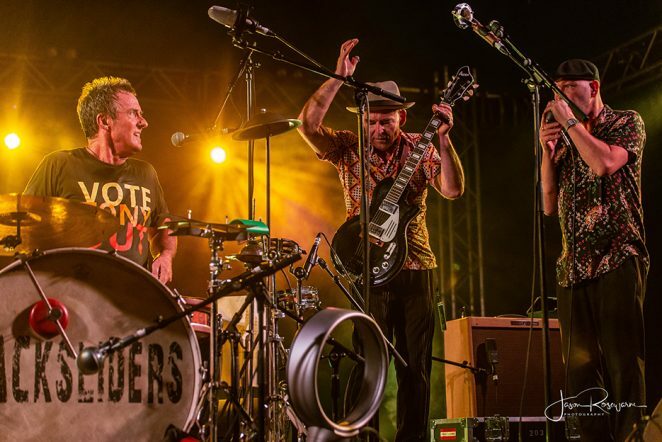 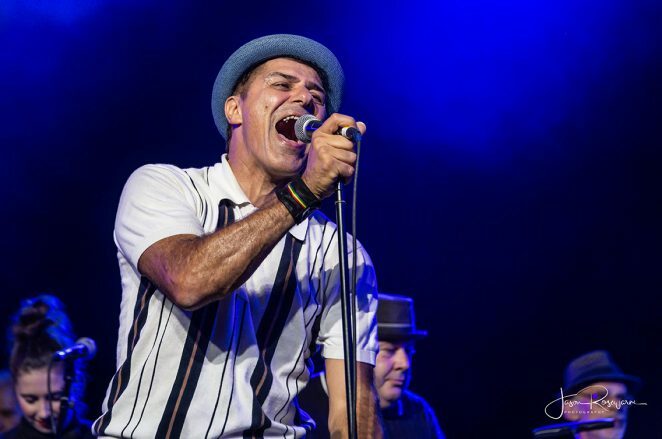 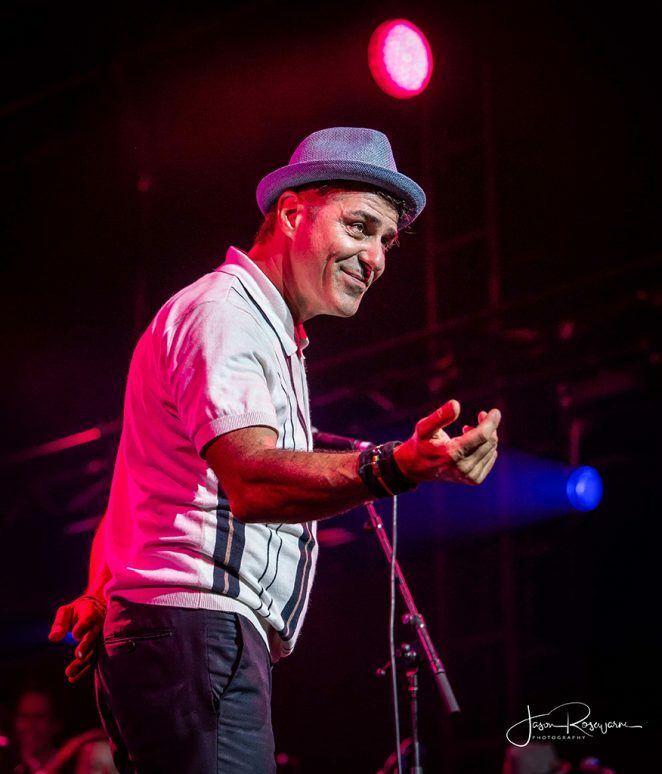 Elsewhere Little Steven and the Disciples of Soul were blowing minds, Melbourne Ska Orchestra were creating fun and Flogging Molly were gettin’ jiggy! 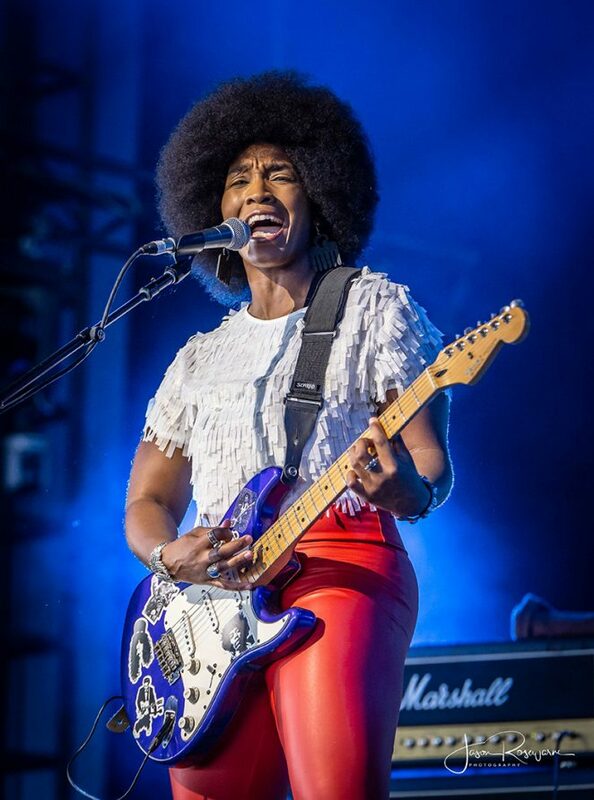 Good Friday, day two of Bluesfest generated a larger crowd and also a significant downpour of rain. 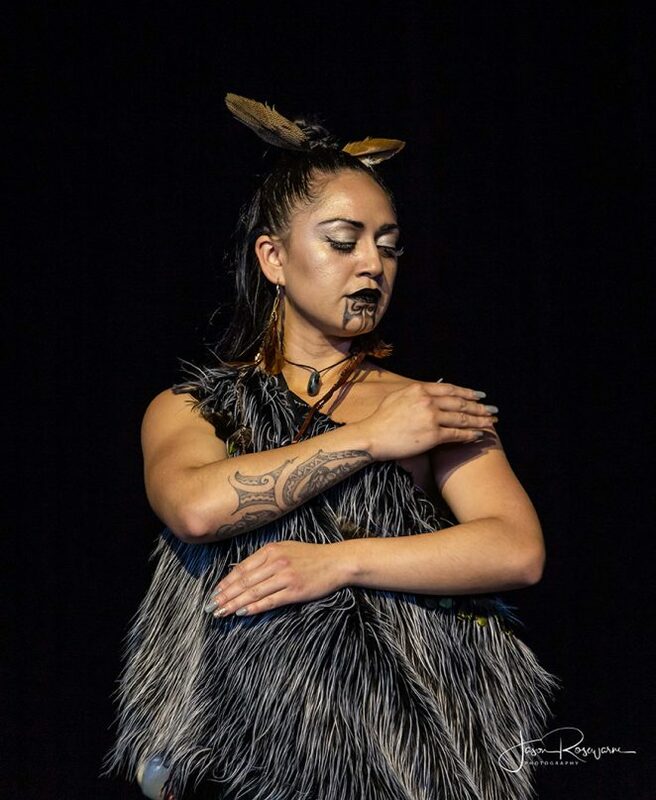 What may have been problematic for the punters became a bonus for the artists as every undercover performance space was packed. 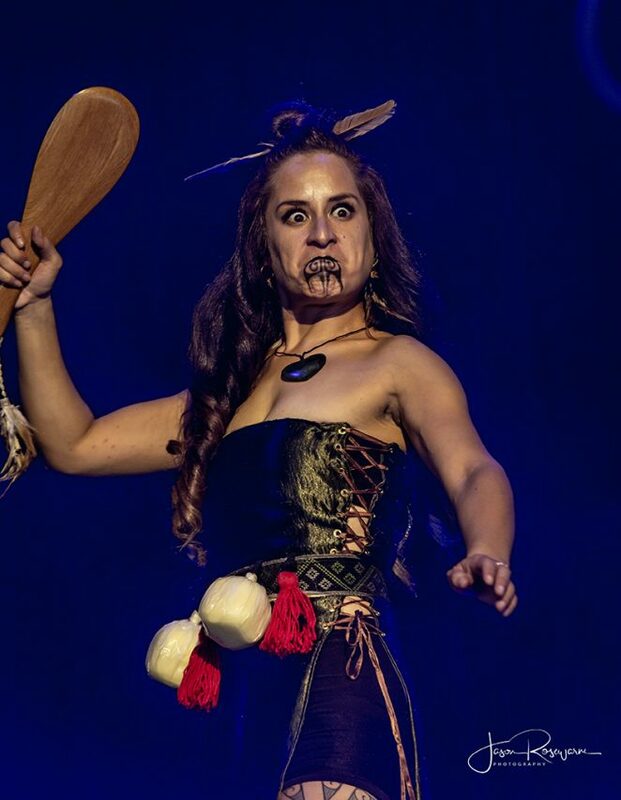 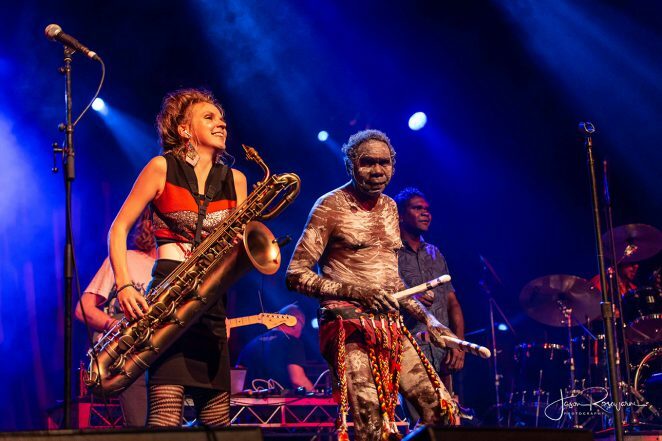 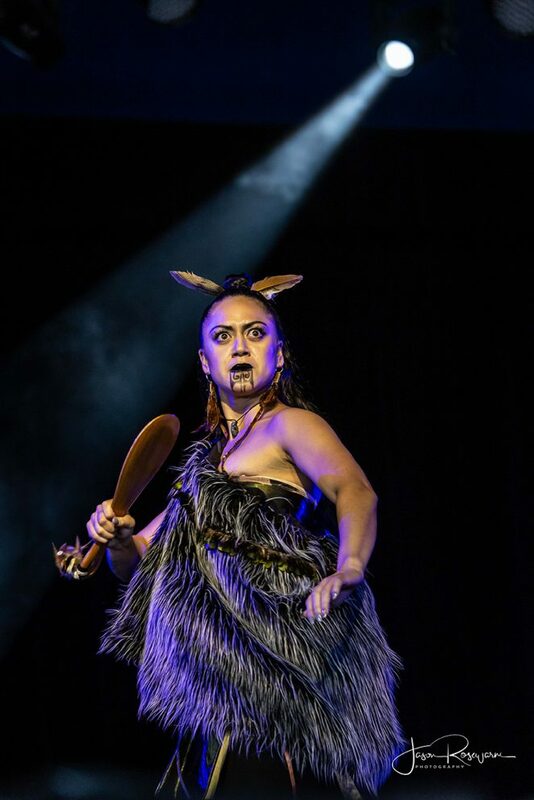 Bundjalung country’s own Indigenous Arts & Culture Festival, Boomerang Festival is back at Bluesfest for 2019 and offered up the Bunyarra Dance Group as a stellar way to begin your day two. 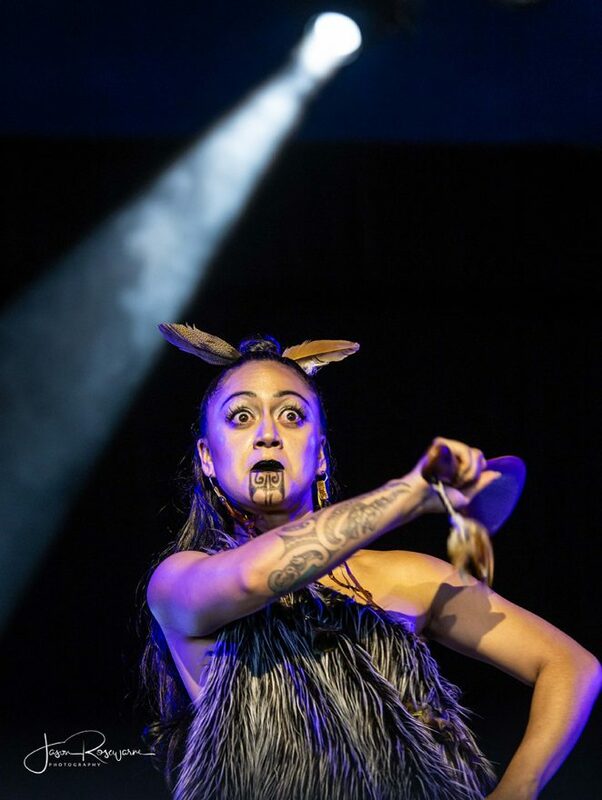 Also presented in the morning were the Saltwater Dubai Weaers Group’s Dandi Weaving workshop and Rako dance workshop for those seeking some cultural activity. 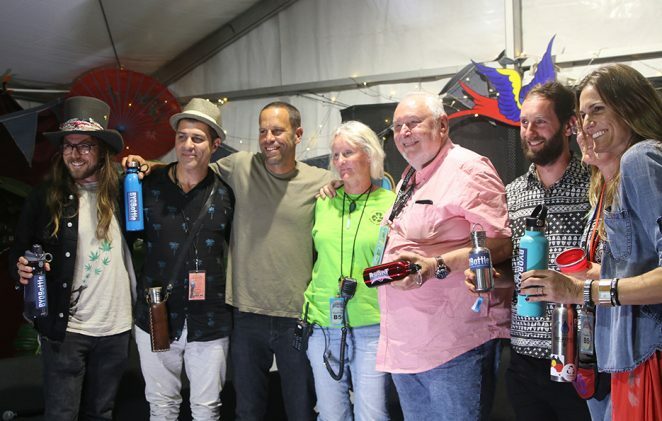 Early birds to the event also got to experience the funky Electrik Lemonade, winners of this year’s 2019 Busking competition. 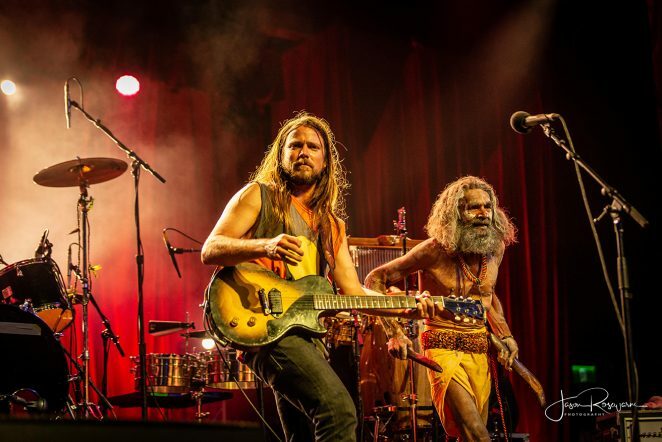 The band has just released their debut album. 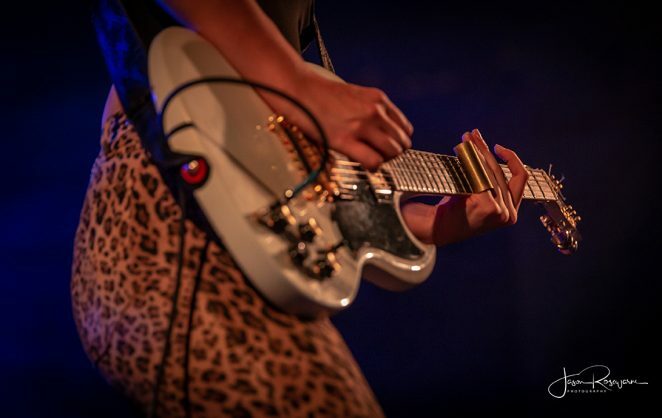 You can check them out at www.electriklemonade.com. 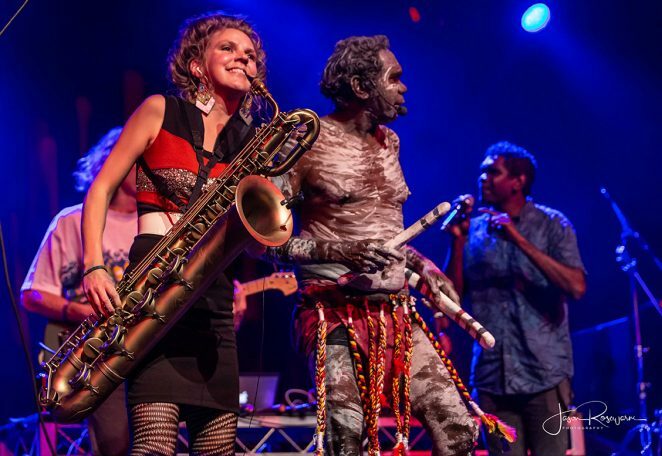 Australian Musician was keen to experience Mama Mihirangi & The Mareikura. 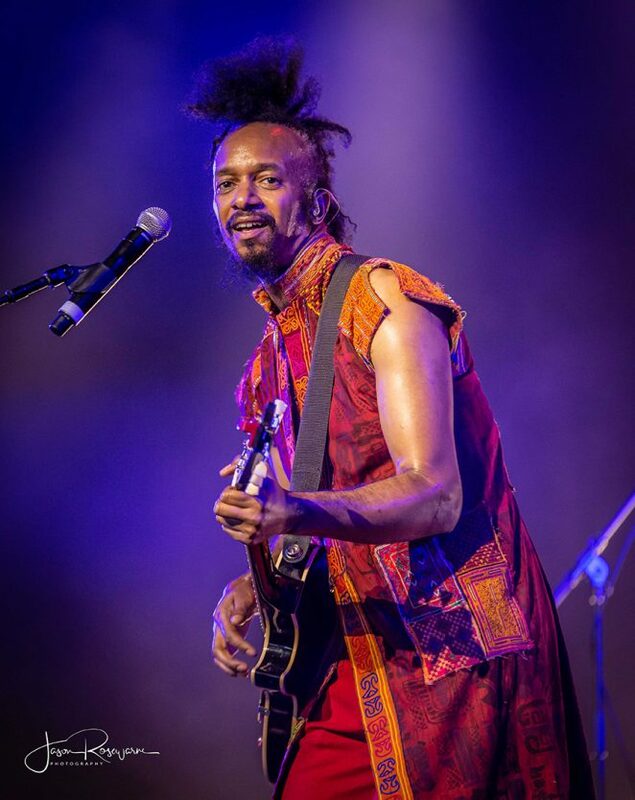 Having seen Mihirangi more than decade ago at a music trade show playing solo with just a loop pedal, today’s extravaganza was a revelation. 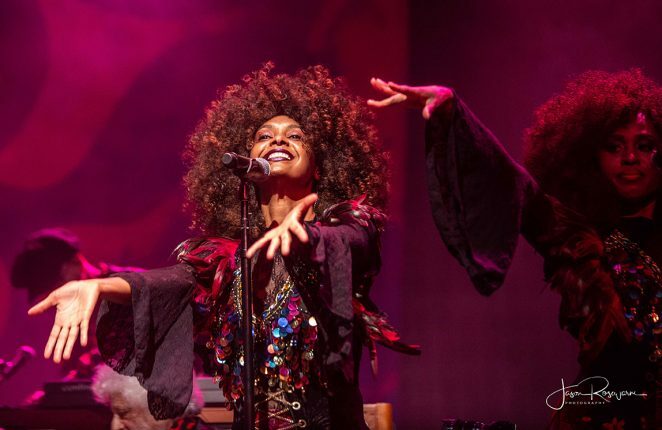 Gorgeous harmonies and a visually stunning performance. 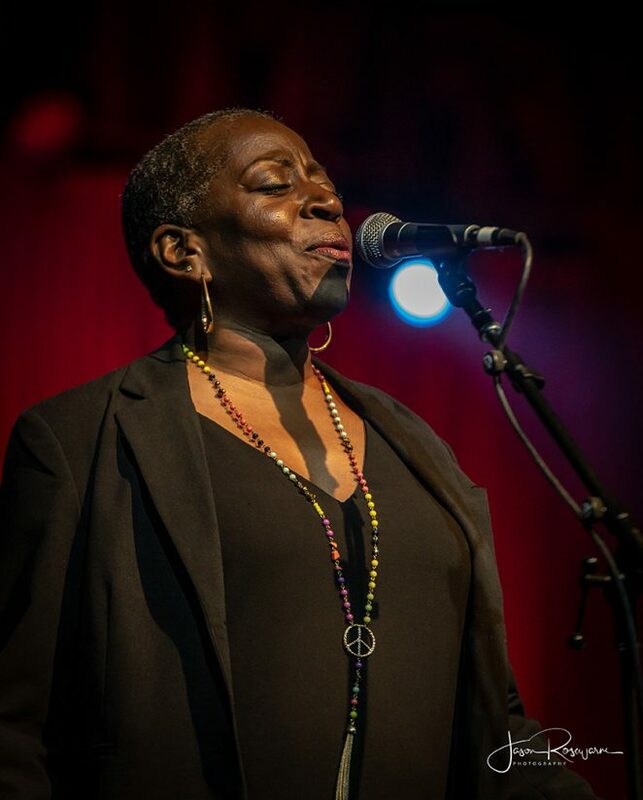 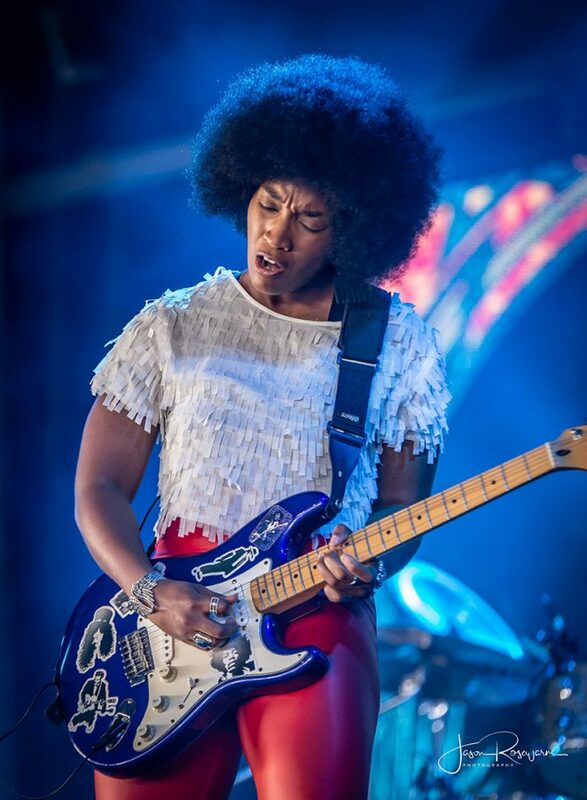 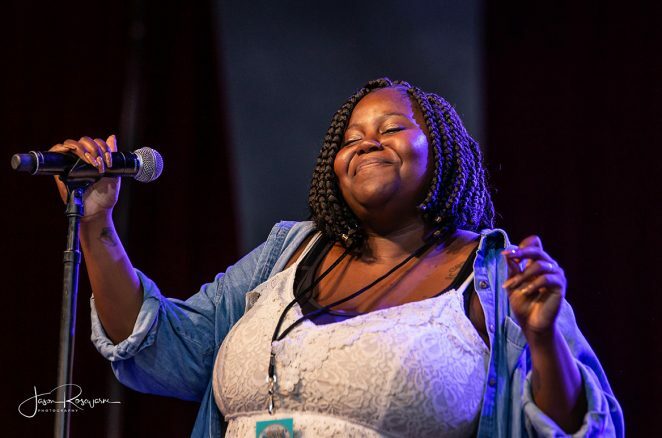 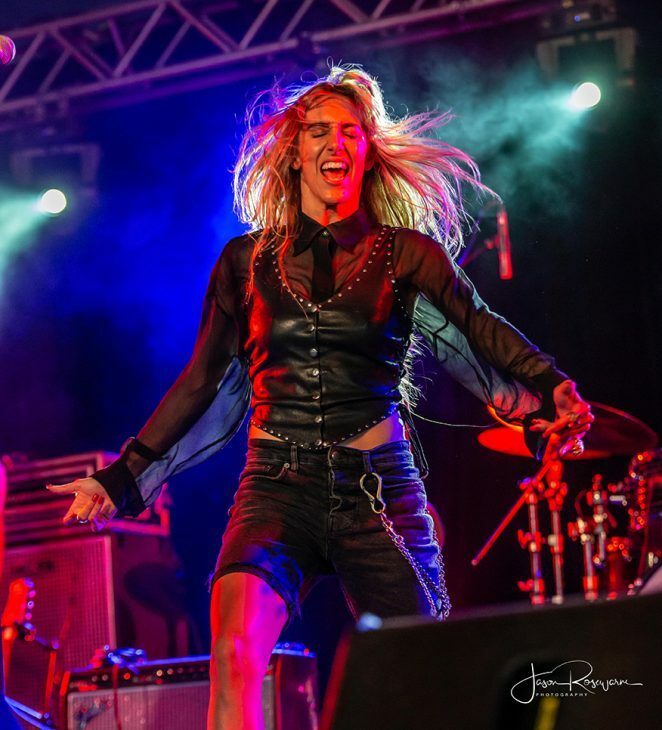 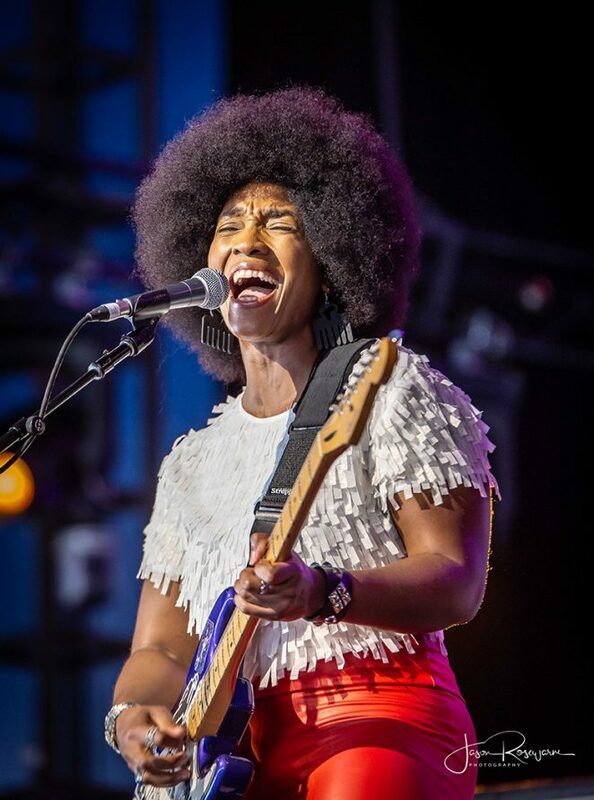 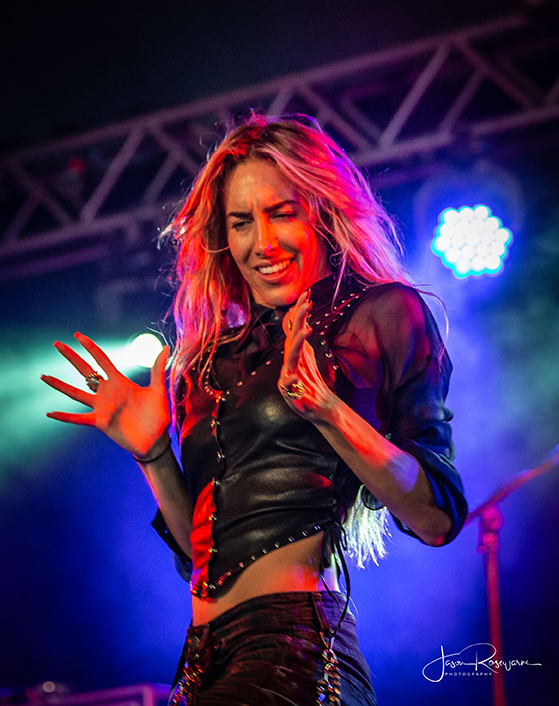 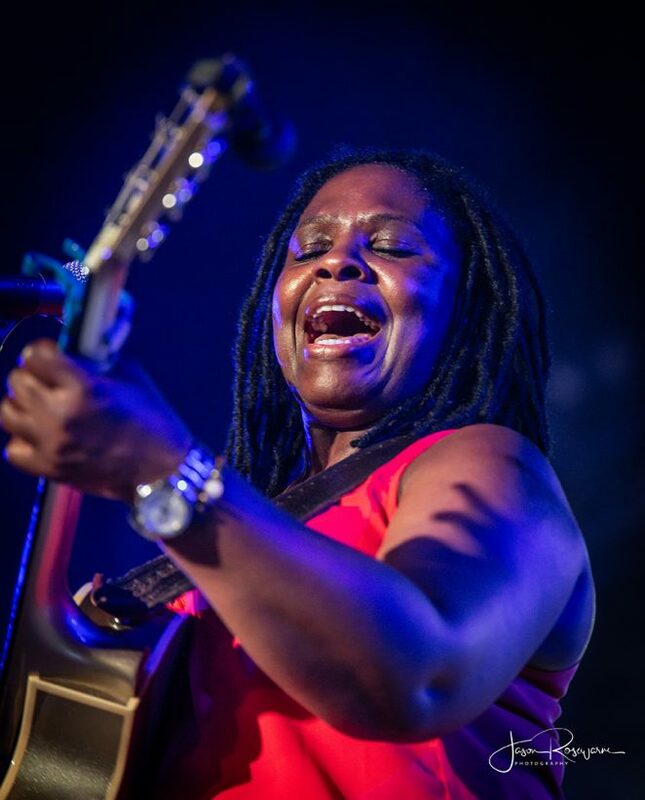 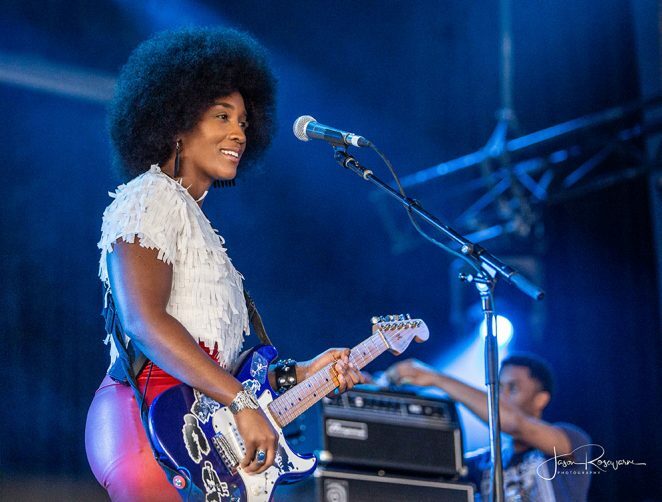 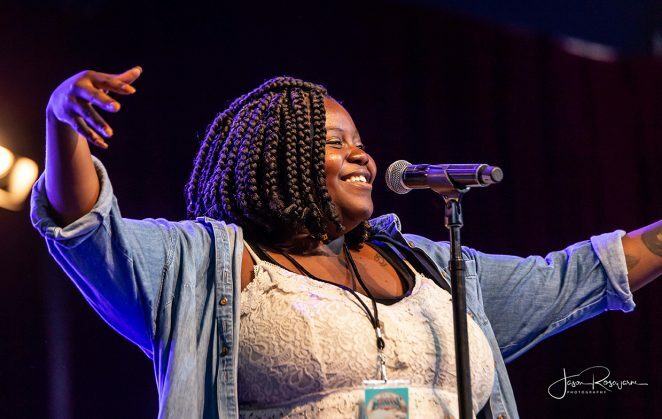 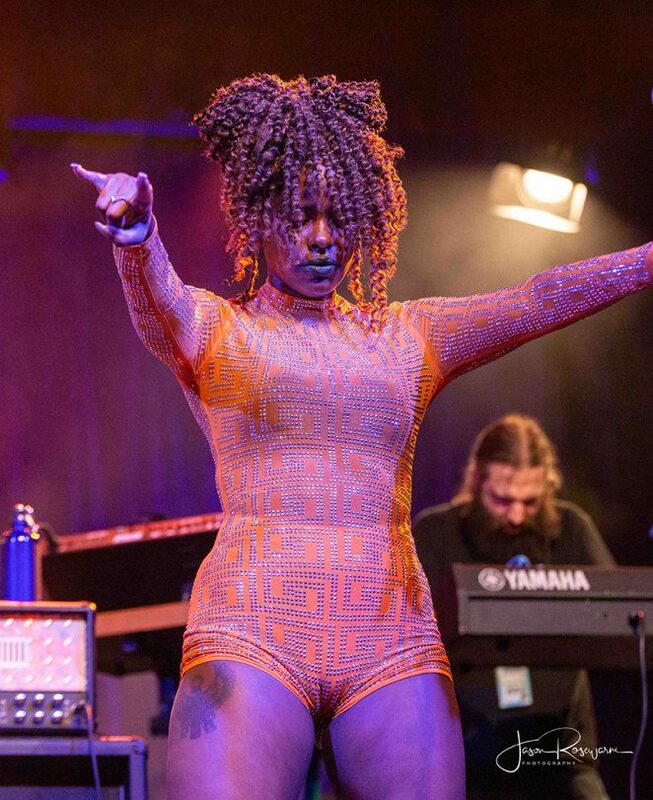 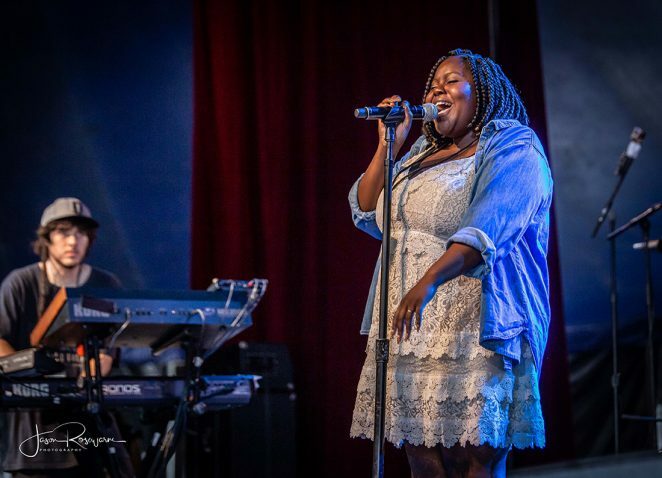 Chicago’s Melody Angel was back on the Bluesfest stage, enjoying one of her favourite festivals and participating in signings and a community radio live to air interview sessions. 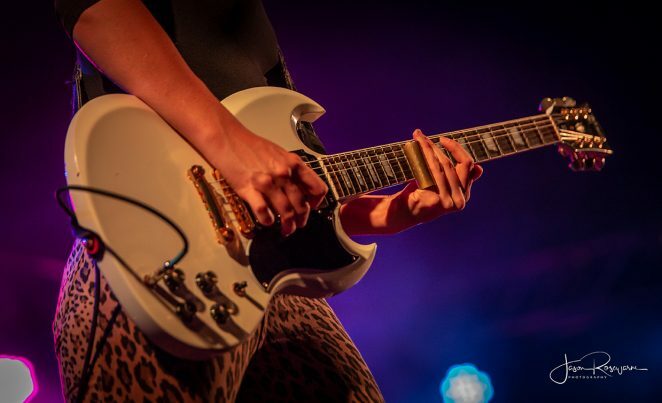 Melody’s sound packs more and more punch with every performance. 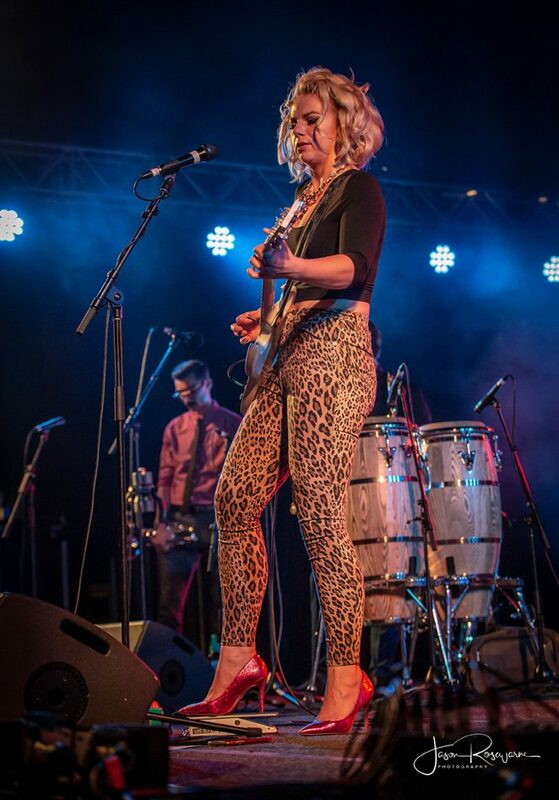 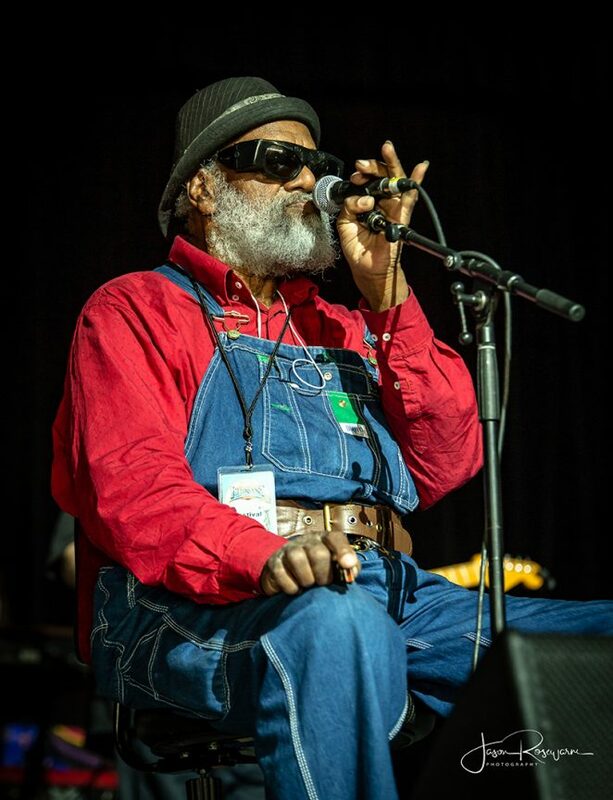 Soon after an interview with Australian Musician, Hussy Hicks played the Juke Joint stage, their 6th time on the bill for Bluesfest. 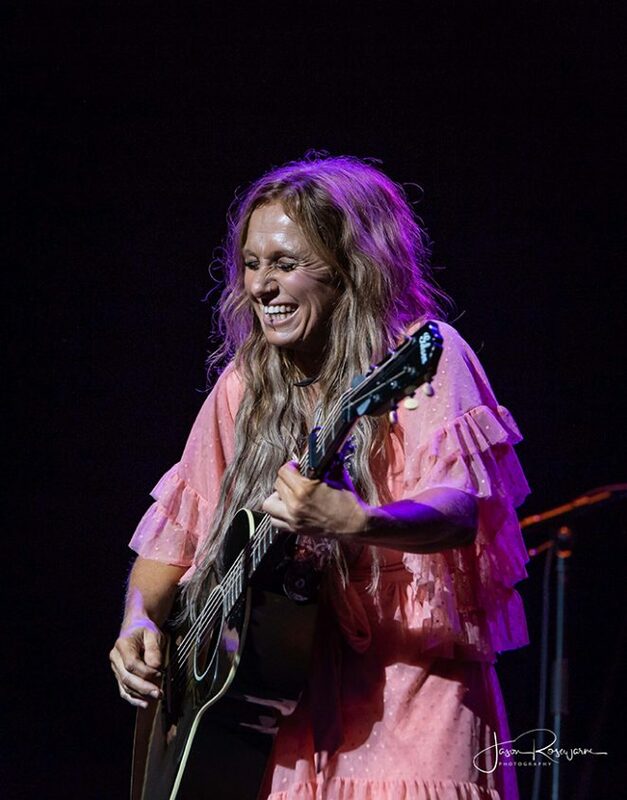 As usual Leesa and Julz put in a fabulous set full of passion and fun, playing material from their current album On The Boundaries and the new single Get Ready. 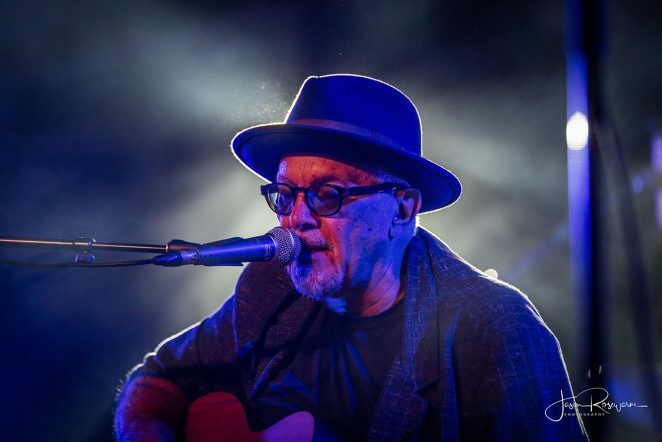 Even Julz’ dad Greg got the chance to get up for a little harmonica blown’. 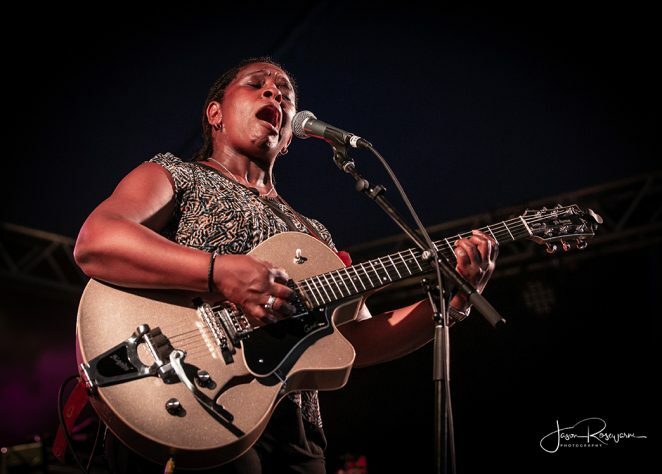 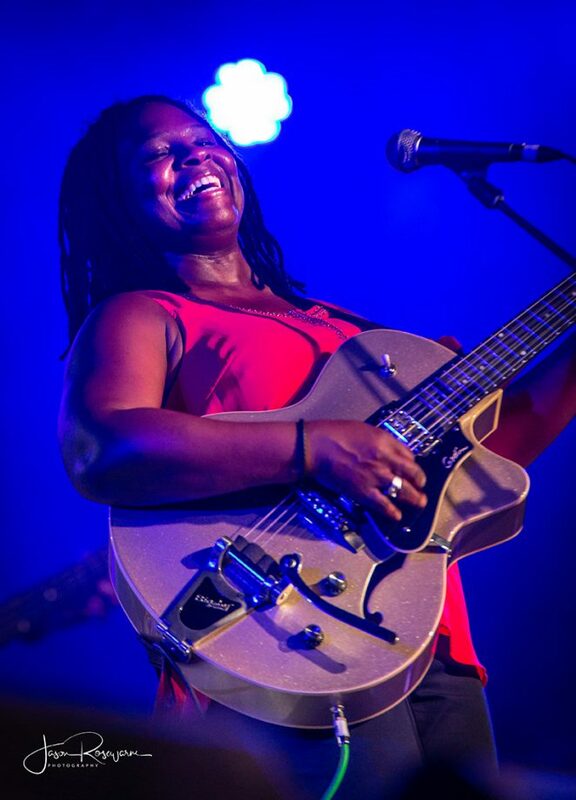 Direct from an impromptu private performance in the Byron Music tent for the Fender guitar folks, Bluesfest regular Ruthie Foster took to the Juke Joint stage to feed us some of her enticing roots music. 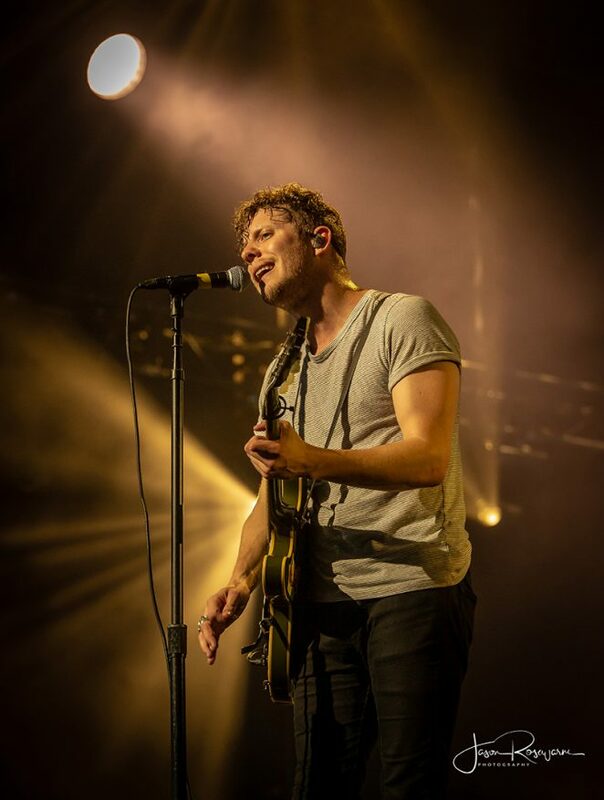 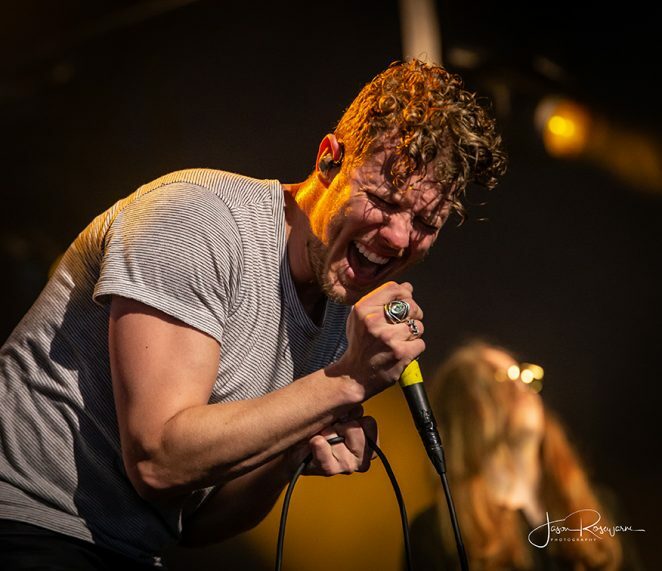 Anderson East might look like he belongs in a cool indie alt rock band but the Alabama-native presents a potent brand of southern style blues rock and soul. 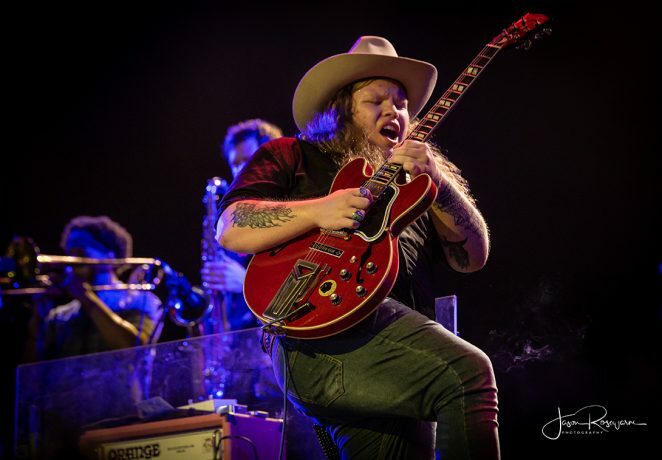 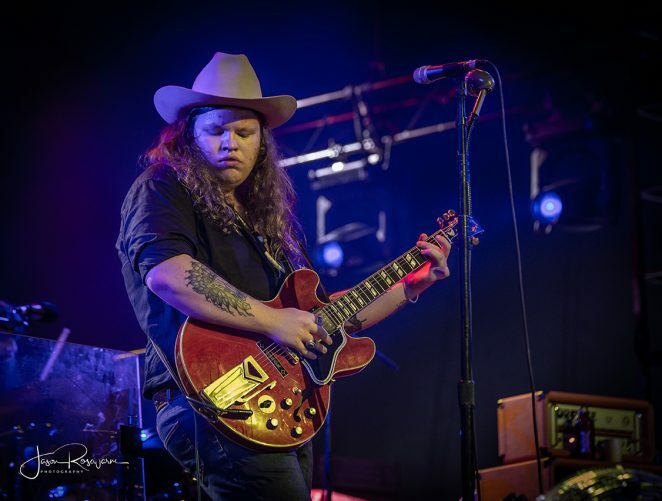 The Marcus King Band’s variety of blues is fierce, an Allman Brothers vibe on steroids. 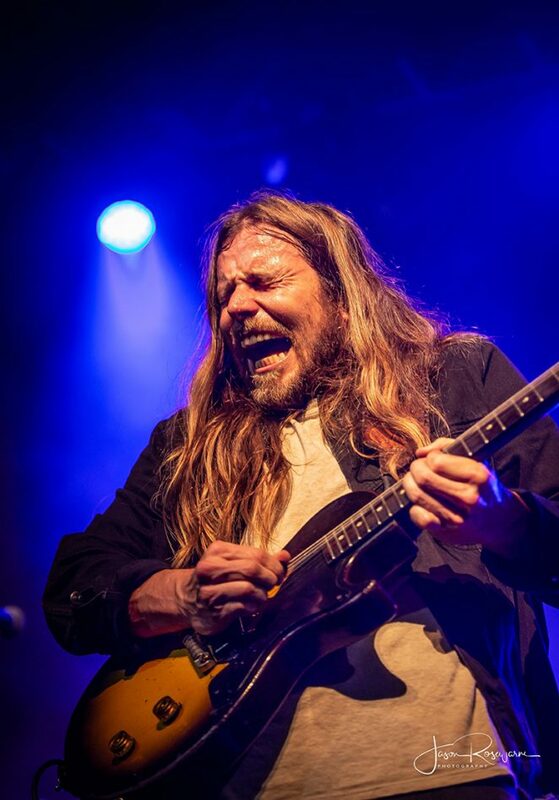 Clearly the South Carolina blues act was delighted with their Bluesfest welcome. 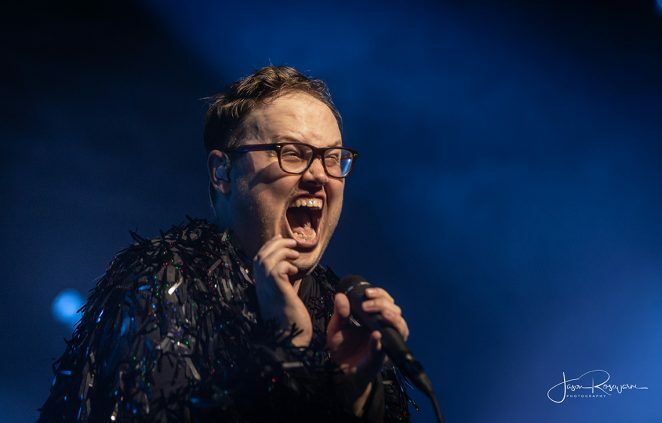 When we spoke to St Paul and the Broken Bones frontman Paul Janeway in a phone interview prior to this year’s event, the amiable vocalist told us how taken aback the band was with their reception the first time they played this festival. 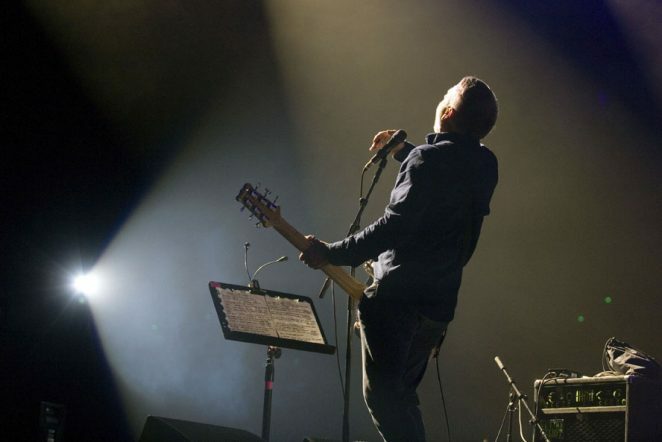 It seems today they were simply continuing on from where they left us as a deafening roar greeted their arrival to the stage. 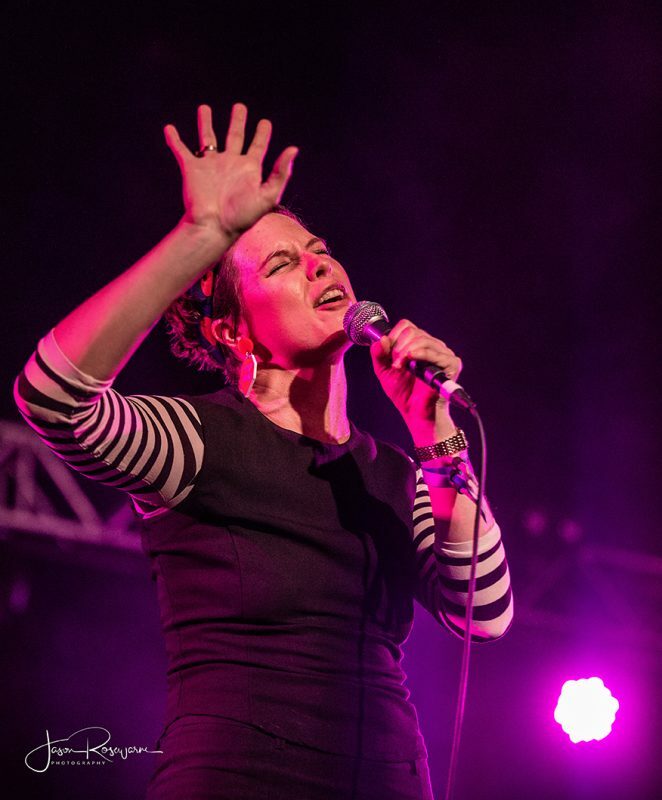 Janeway is the ultimate showman, passionate and intense yet cheeky and entertaining too. 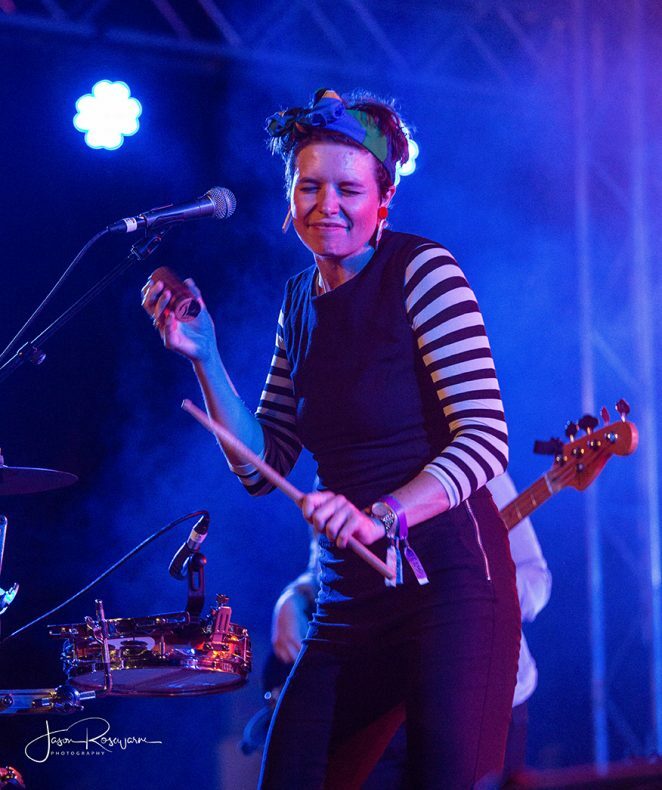 Concentrating on material from their new album Young Sick Camellia, the band has added a dance edge to their heart-melting brassy soul sound, making their music even more infectious. 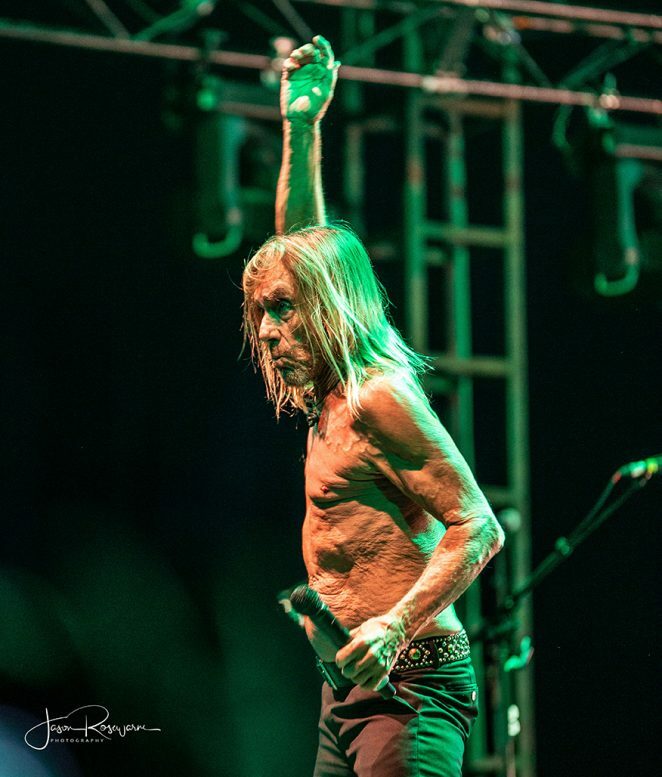 Bluesfest attendees are always spoiled for choices and tonight you could witness Imelda May, Norah Jones, Hozier and Gary Clark JR, all offering exceptional and memorable performances but there was one artist that was on everyone’s mind tonight … the godfather of punk Iggy Pop. 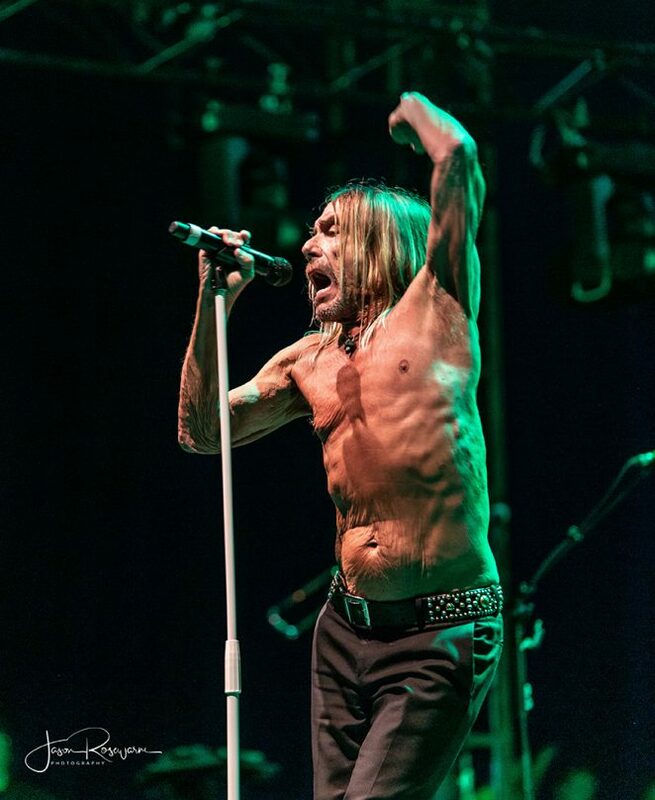 Iggy and The Stooges took to the stage and opened with the classic I Wanna Be Your Dog and the crowd went nuts! 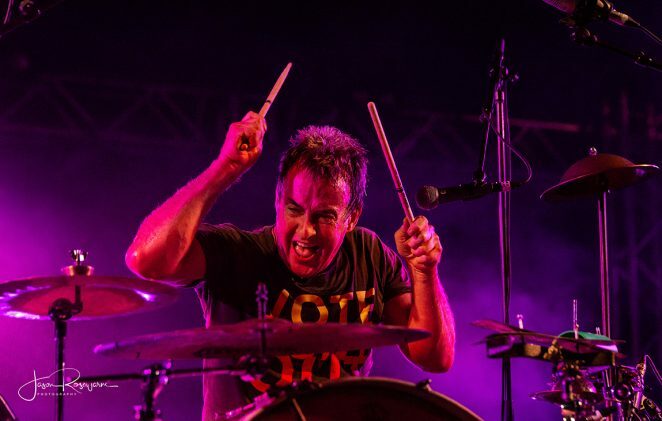 Gimme Danger, The Passenger and Lust for Life followed, taking us to punk rock heaven. 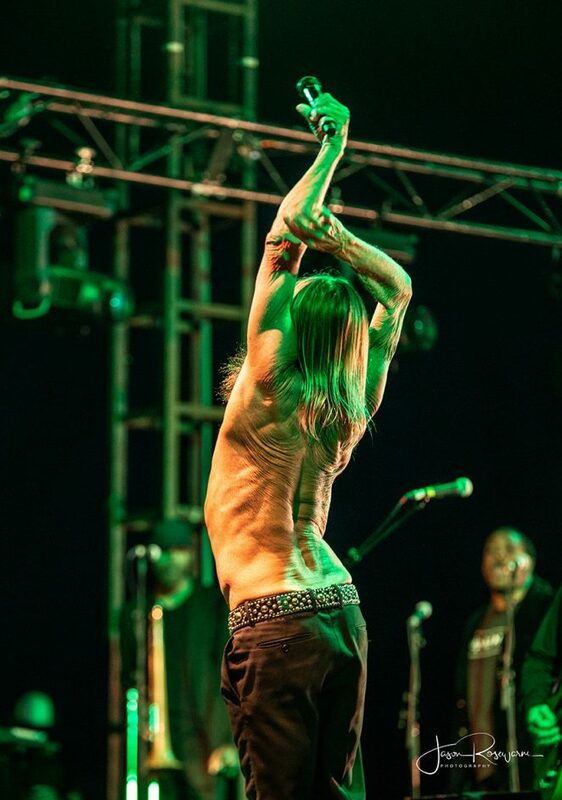 The larger than life, leather-bodied Iggy Pop gave us the classic dances and stances, cursed often and smiled, he was having as much fun as everyone else. 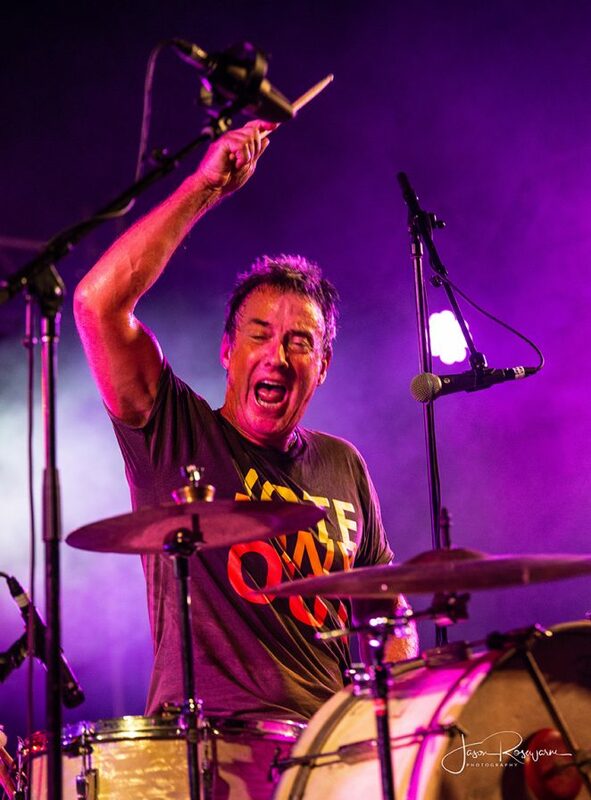 Search and Destroy, TV Eye, the iconic punk anthems kept rolling off the stage and into our hearts. 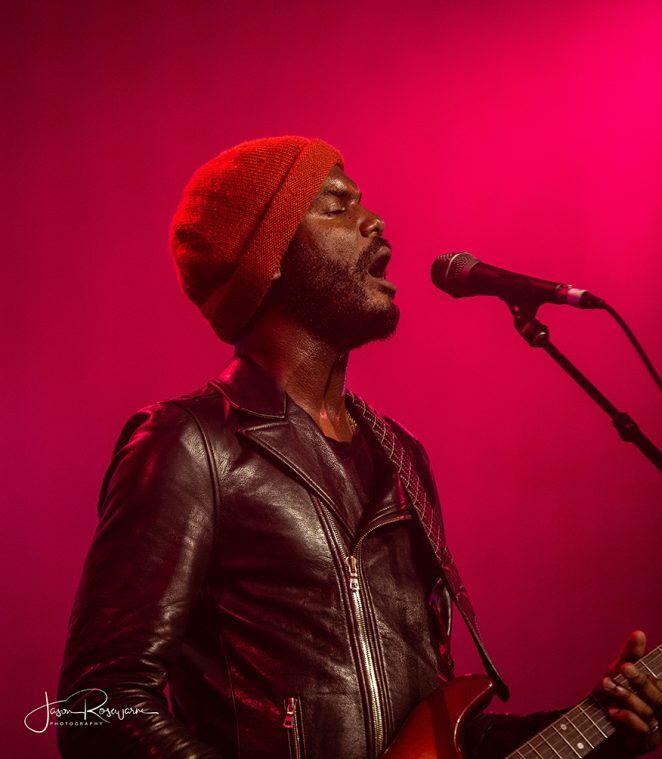 The Jean Genie, a tribute to his lost buddy was punchy and dynamic. 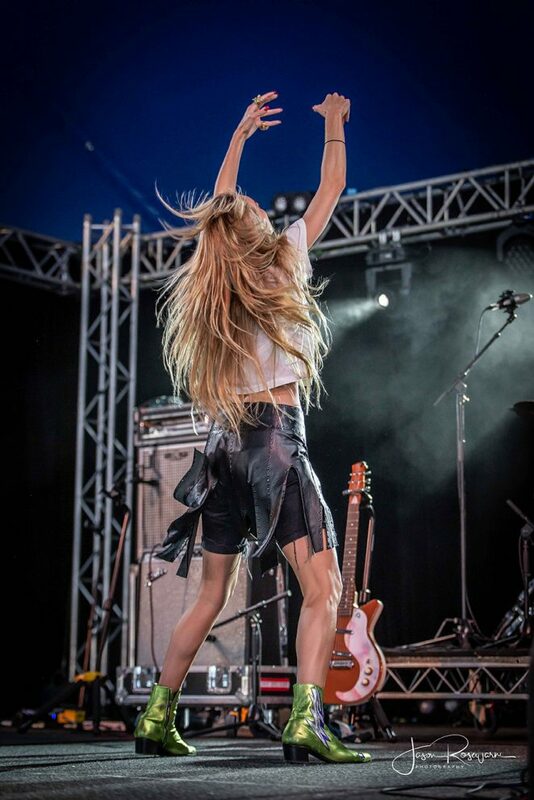 No Fun, Real Wild Child, the ‘hits’ didn’t stop. 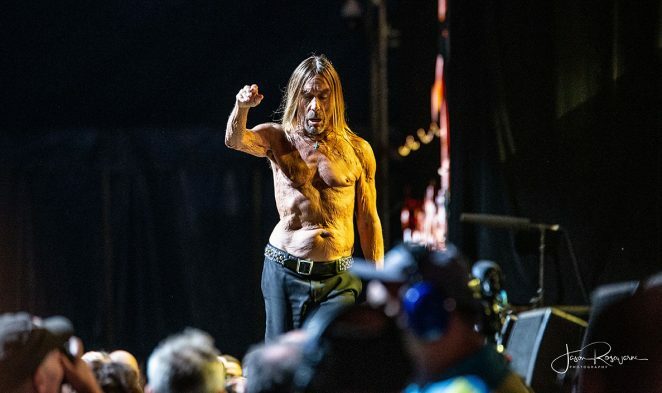 The audience was diverse, made up of those who have worshipped at the church of Iggy Pop punk forever and those who just wanted to be there to tell their friends and family that they saw one of the most iconic performers in rock history. 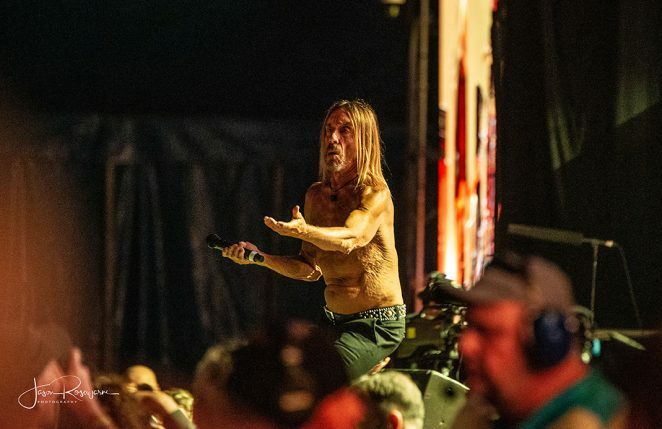 They can now all proudly tell their grandkids they saw Iggy Pop. 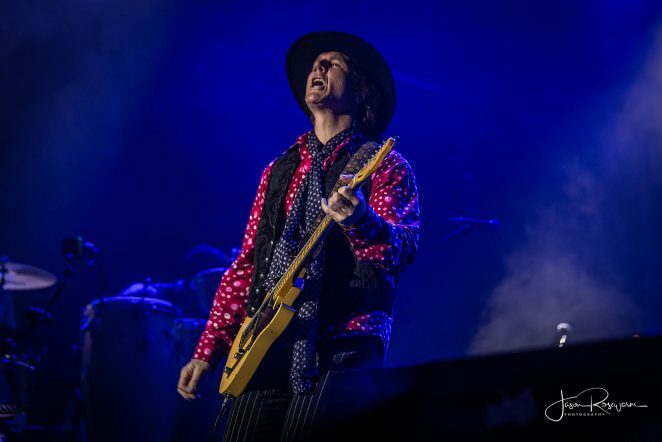 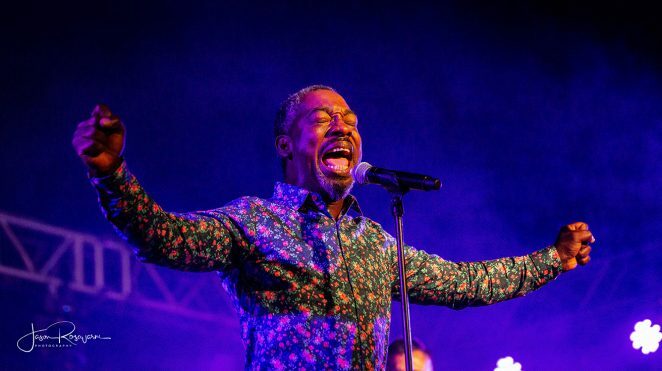 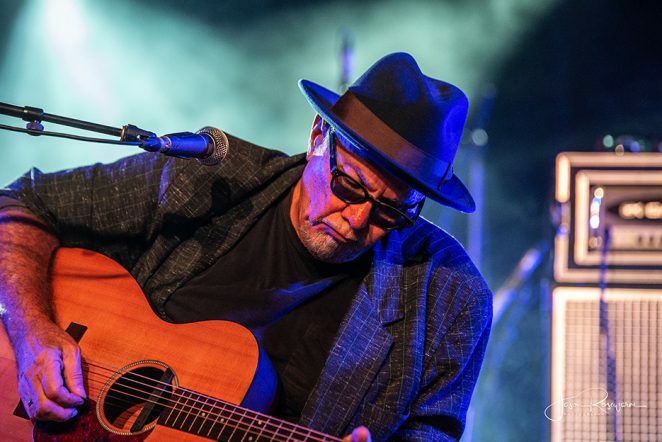 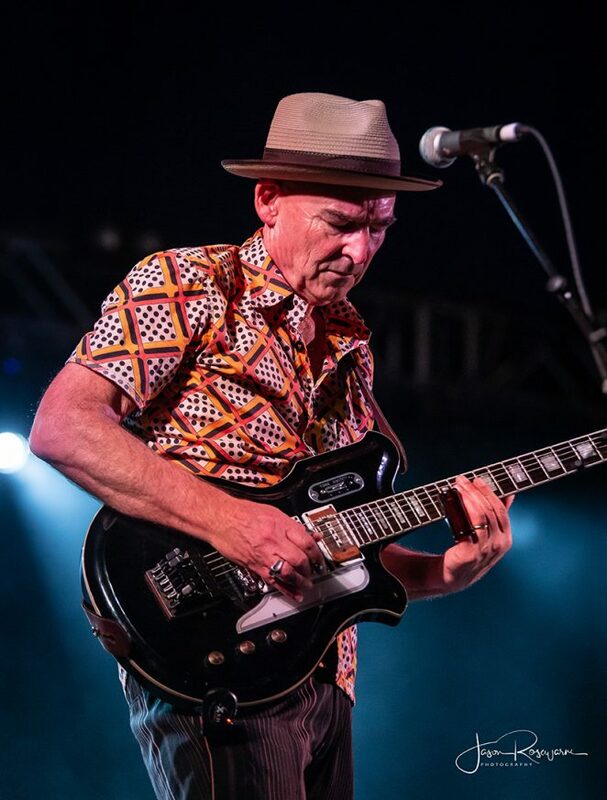 The 30th anniversary of Peter Noble’s Bluesfest was cause to bring old friends together with festival debutantes to celebrate one of the world’s most loved and respected music events. 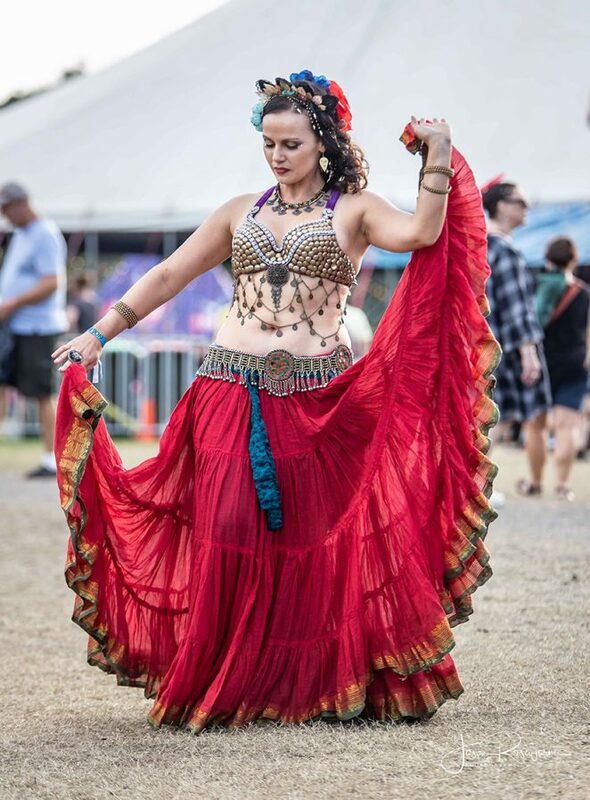 Weather predictions suggested rain throughout the five days yet day one proved that the forecasts can’t be trusted. 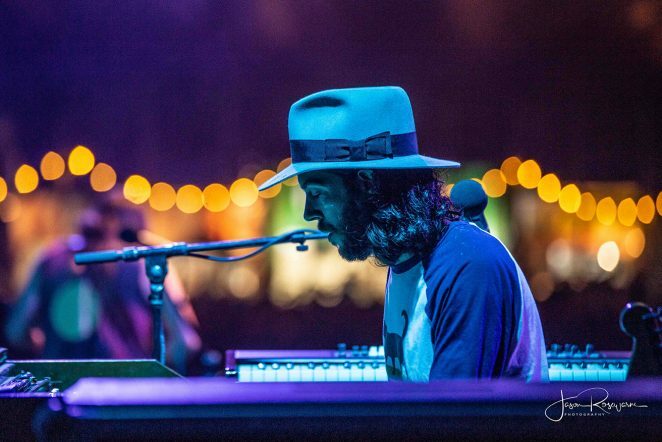 Conditions for the opening day were near perfect. 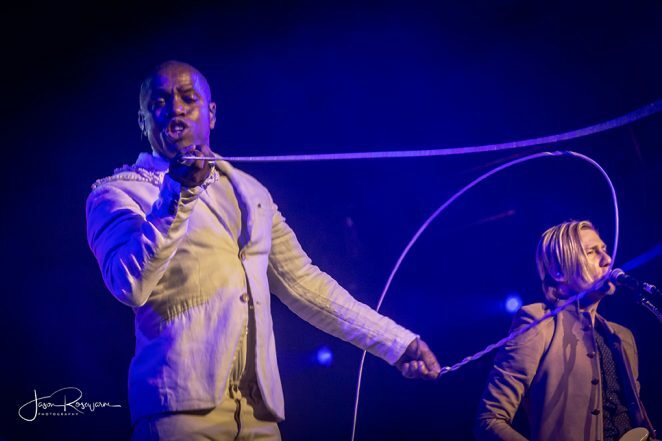 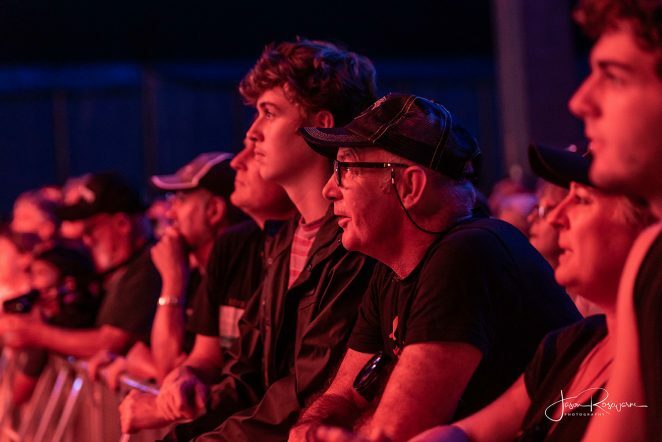 With 5 stages of quality entertainment to choose from, the dilemma is always who to see. 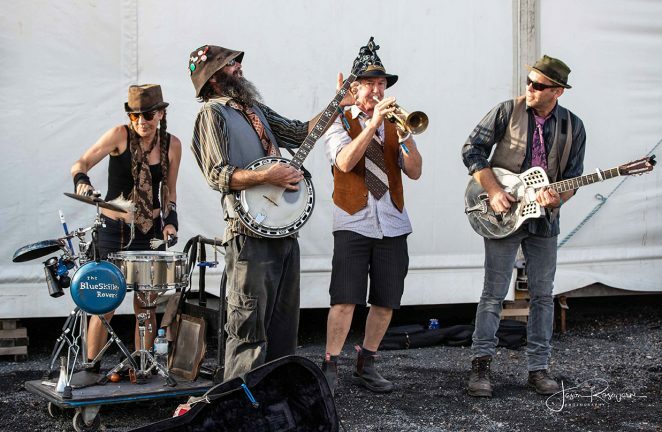 Thankfully many of the acts play multiple days, so it’s important for punters to do a little pre-festival planning. 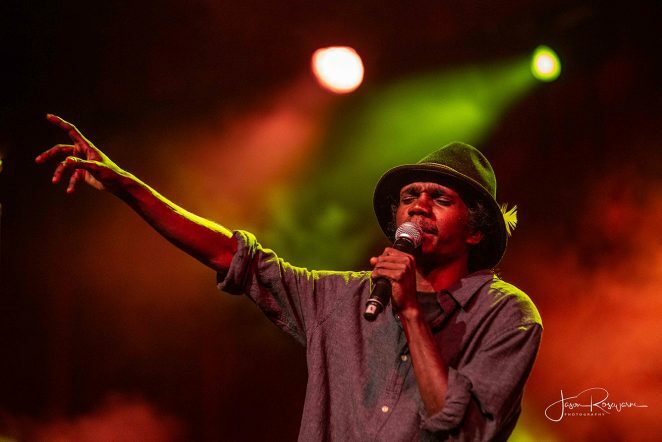 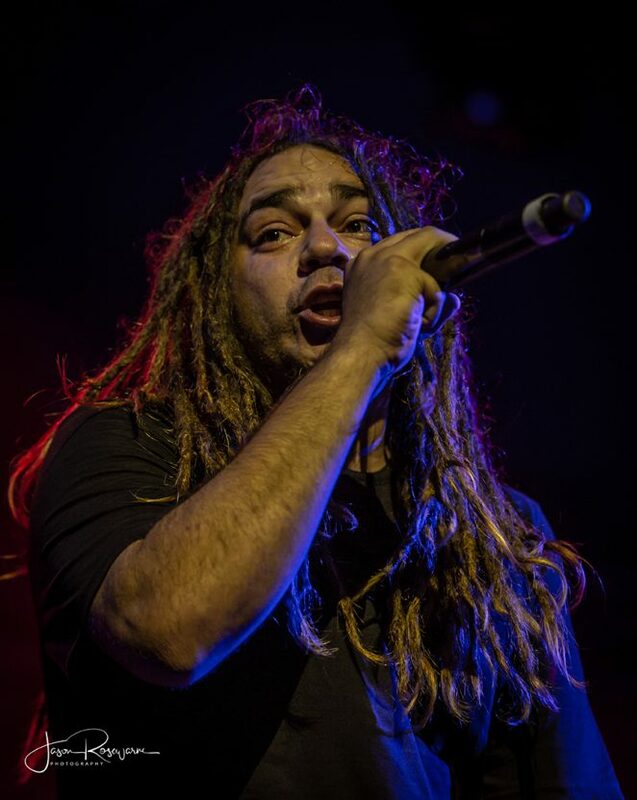 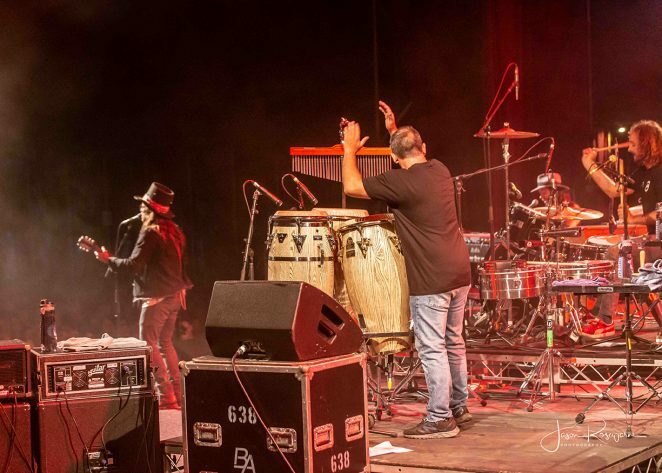 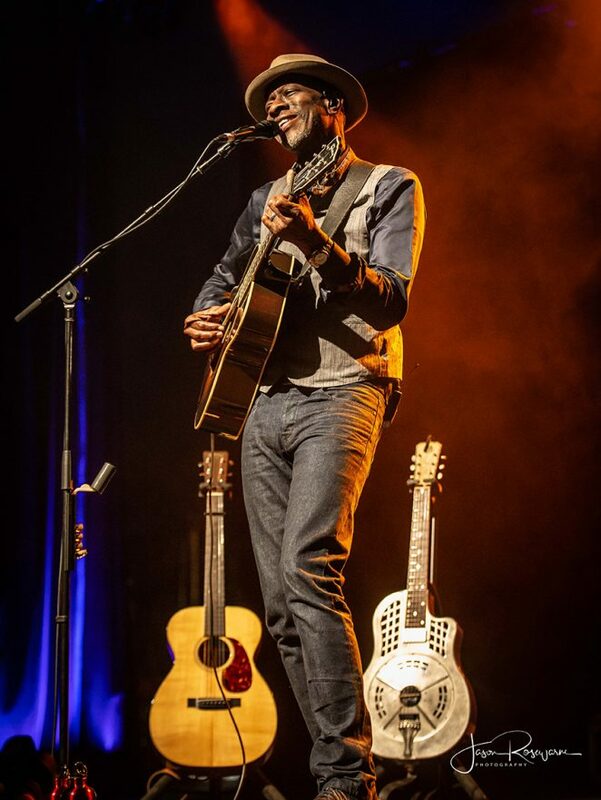 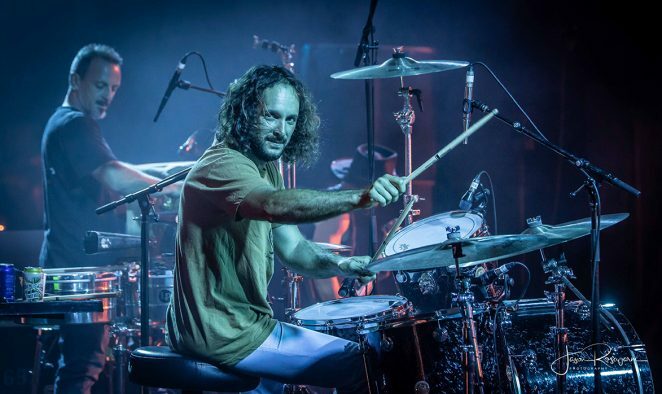 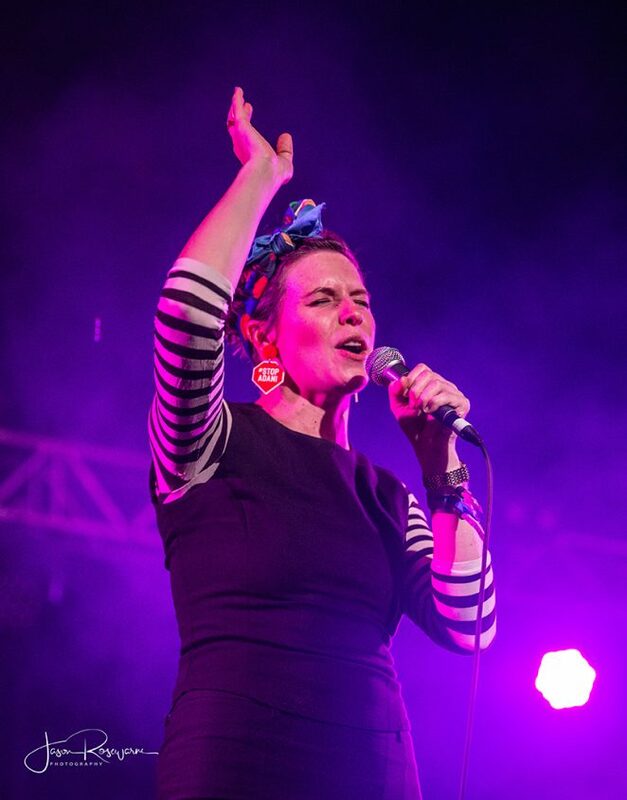 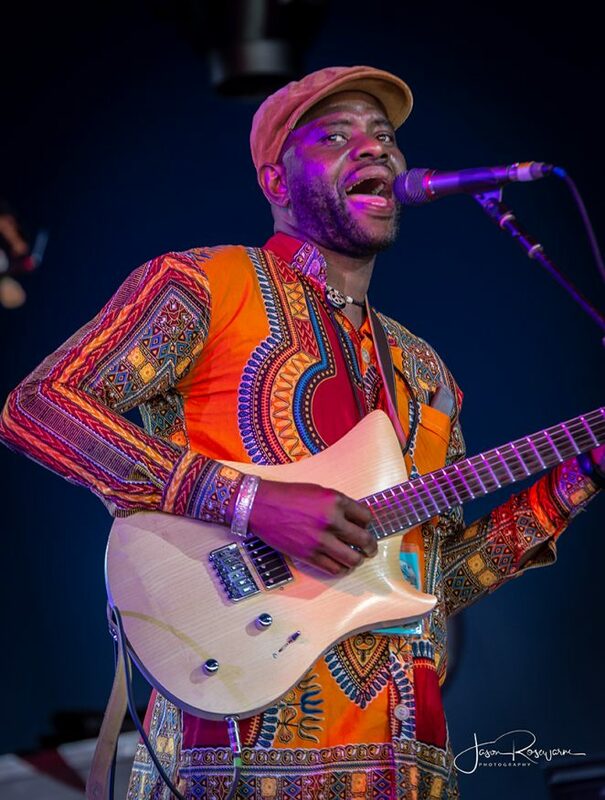 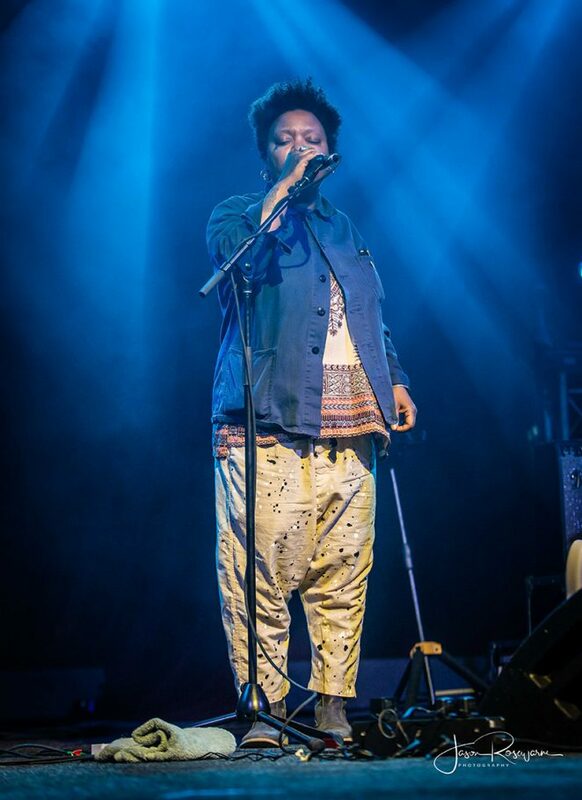 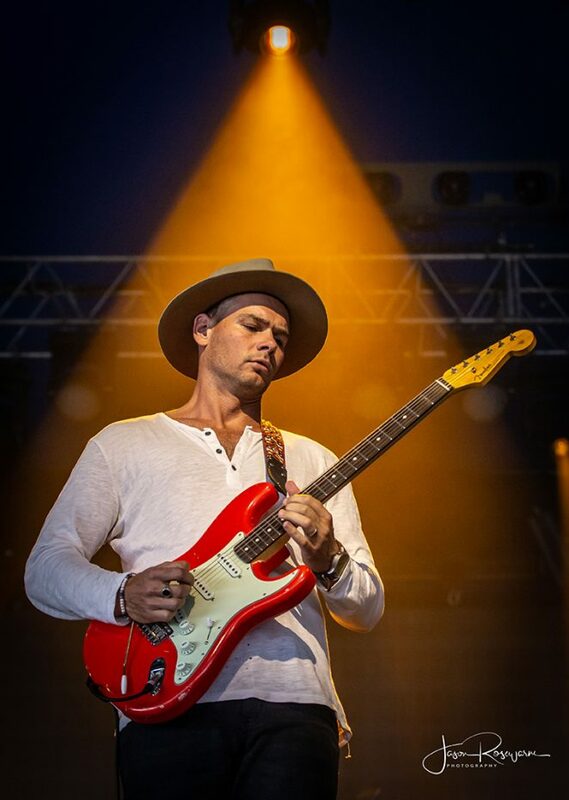 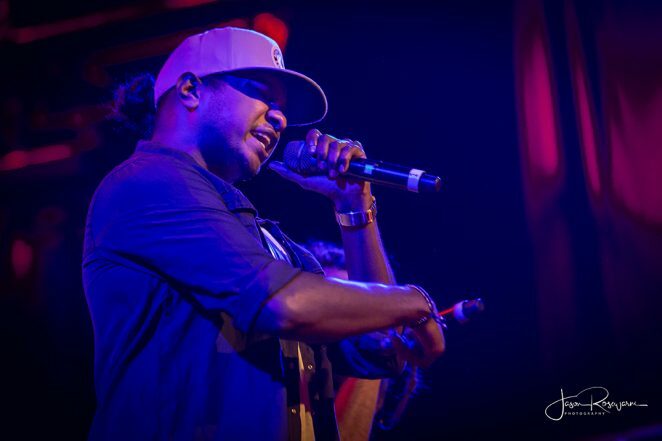 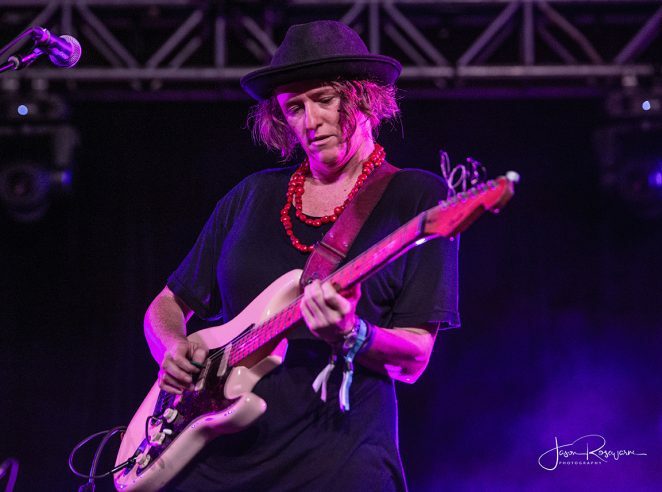 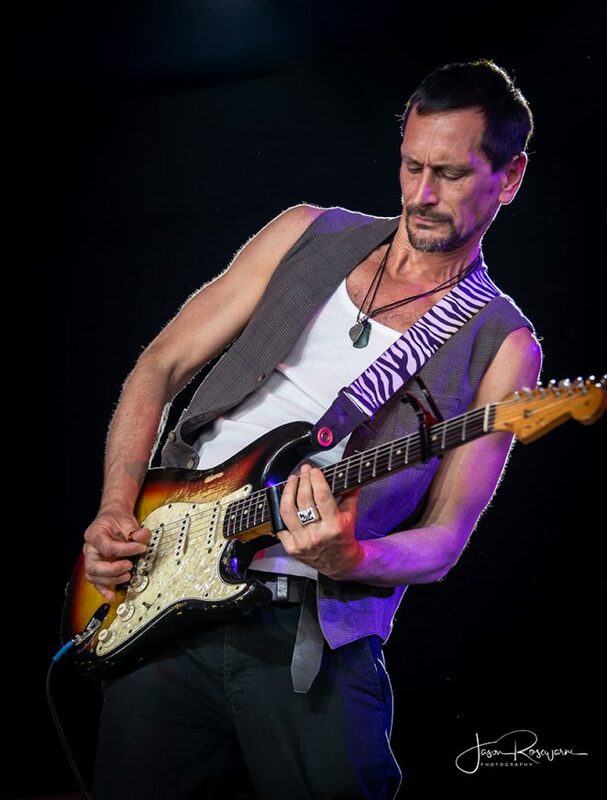 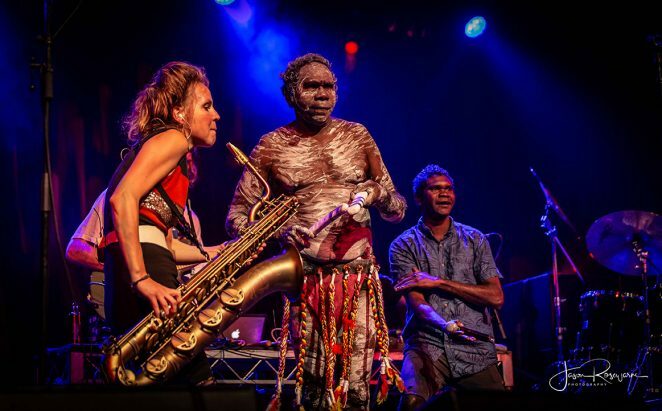 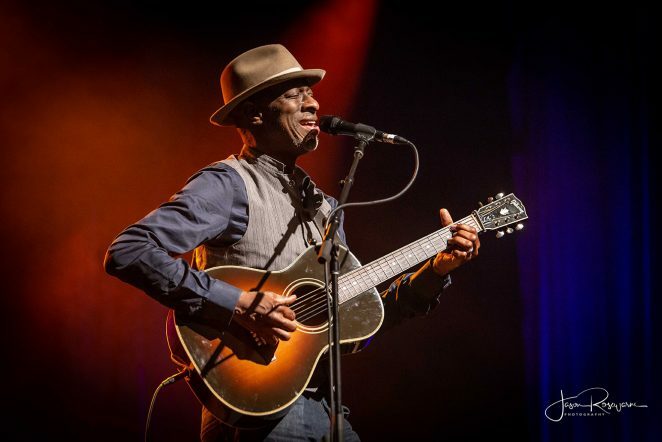 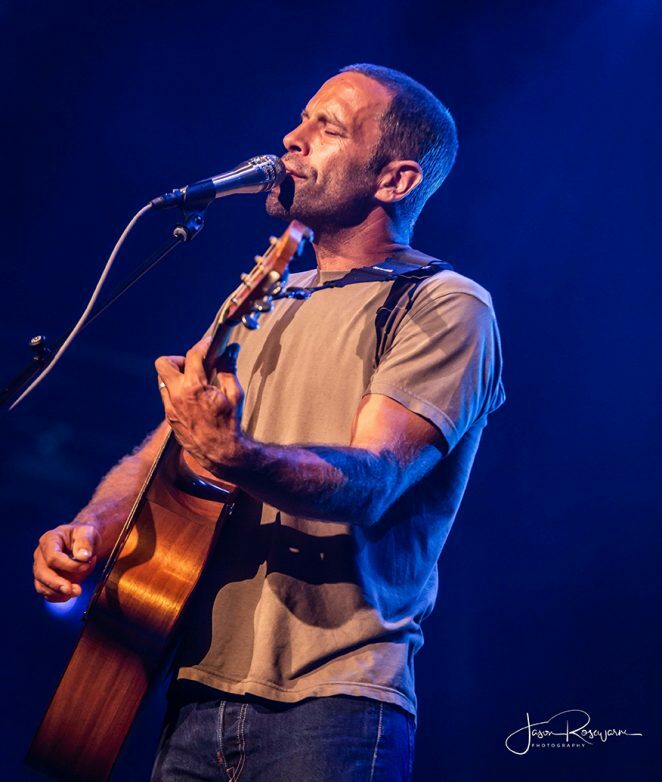 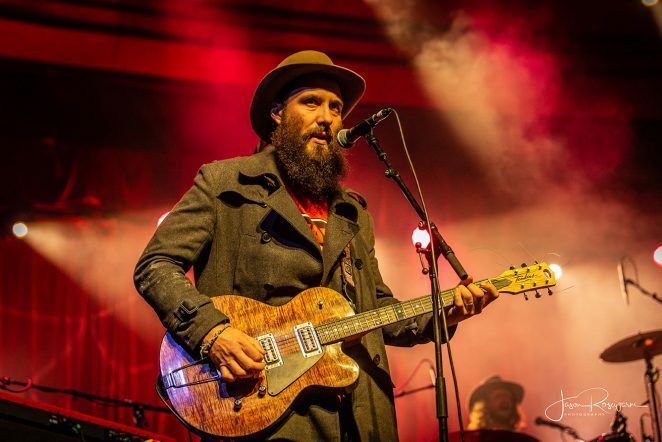 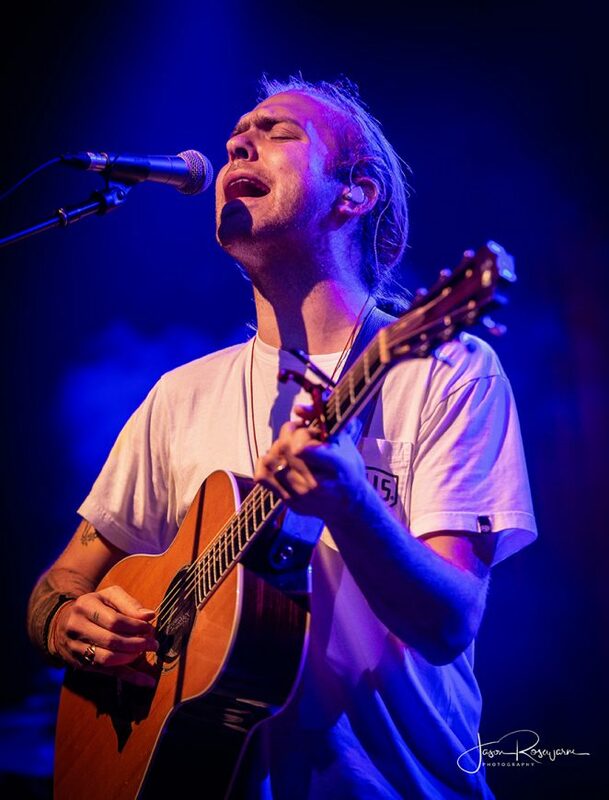 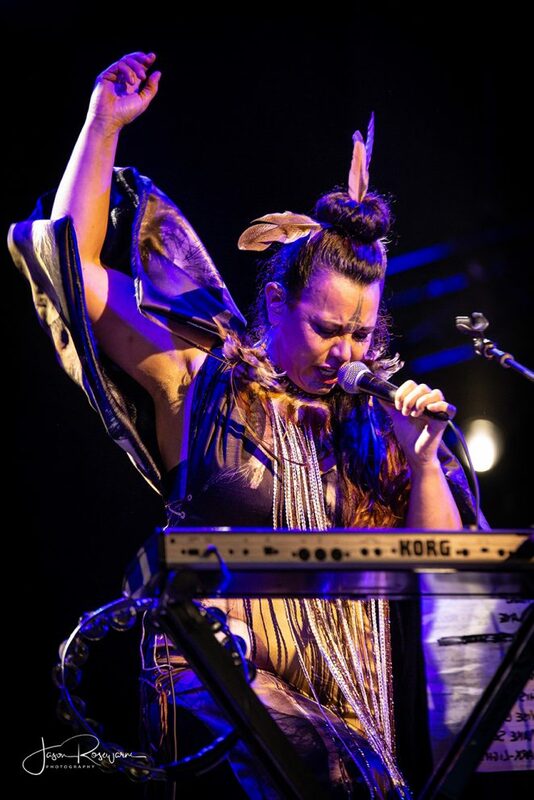 Australian musician’s first port of call was the Crossroads stage to catch the global music collective Playing For Change who are no strangers to Bluesfest. 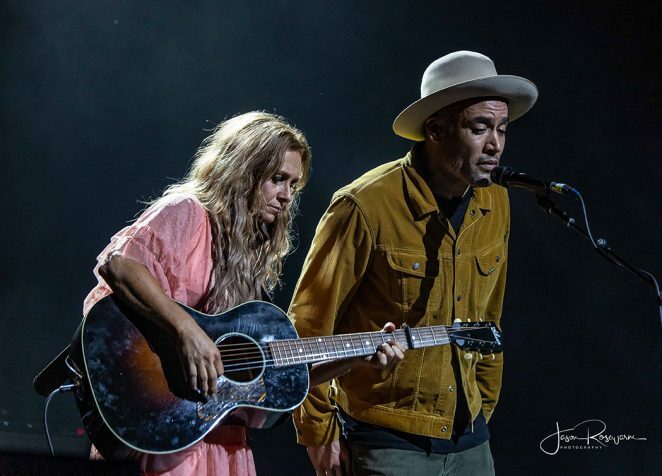 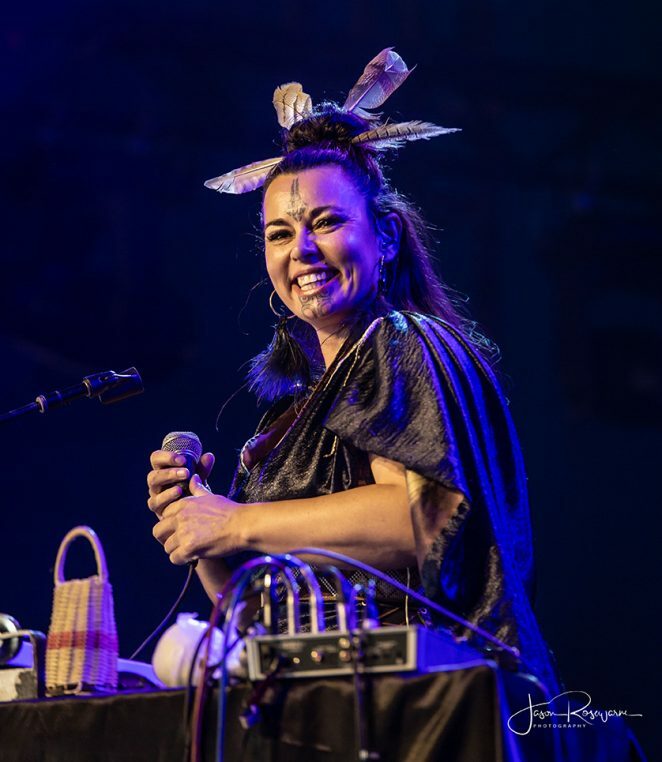 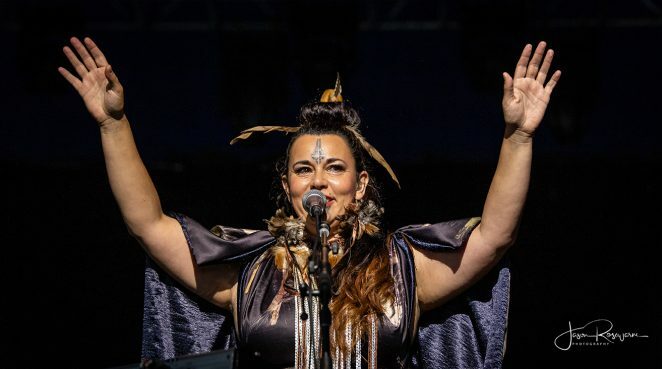 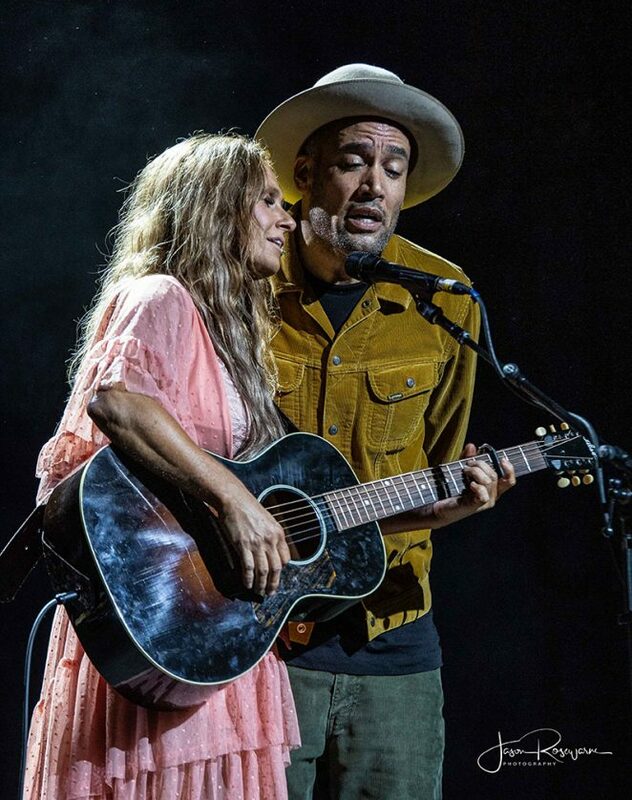 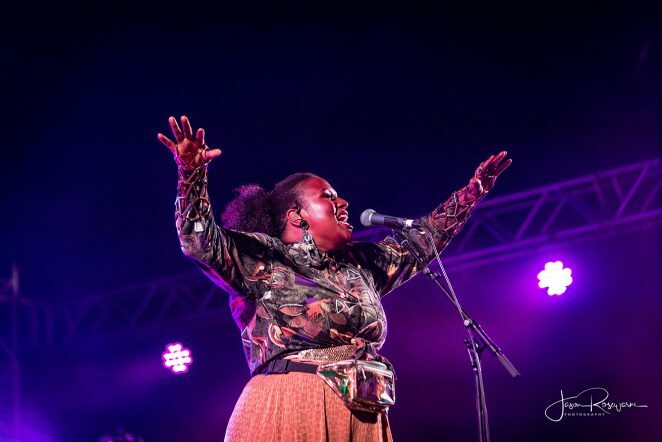 Making their Byron Bay debut was The War and Treaty featuring the inspirational voices of Michael and Tanya Trotter, performing tunes from their latest album Healing Tide. 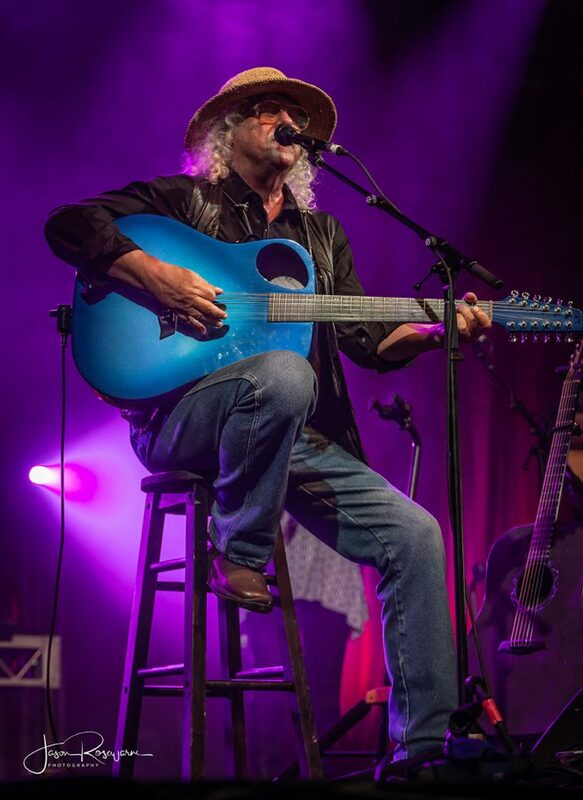 Famed for his appearance at Woodstock, pioneering singer songwriter Arlo Guthrie enthralled the Jambalaya stage crowd with his quirky life tales and tunes. 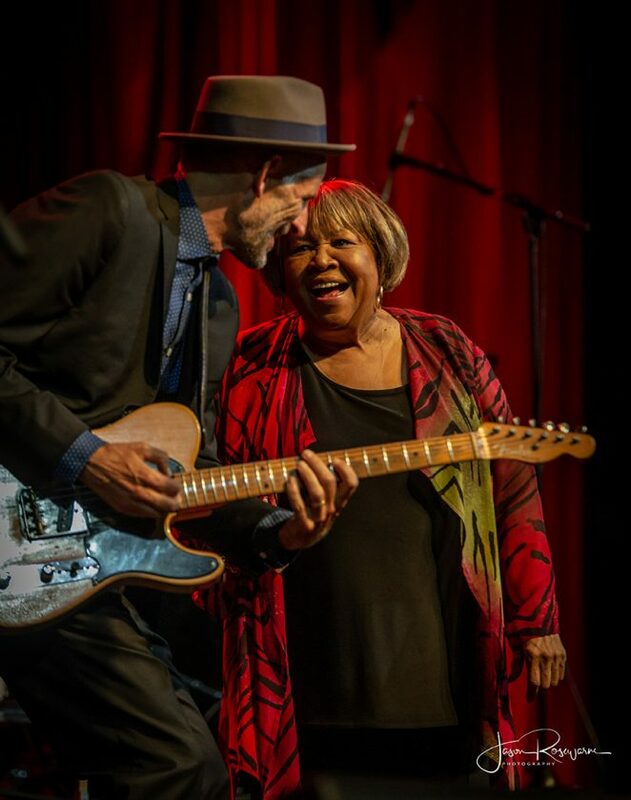 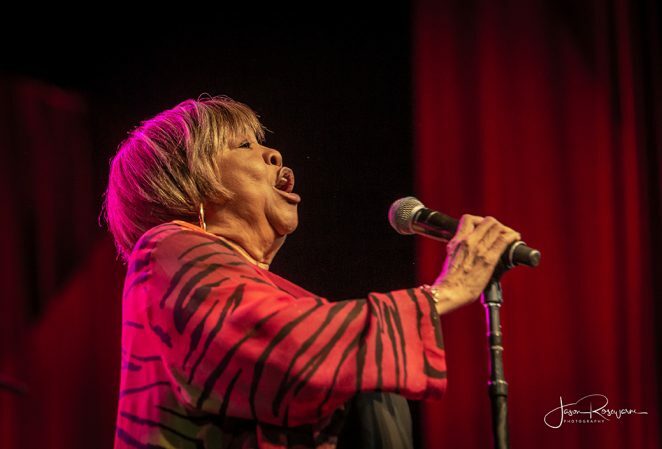 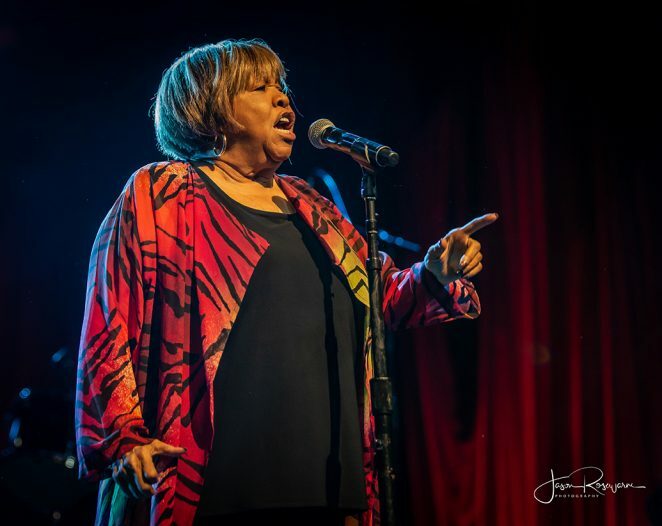 Following Arlo, Mavis Staples always commands attention and she effortlessly won the crowd over with her legendary songs and material from her soon to be released album We Get By, which was produced by Fellow Bluesfest regular Ben Harper. 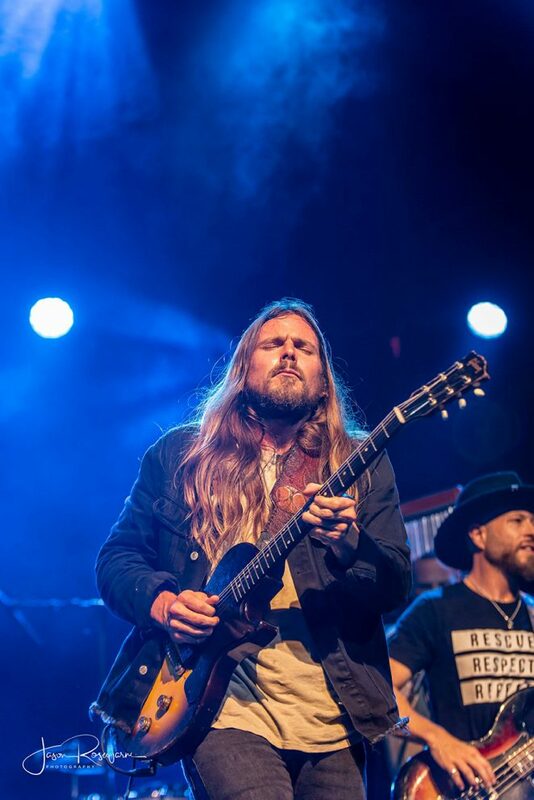 Dallas Woods won lot of hearts with his passionate performance. 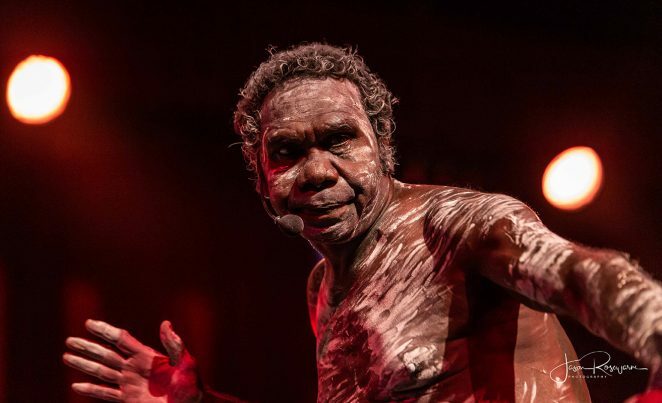 Representing The Kimberleys, Dallas gave the audience as much to think about as he did to dance to. 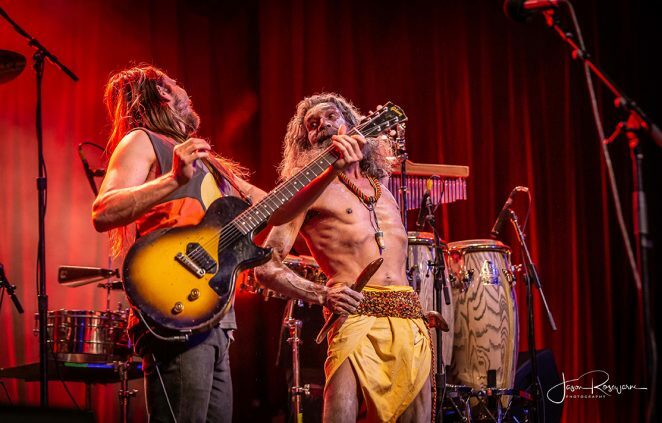 Nahko and Medicine For The People have developed their sound over the years and now output a much fatter sound than I recall the first time I witnessed them many moons ago. 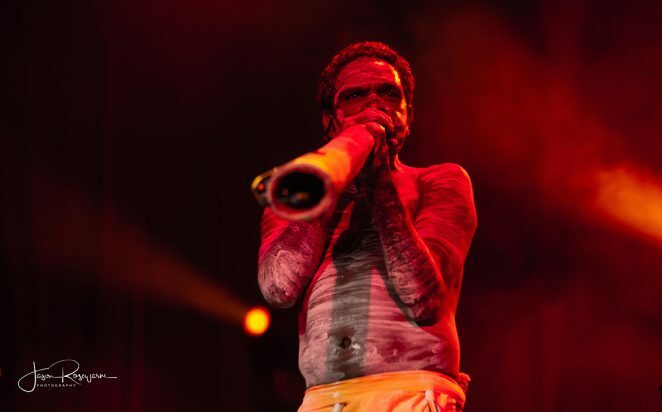 With their strong social messages and vibrant and uplifting rhythms, it’s no wonder they continue to build their tribal following. 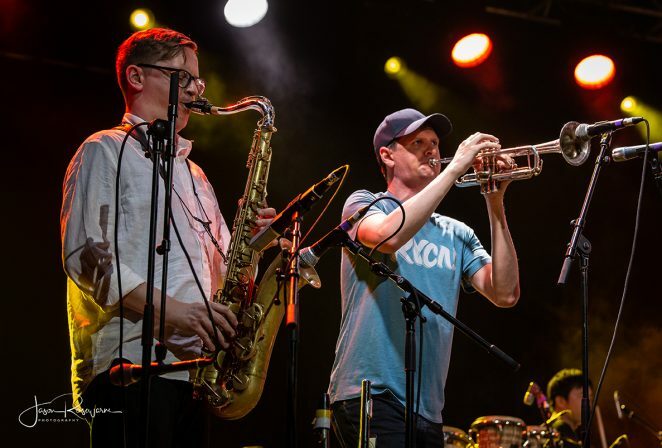 Snarky Puppy always enjoy playing to the Bluesfest crowd, an audience which still appreciates a fine extended drum and percussion solo and are willing to participate and indulge the band with complex clapping patterns. 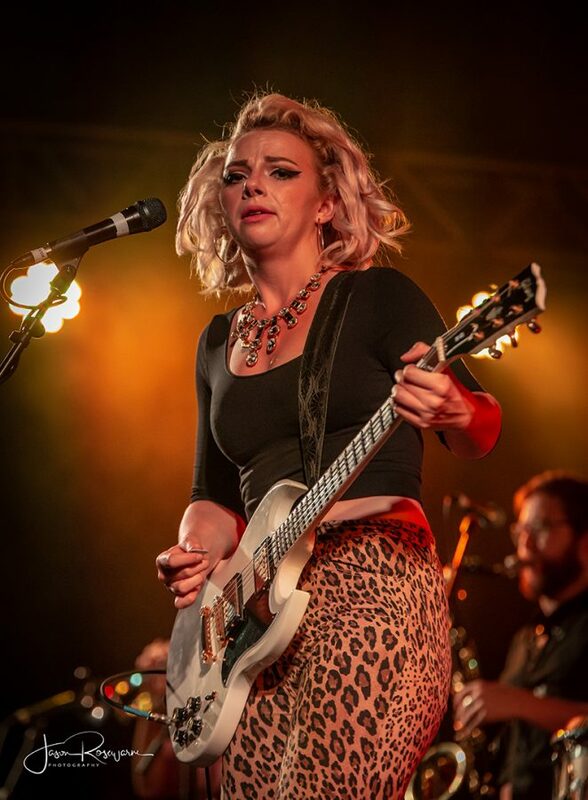 Kansas City’s Samantha Fish told crowd she was excited to be here and the feeling was mutual. 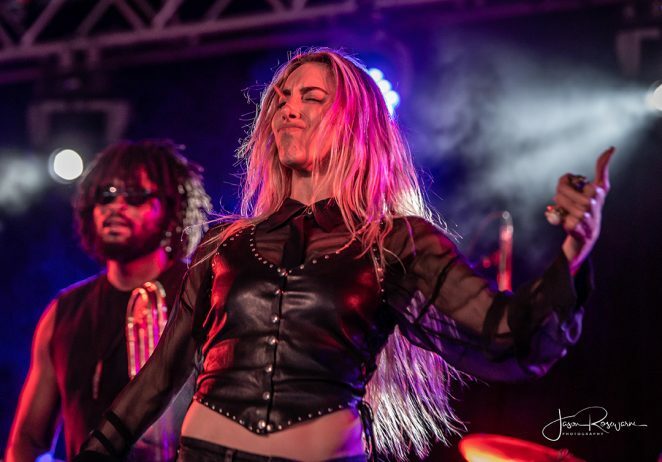 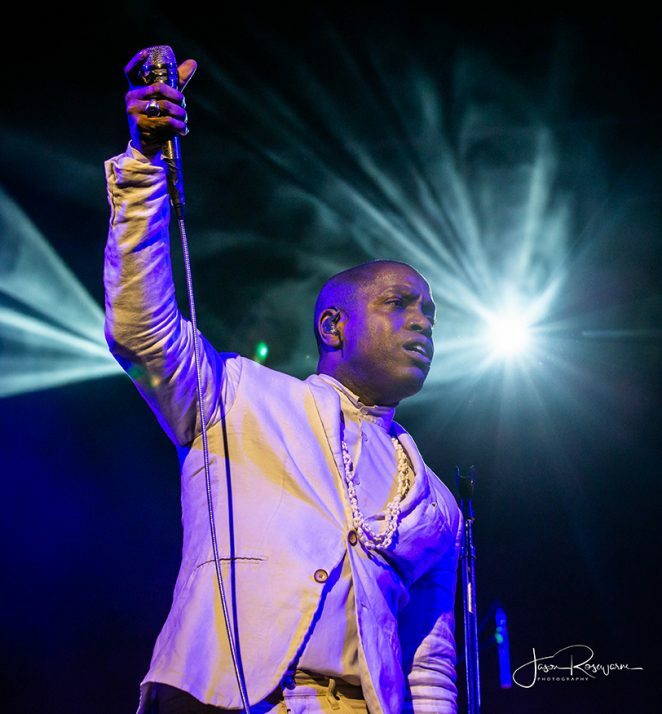 Featuring a two piece brass section and accomplished band, the powerful soul, blues and rock sounds coming off stage, made this performance something special. 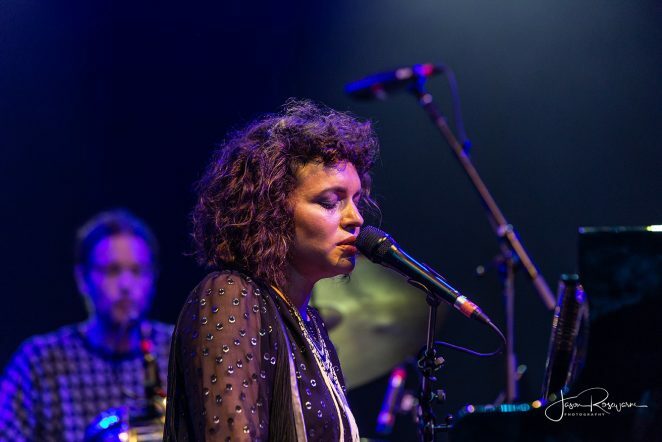 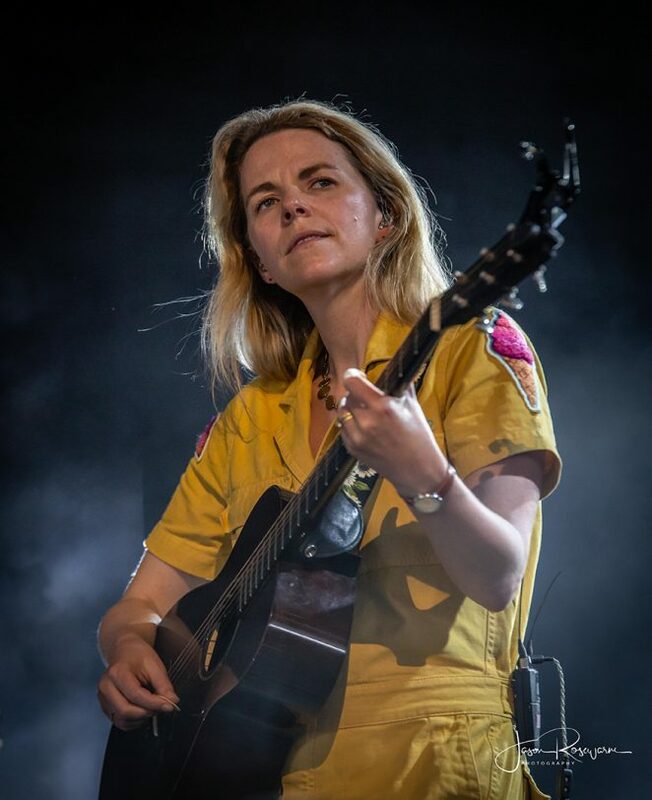 Playing tracks from her two most recent albums, Chills & Fever and Belle of the West, Fish has been concentrating more and more on her song craft of late and it’s paying off. 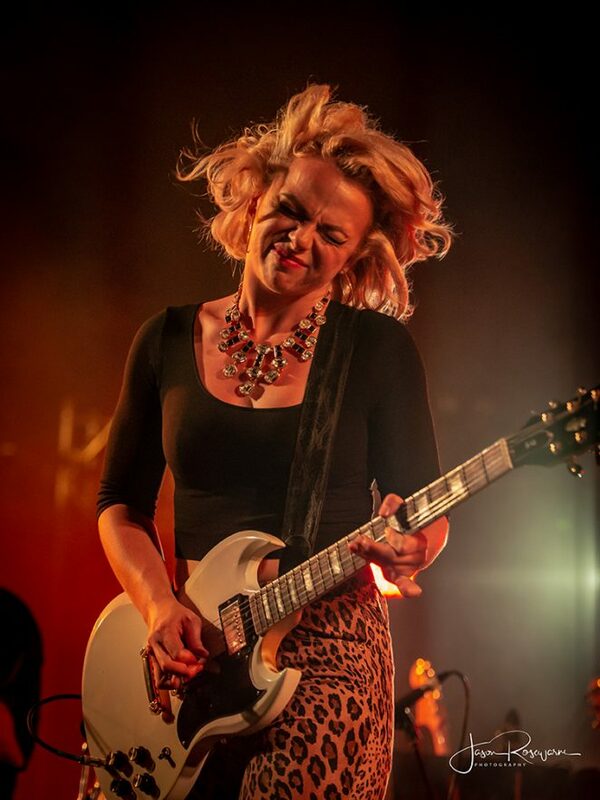 However it hasn’t stopped Samantha from breaking out in dynamic licks and hazy shreds often and to great effect. 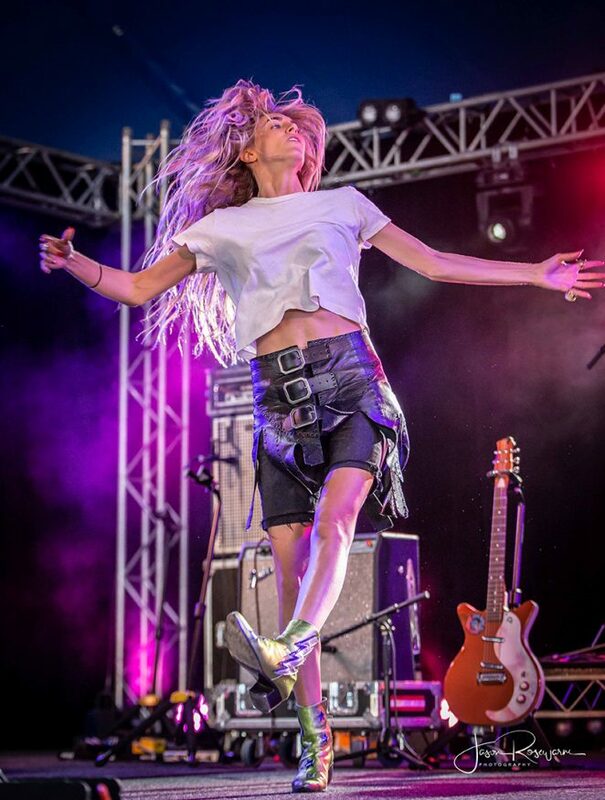 I can see Samantha’s audience growing with each show over the duration of the festival. 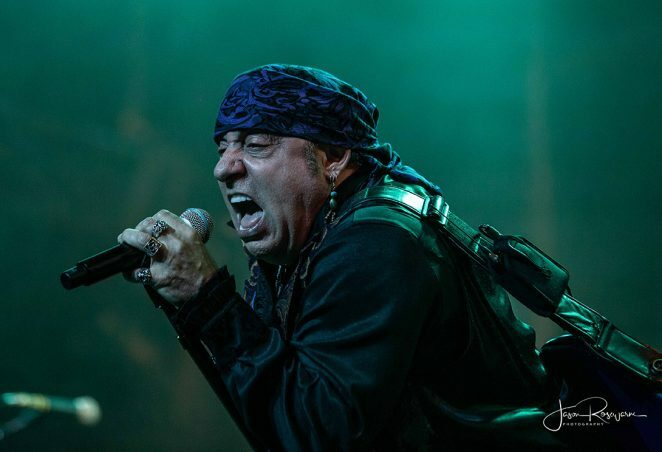 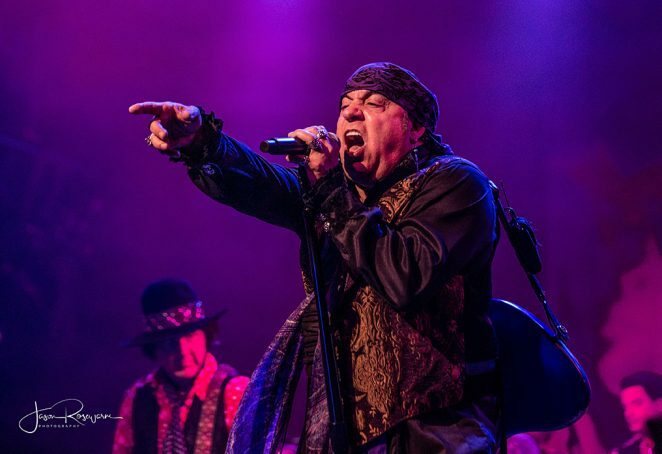 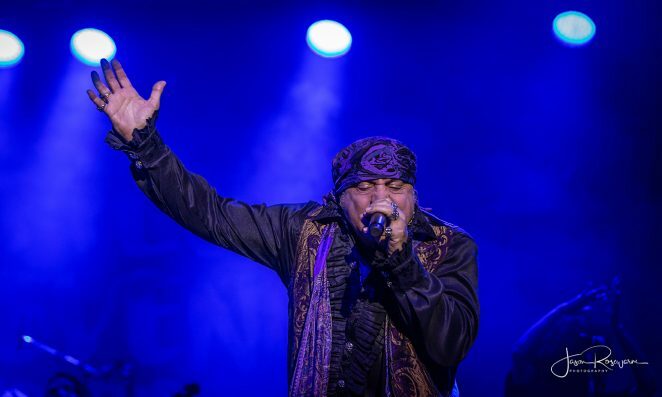 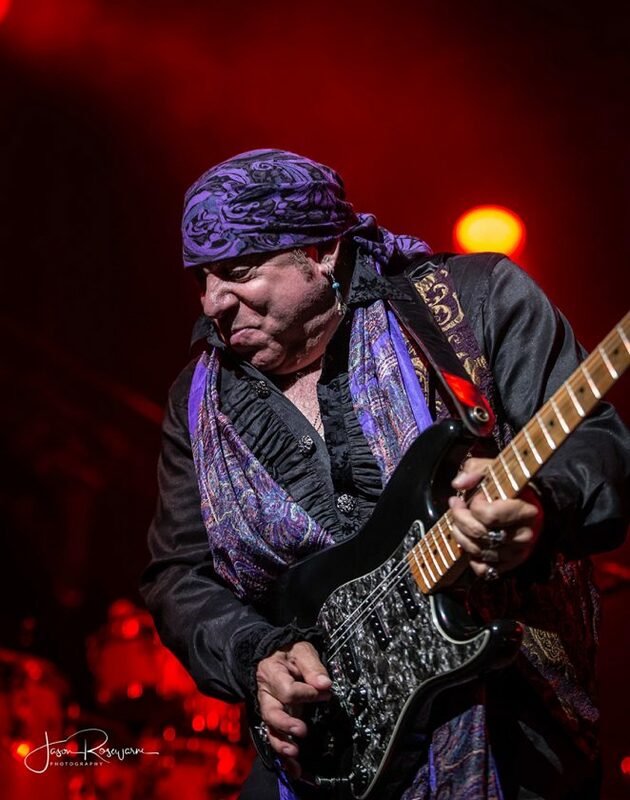 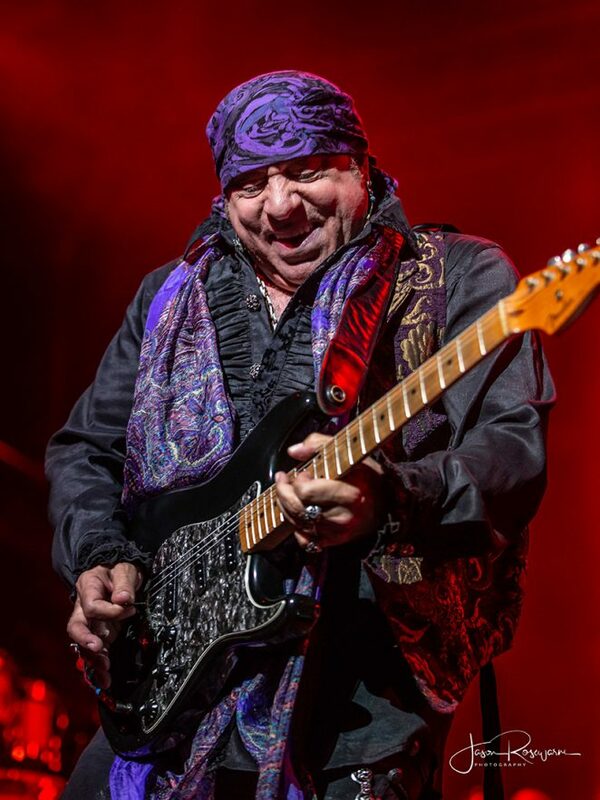 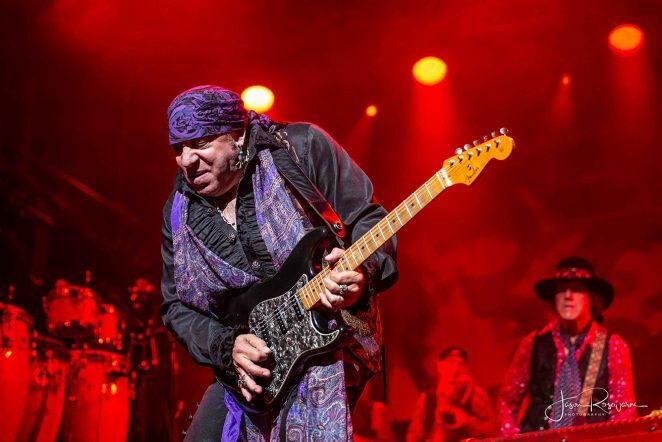 As we got into headliner territory, the crowd headed to the Crossroads stage to experience the huge sounds of Little Steven’s Disciples of Soul. 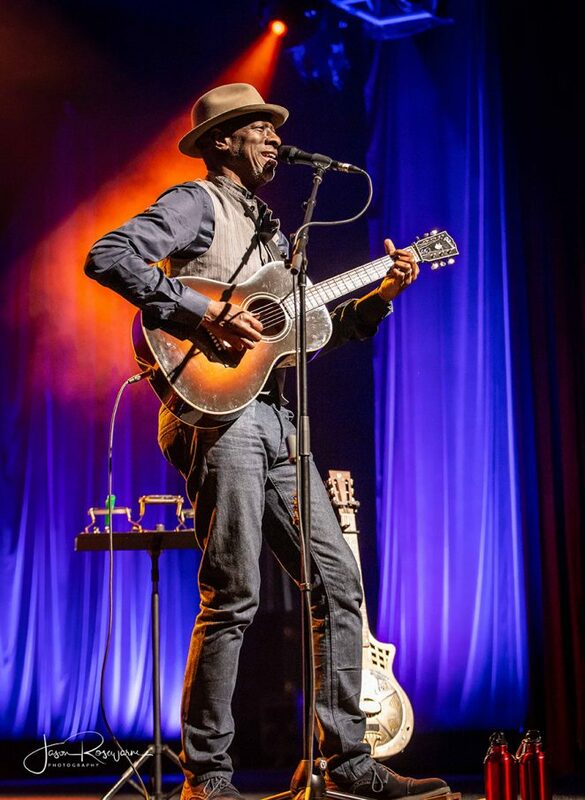 Opening with Sam and Dave’s Sweet Soul Music, there was never any turning back, a party was to be had. 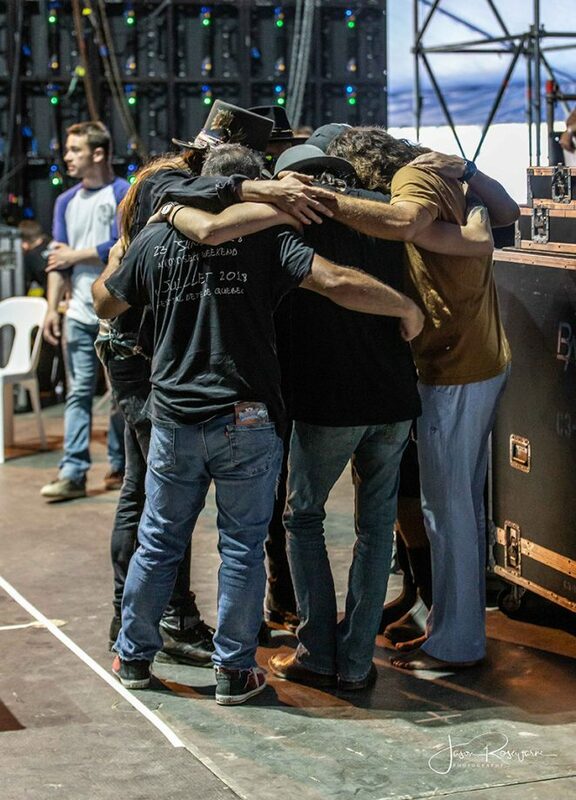 The iconic E Street Band member learned much from The Boss and held this congregation in the palm of his hand. 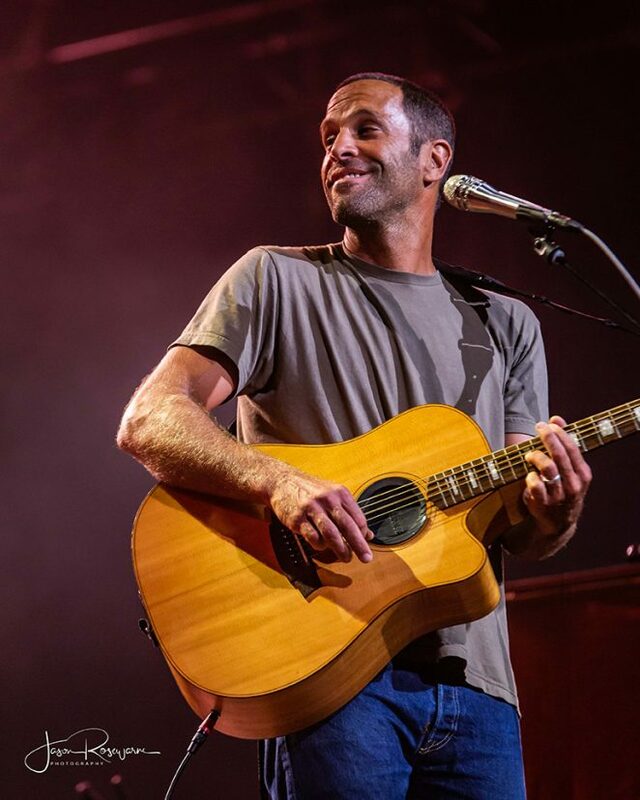 Steven suggested that he used to be much more political on stage but there is now so much of that in your face, that music is everyone’s salvation. 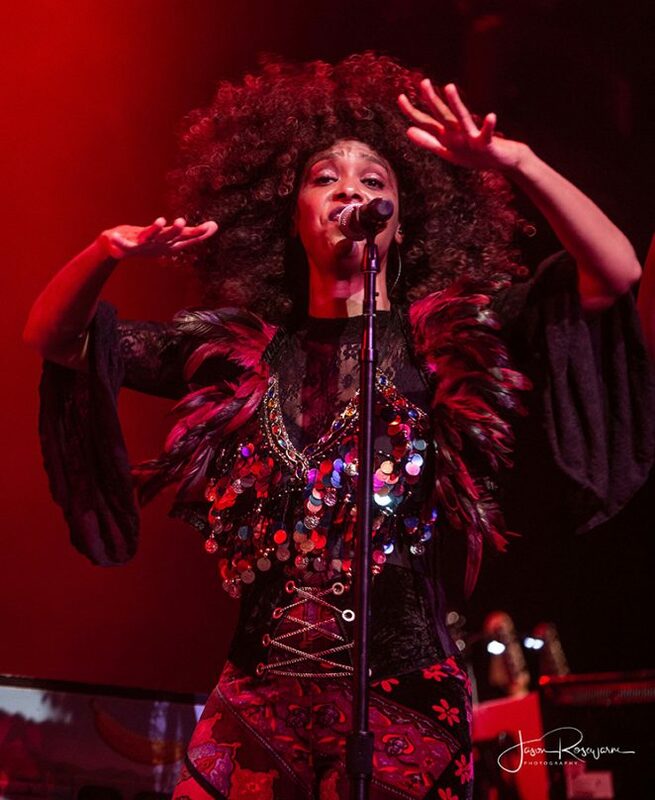 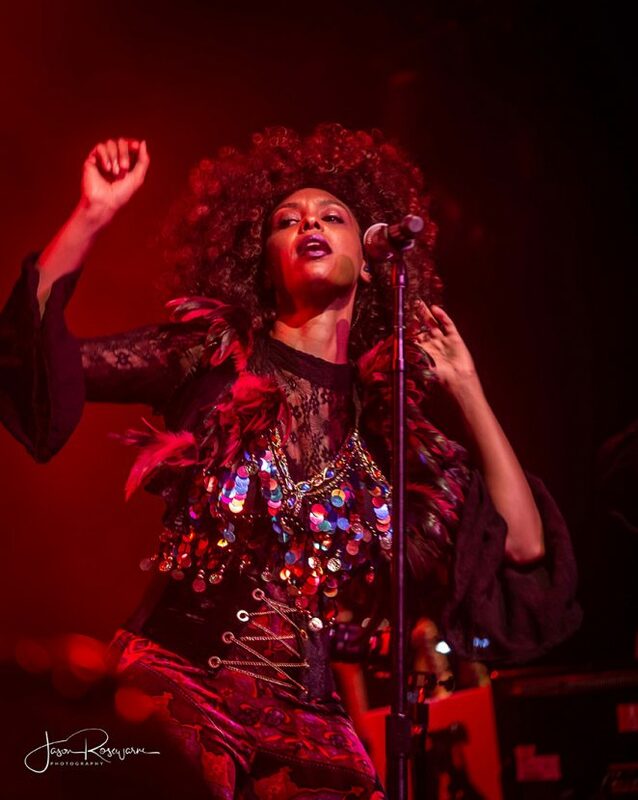 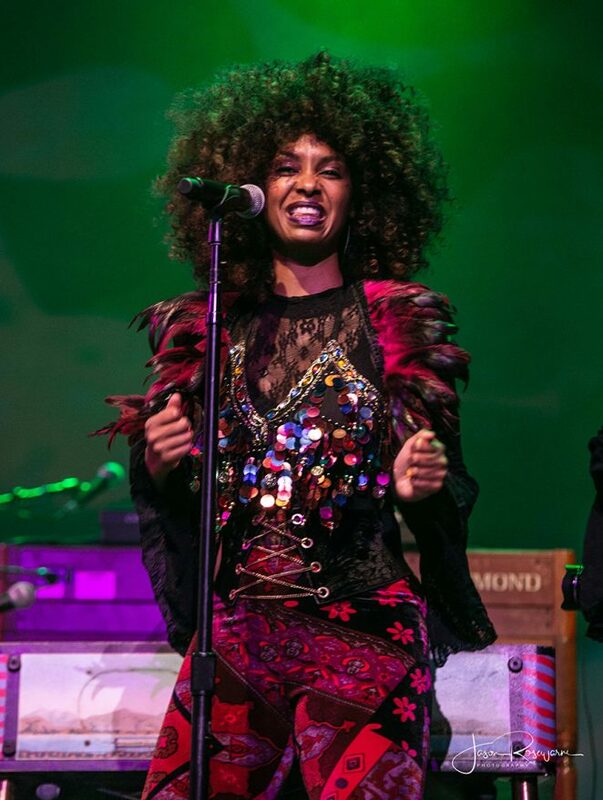 The band was made all the more exciting due to the frantic dancing and extraordinary backing vocals of Jessie Wagner (Kid Rock, Lenny Kravitz, Chic), Sara Devine (Alicia Keys, Mary J Blige) and Tania Jones. 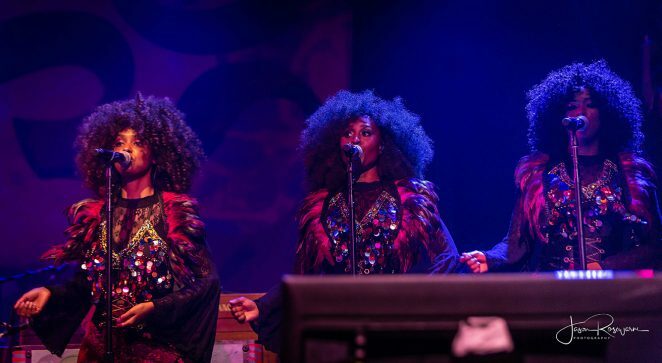 The Disciples of Soul play again on Saturday and you don’t want to miss them. 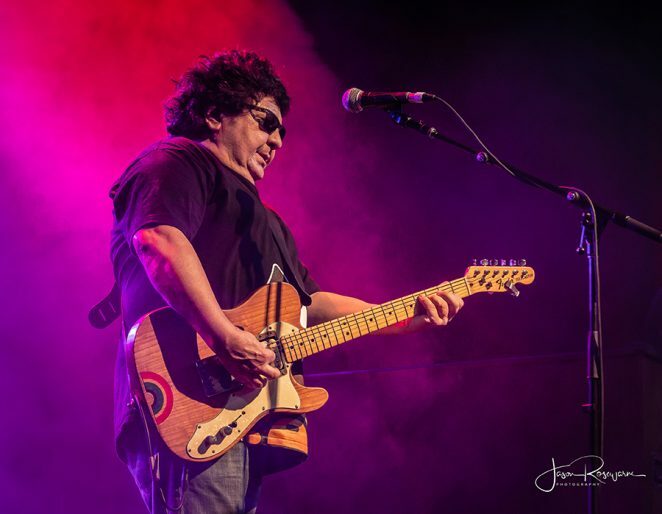 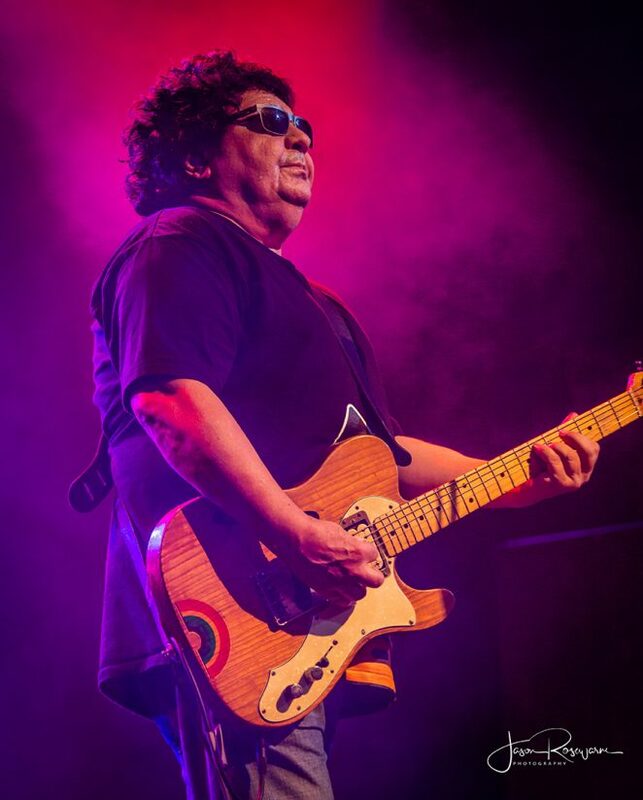 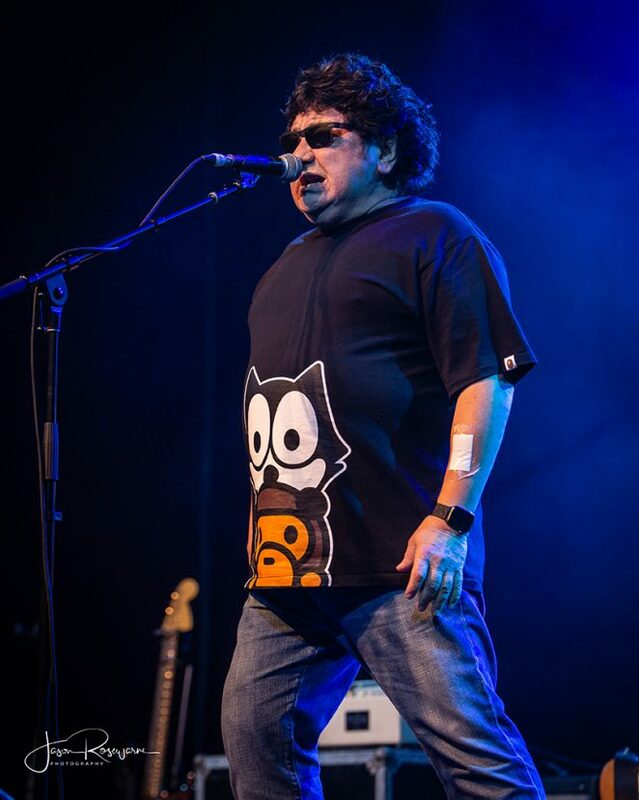 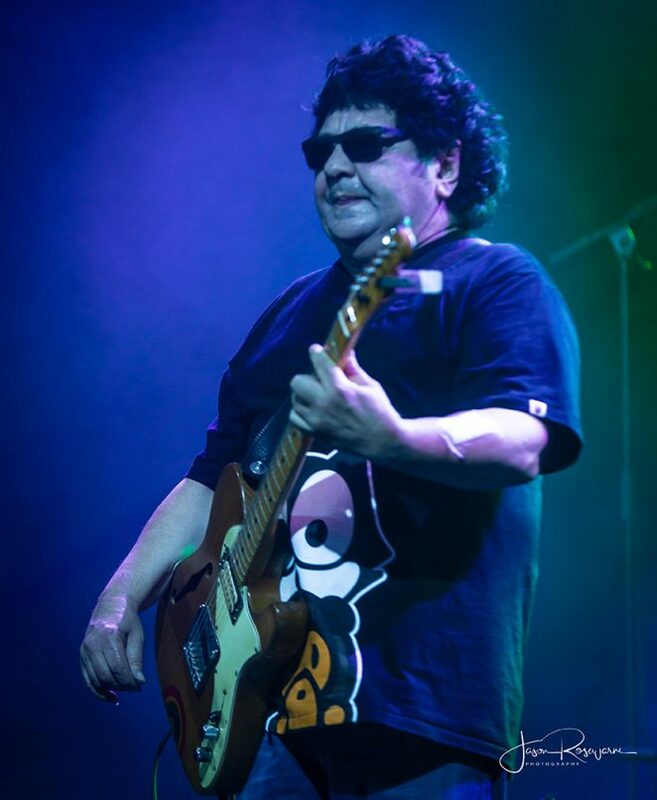 Over on the Jambalaya stage Richard Clapton was putting in a particularly powerful, hit-laden show in front of a packed tent. 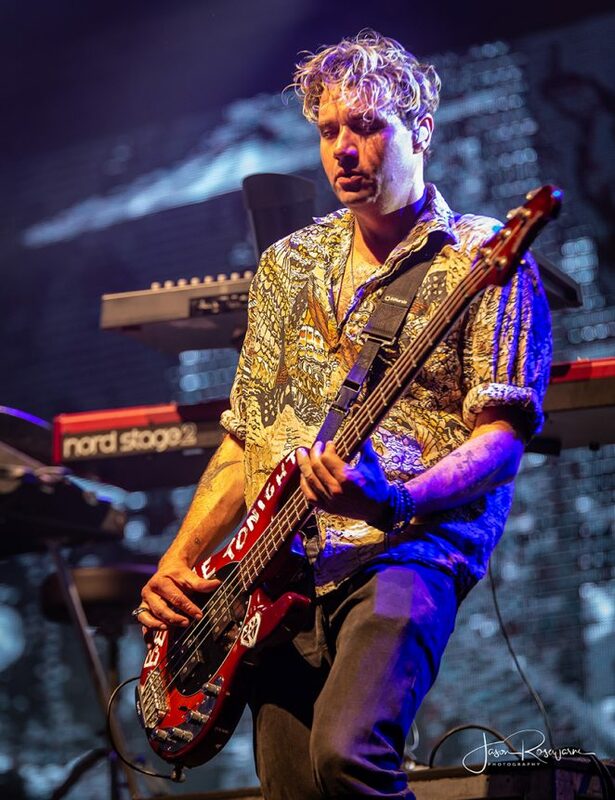 Mention must be made of the sound personnel on all stages too, the PA systems are pumping out gorgeously low bottom ends and sweet, sweet mids. 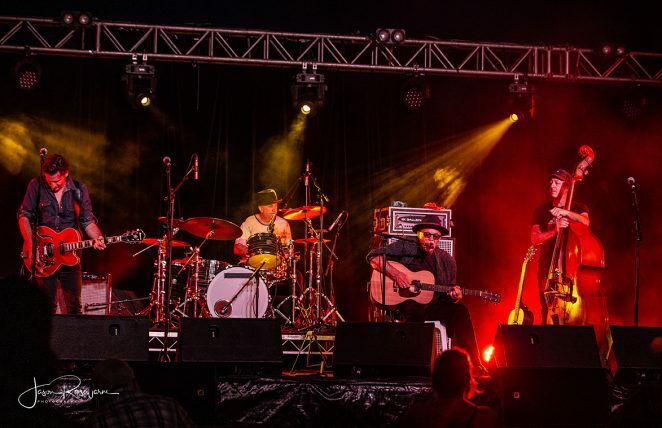 Returning to Bluesfest, Elephant Sessions create a moody blend of neo-trad, folk rock with appeal on so many levels, another act you need to make time for over the next few days of the festival. 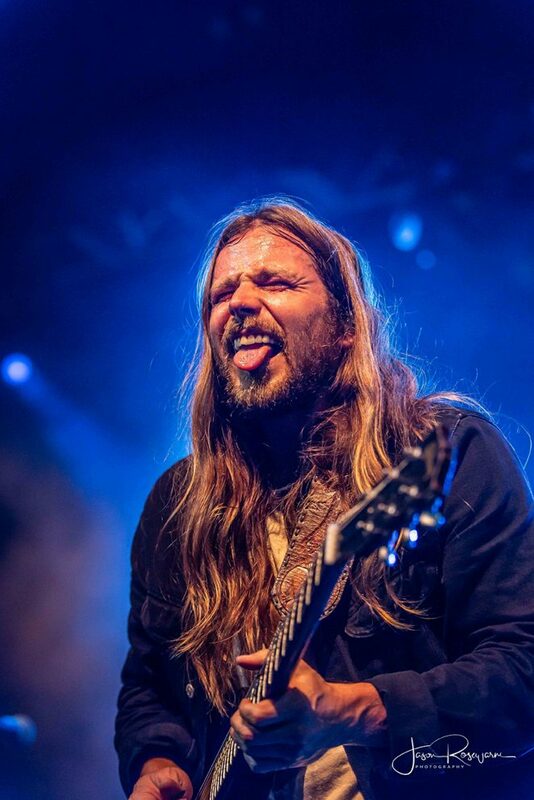 It’s Bluesiest’s 30th birthday and the party has well and truly begun. 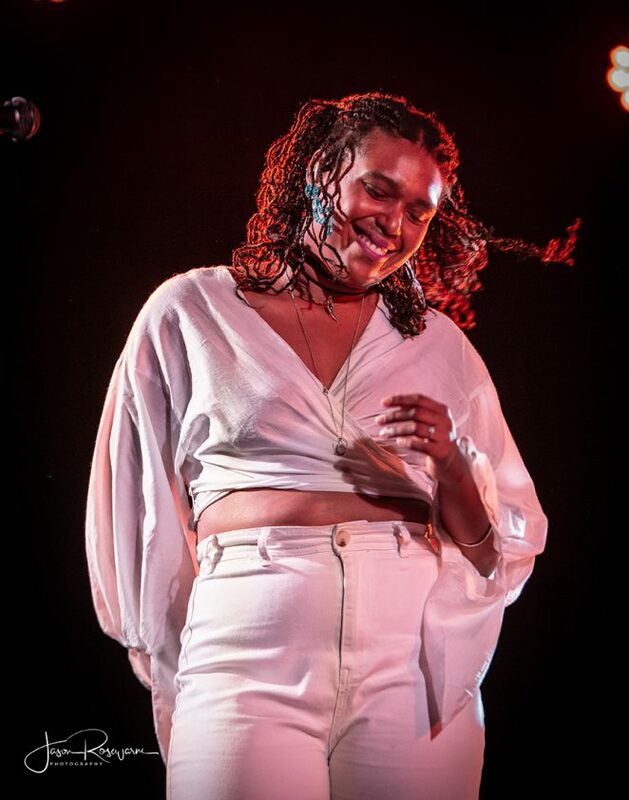 Exploring freedom, identity and gender with an approach that has become uniquely her own, Hunter arrived in mid-2018 to rapturous critical acclaim. 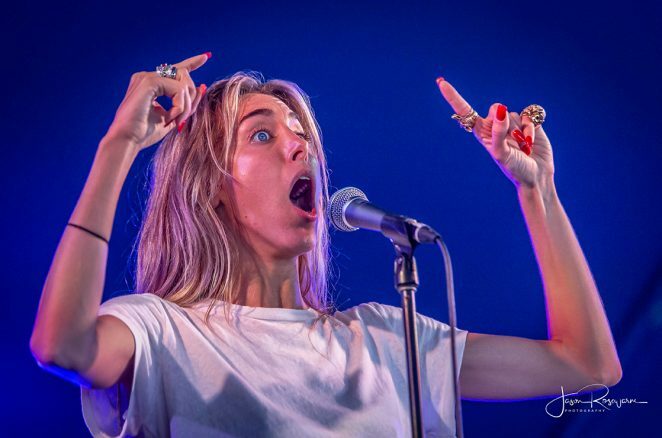 Pitchfork fawned over it’s “remarkable evolution” which “pushes her artistry to another level” while the Guardian could only sit back and pronounce it as “glorious and triumphant”. 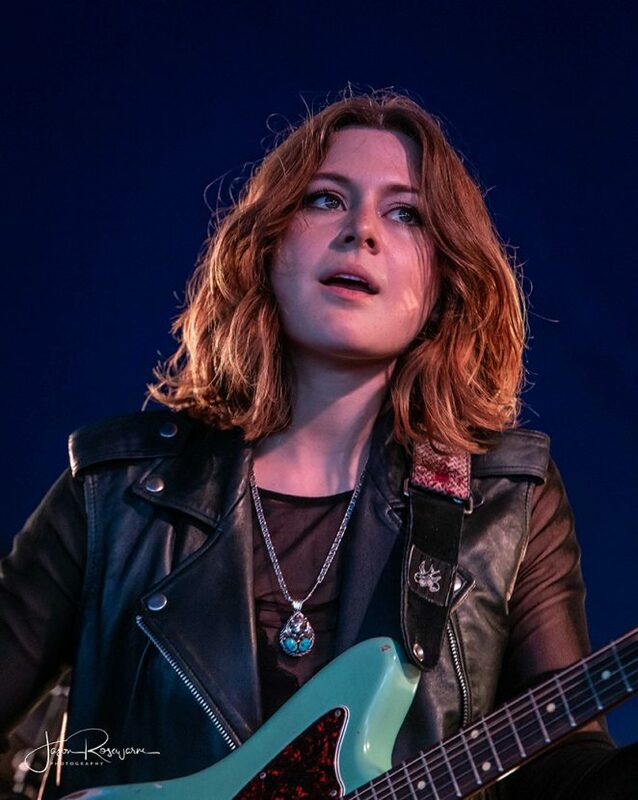 Calvi’s signature vocals, so bold and striking, permeate the record as they dart and weave around her dazzling guitar playing and synchronize perfectly with world class accompaniment supplied by Portishead’s Adrian Utley (keys) and The Bad Seeds’ Martyn Casey (bass). 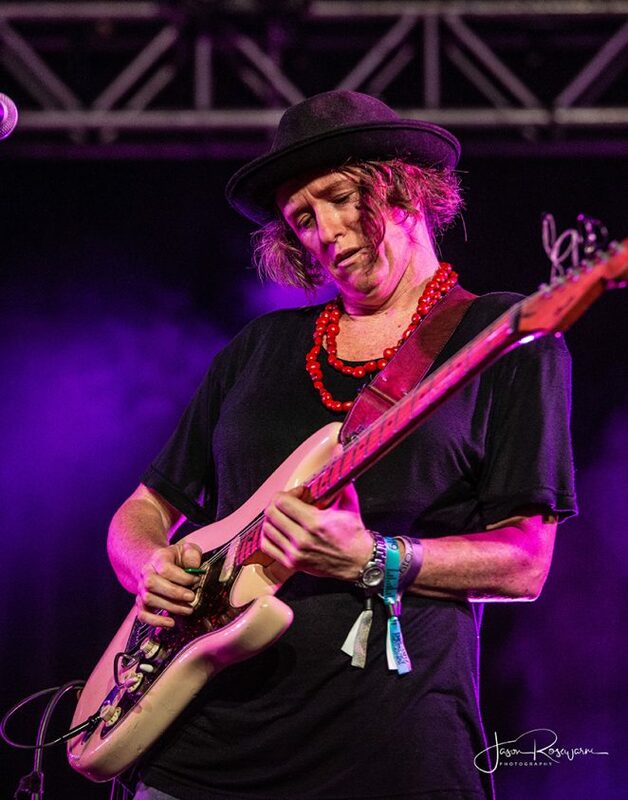 The third chapter of Calvi’s sparkling career to date, Hunter, joins 2011’s Anna Calvi and 2013’s One Breath as evidence of a generational talent. 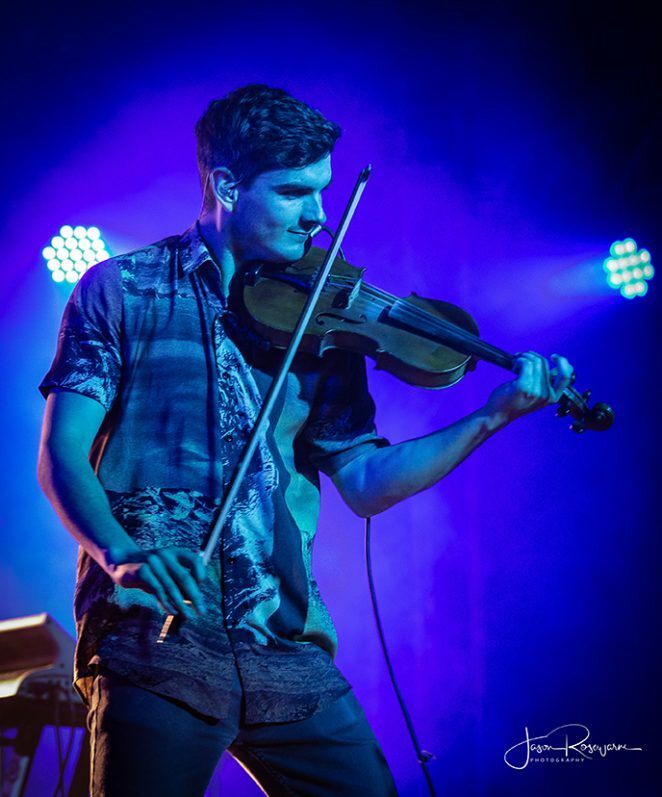 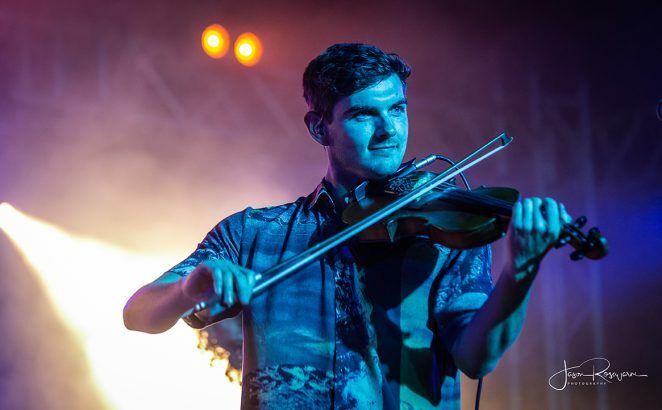 A student of the guitar and violin, Calvi first came to prominence after catching the attention of legendary UK label Domino Records at an early gig. 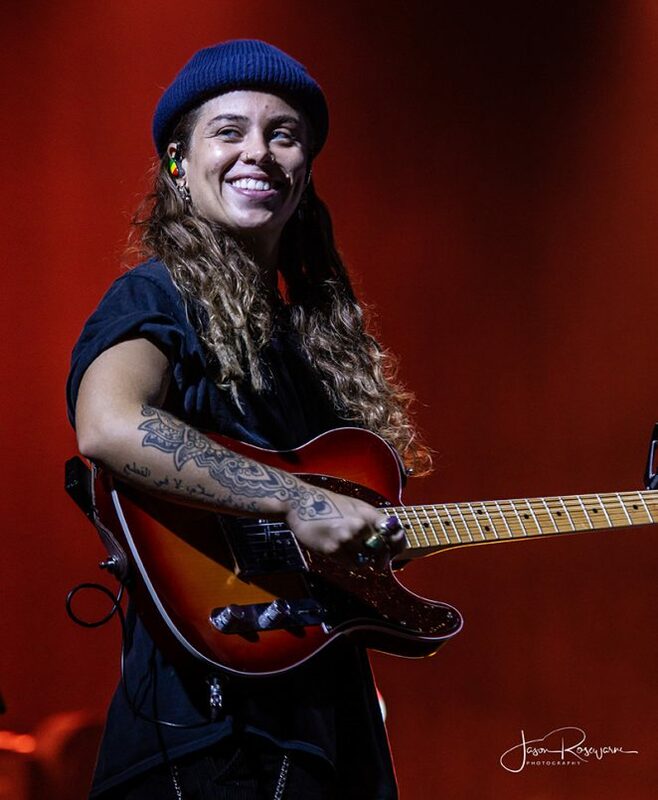 Her debut album followed, with the arresting first single Desire providing the perfect bedrock for an ascending career. 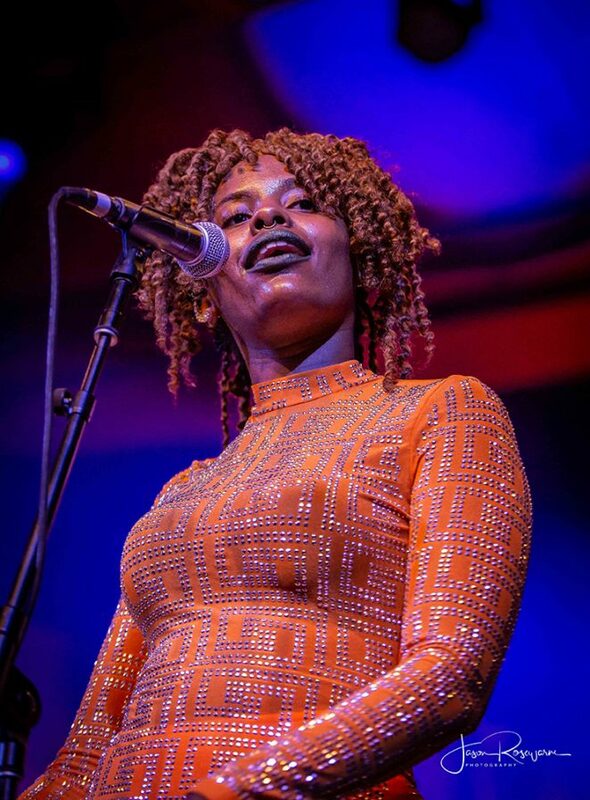 Legends like Brian Eno and David Byrne started taking note and it wasn’t long before she could start calling herself a multiple Mercury Prize nominated artist. 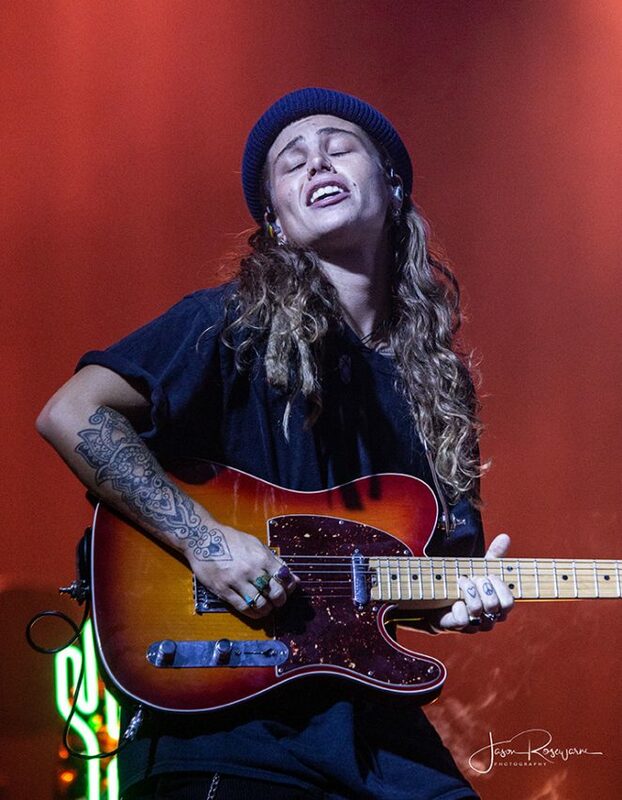 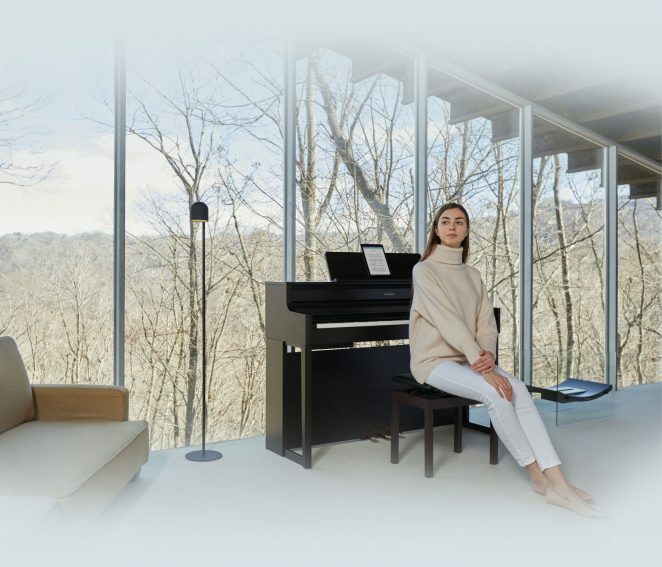 Hunter, with it’s singles ‘Don’t Beat the Girl Out of My Boy’, ‘Hunter’ and’ ‘As A Man’ truly allows Calvi the opportunity to explore her myriad gifts. 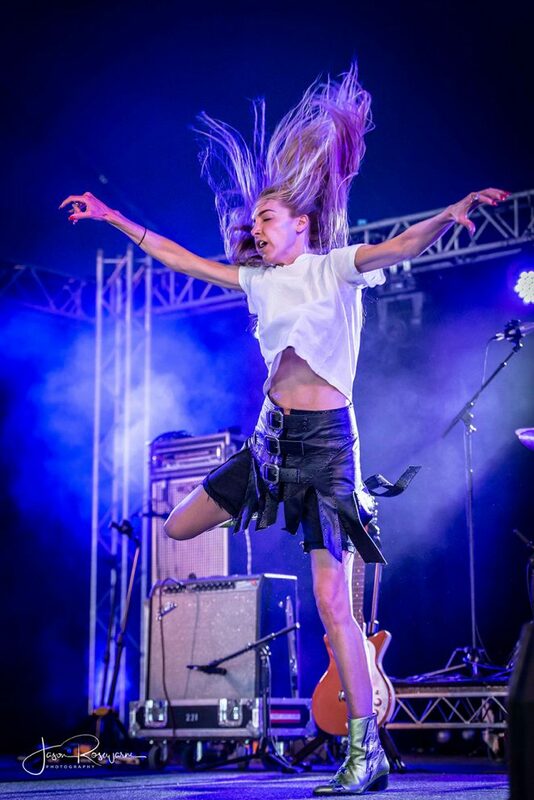 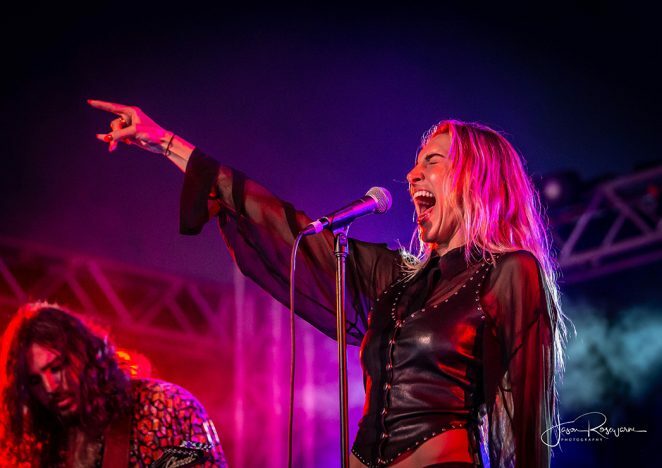 Working with famed producer Nick Launay (Nick Cave & The Bad Seeds, Midnight Oil), Calvi lets loose something wild and passionate that brings the listener closer to her renowned on-stage energy than ever before.